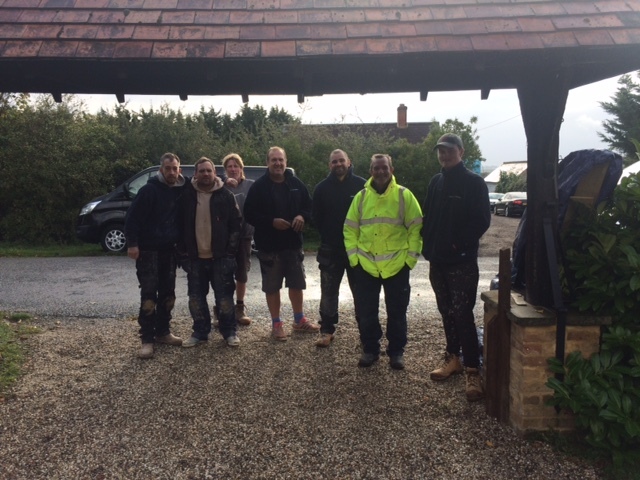 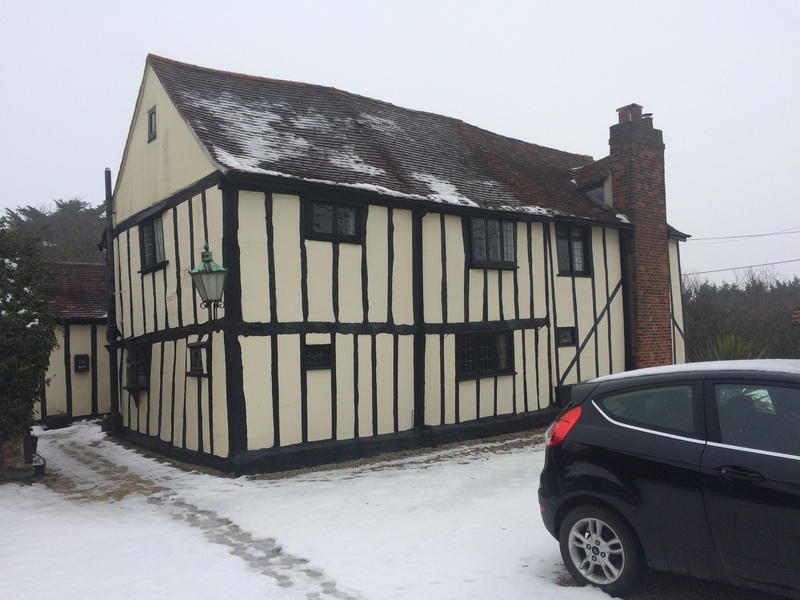 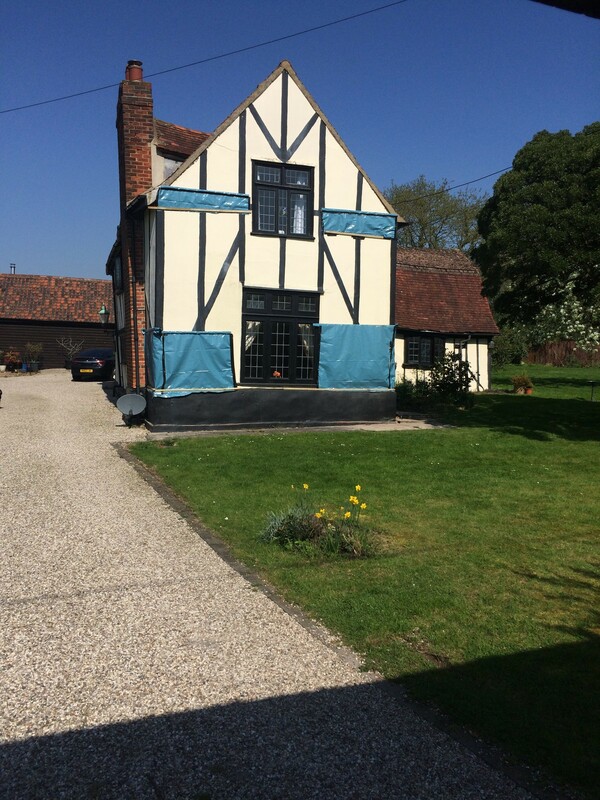 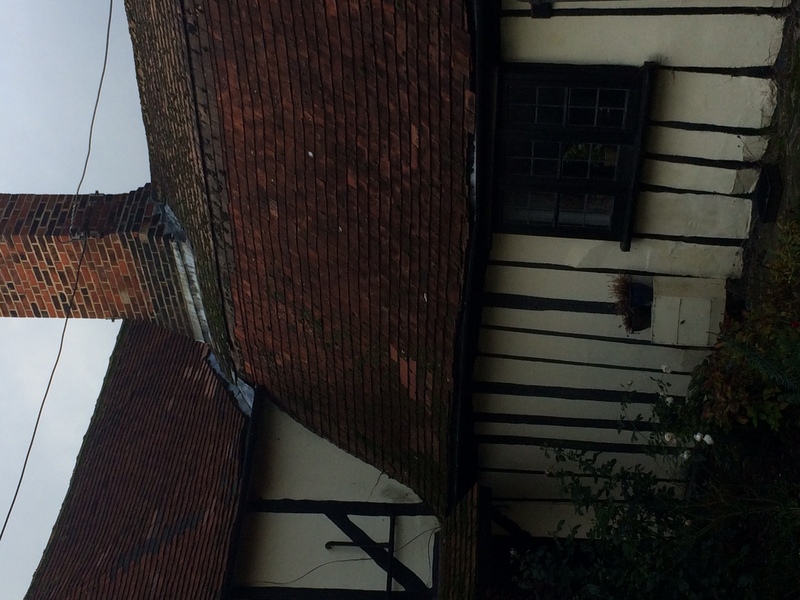 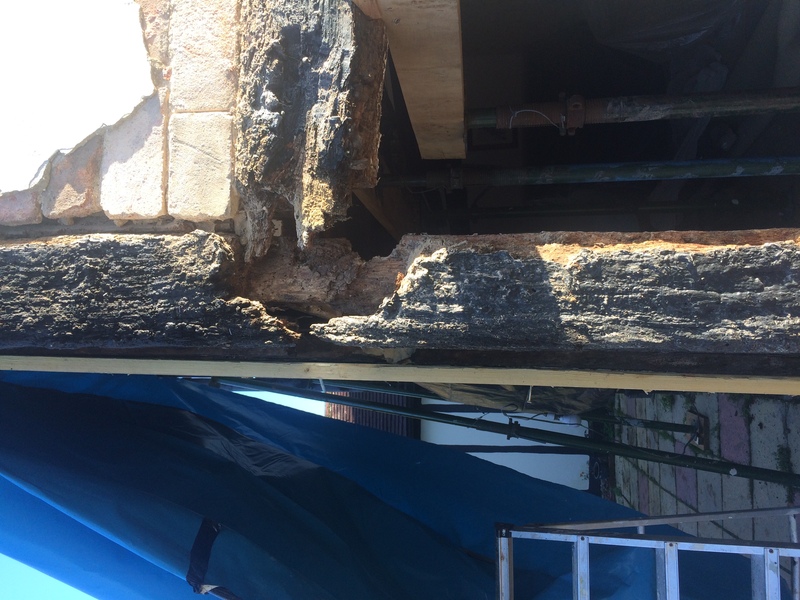 This page provides a full timeline of the vicissitudes that have come upon our house – Coxes Farm, Billericay, Essex – since the discovery of a crack at the front in December 2017. 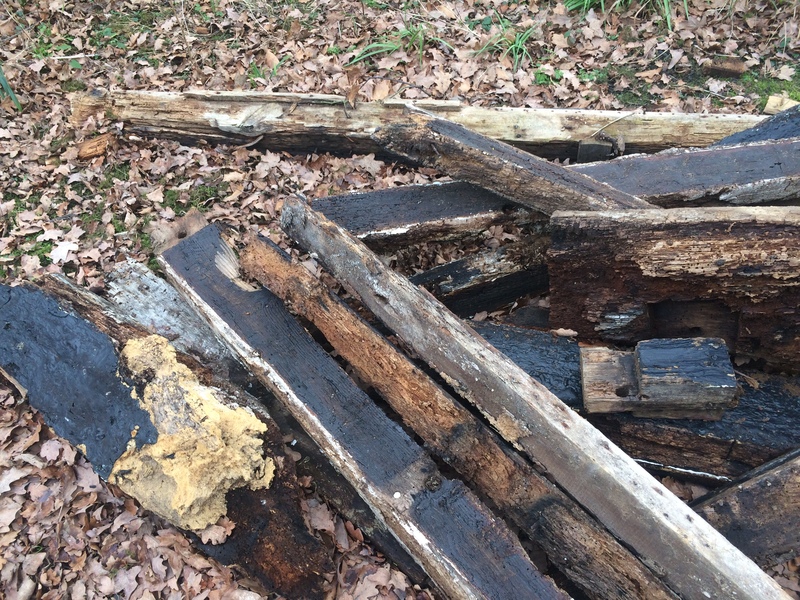 Rotten timbers taken from the rear frame (January 2019). 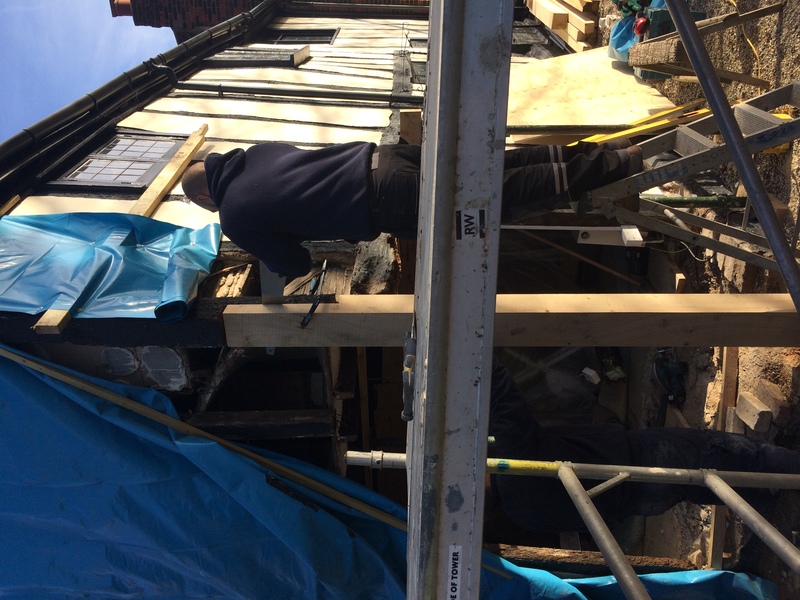 Rebuilding the rear wall - Completion (December 2018). 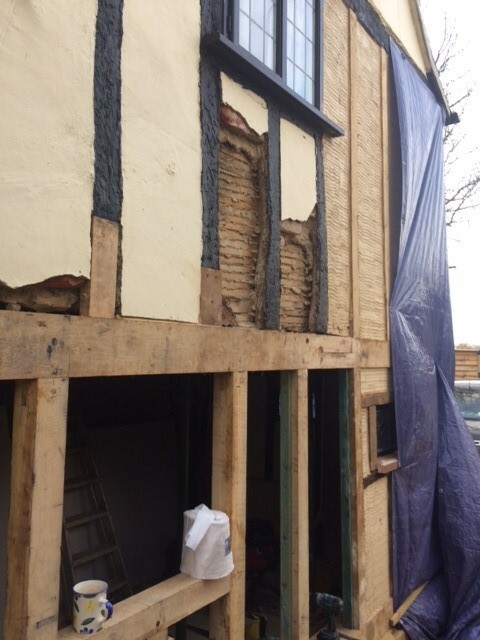 Rebuilding the rear wall - Commencement (November 2018). 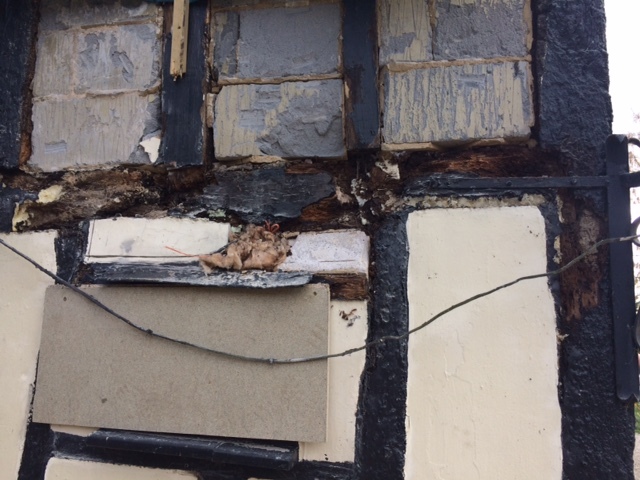 Decay in the rear wall (November 2018). 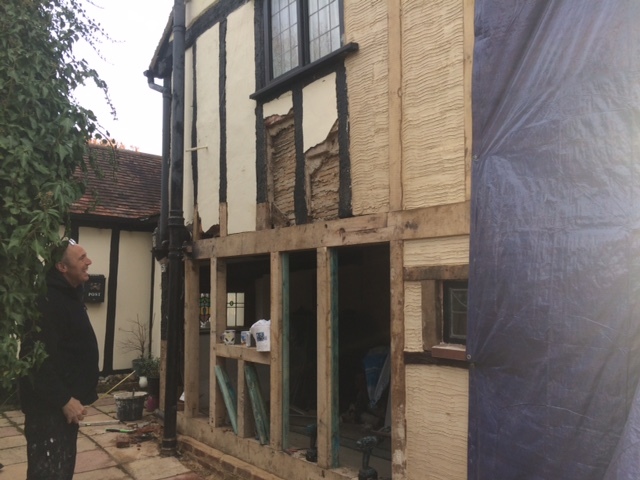 Rebuilding the front wall - Completion (October 2018). 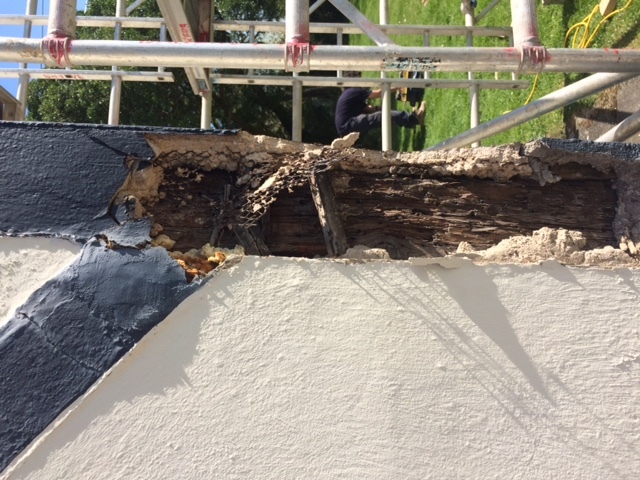 Rebuilding the front wall - Commencement (September 2018). 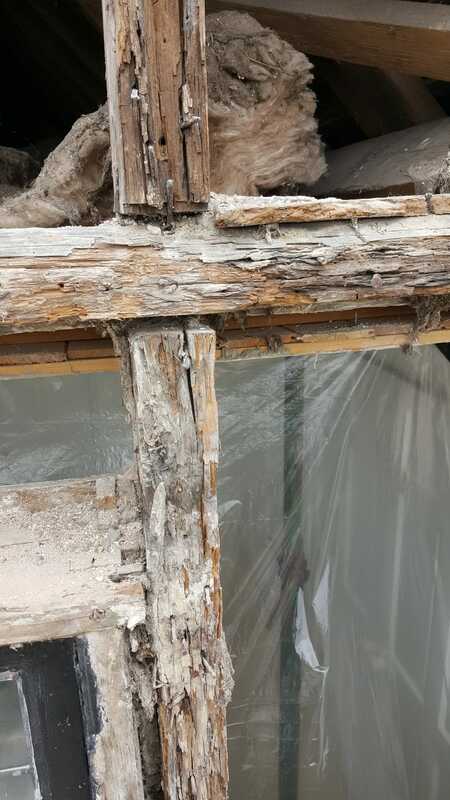 Bakers' photos of the decayed front frame (September 2018). 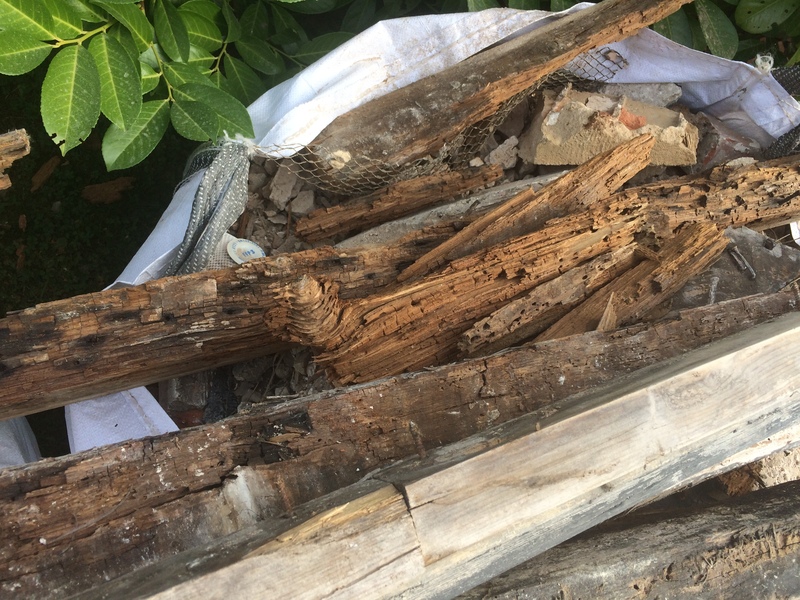 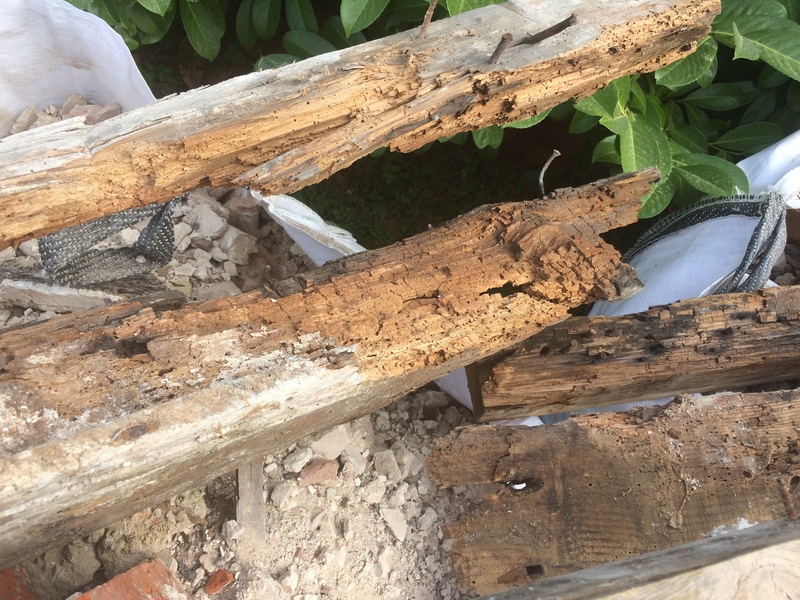 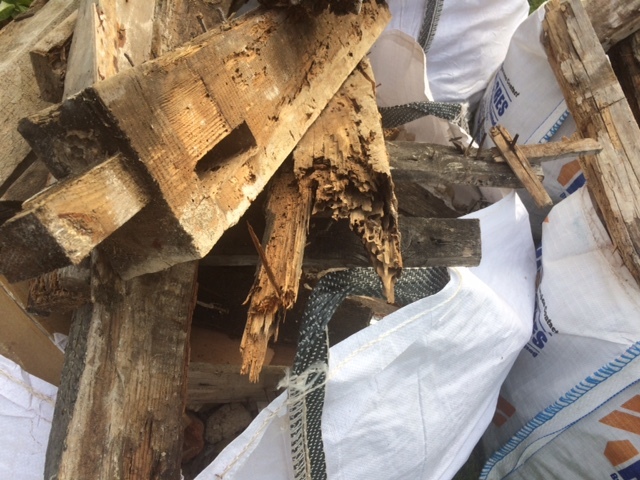 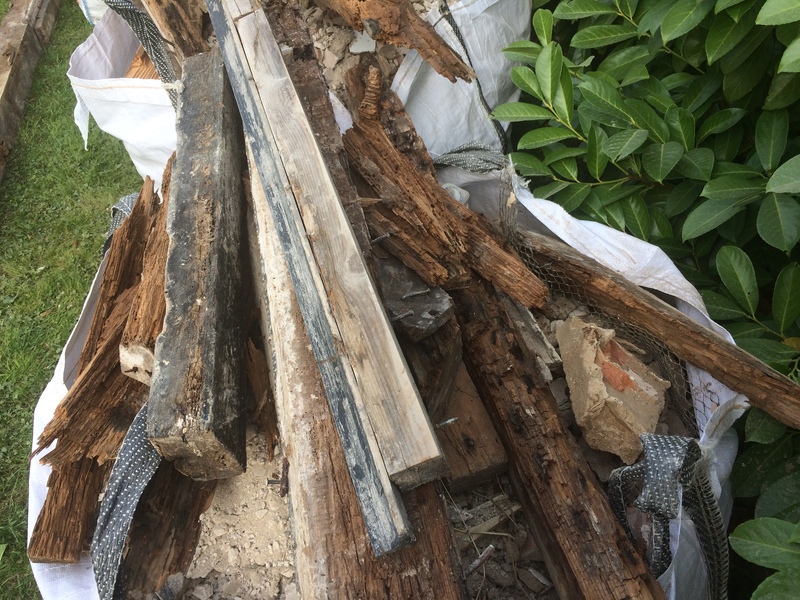 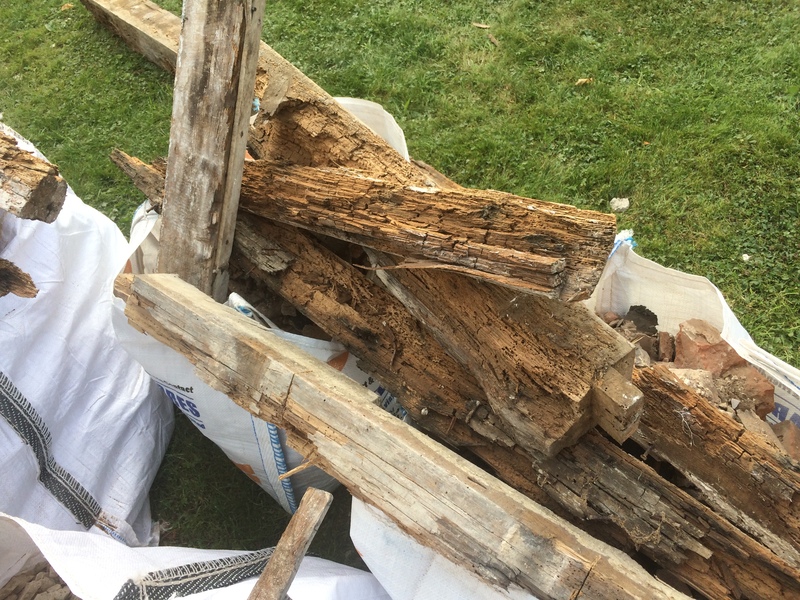 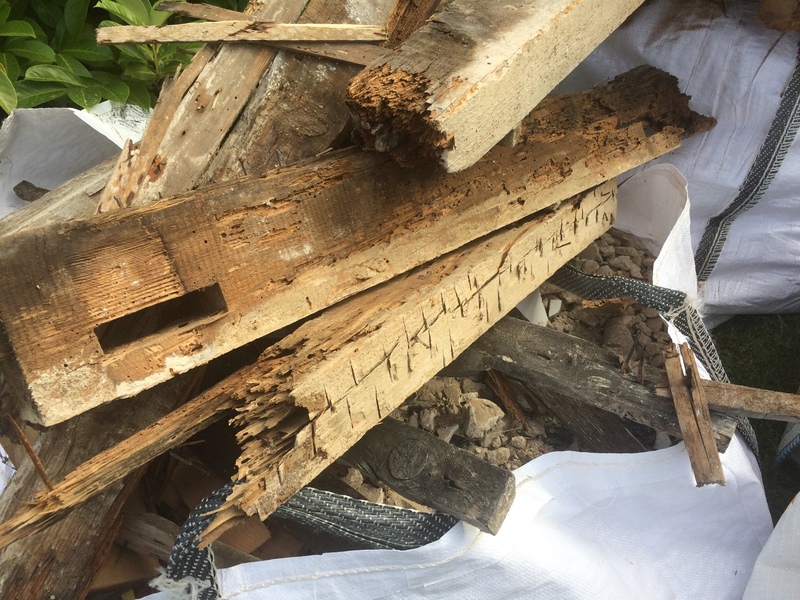 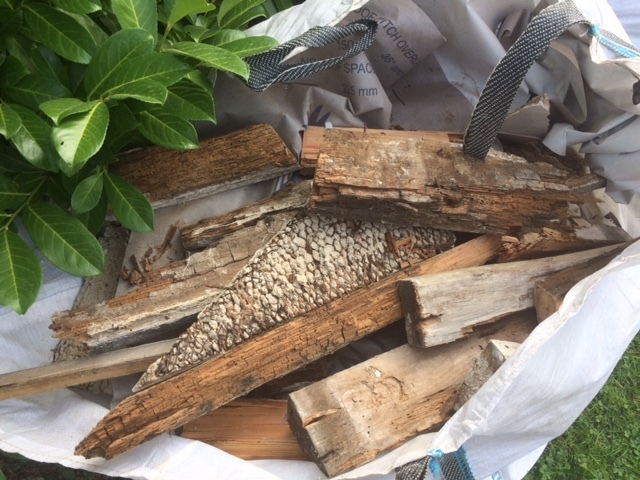 Rotten wood taken from the front frame (September 2018). 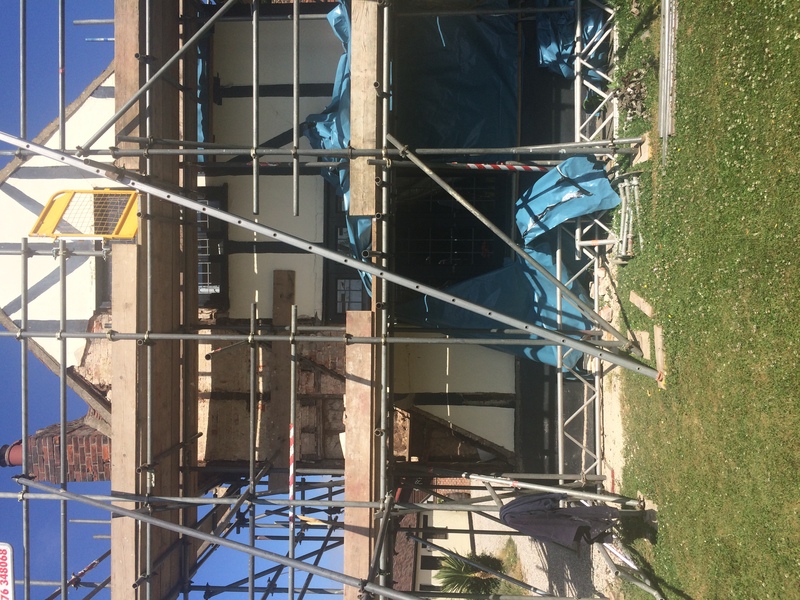 Further investigations into the front frame (June 2018). 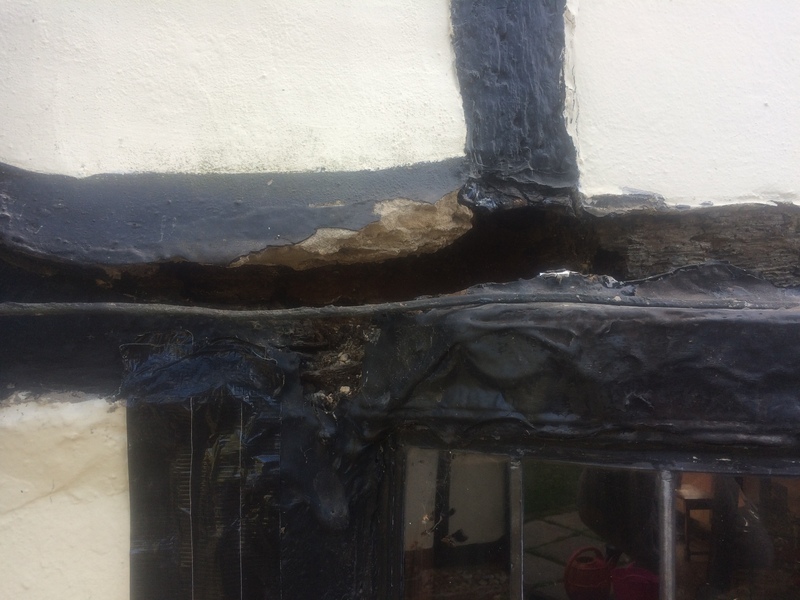 Bakers' detailed investigations into the front frame (June 2018). 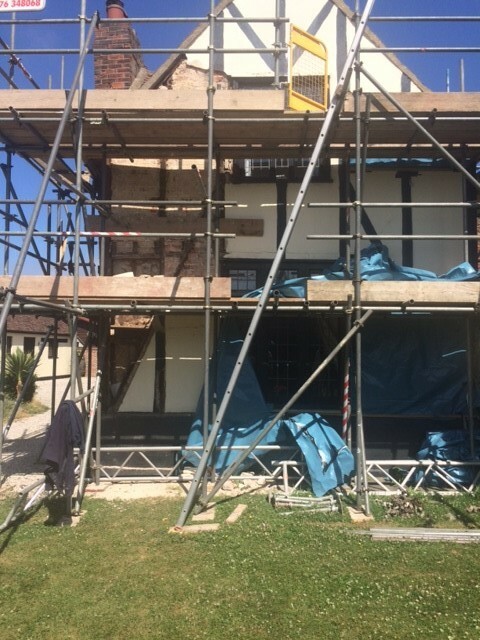 Initial Investigations at the front of the house (April 2018). 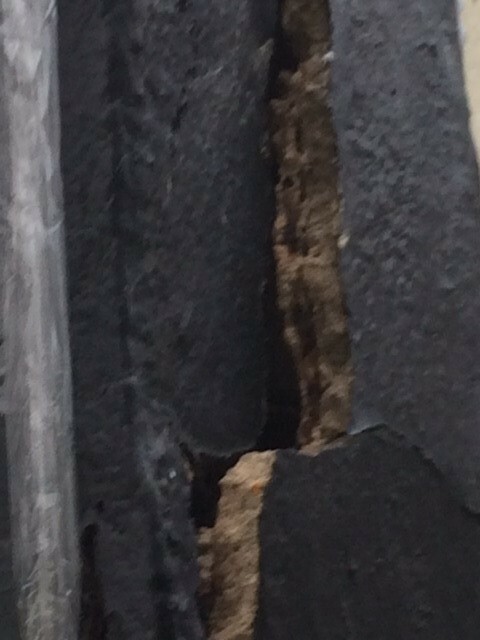 Discovery of the 'crack' (December 2017). 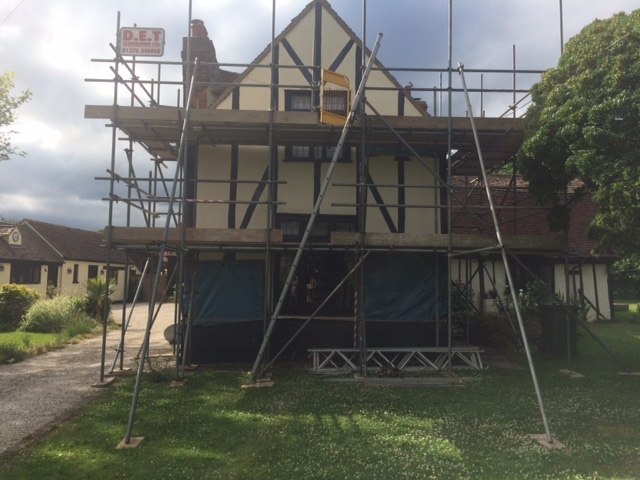 Photos of the house prior to the recent repairs appear on this further page. 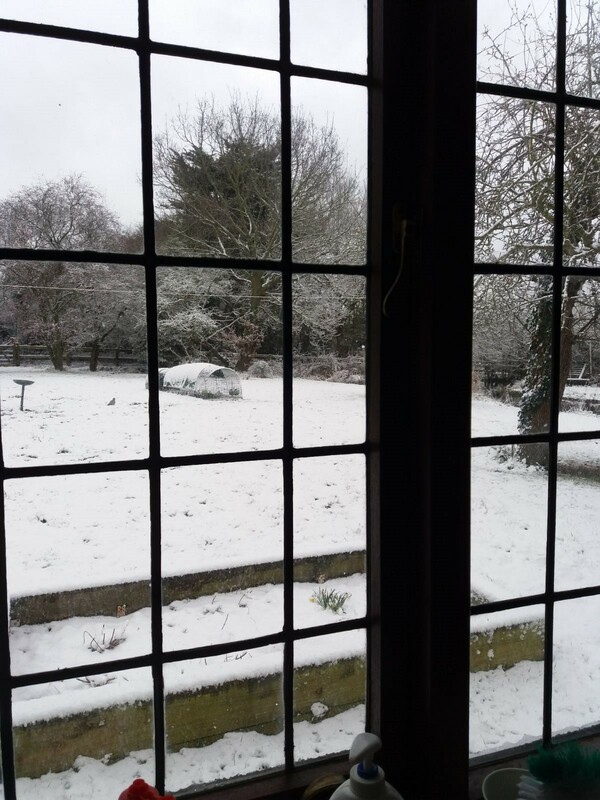 Photos of the garden appear here. 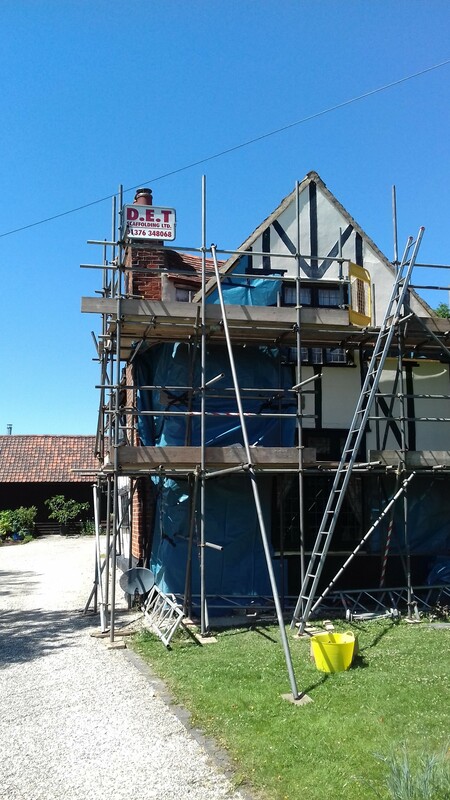 For my developing thoughts on the maintenance of such properties, see my Note "Tottering Towers & Listing Buildings". In due course I'll complete the narrative section there that describes my own experiences with Coxes Farm, though I've made some progress. 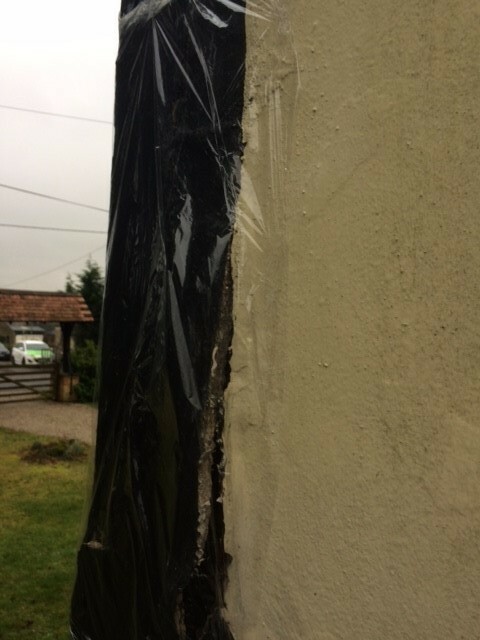 Rain still dribbles through the back wall during a storm! 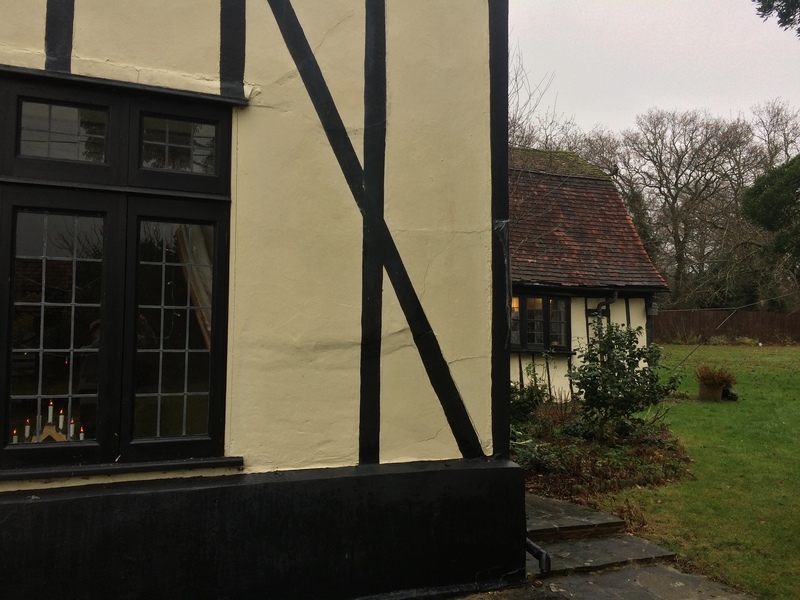 As adjacent left. 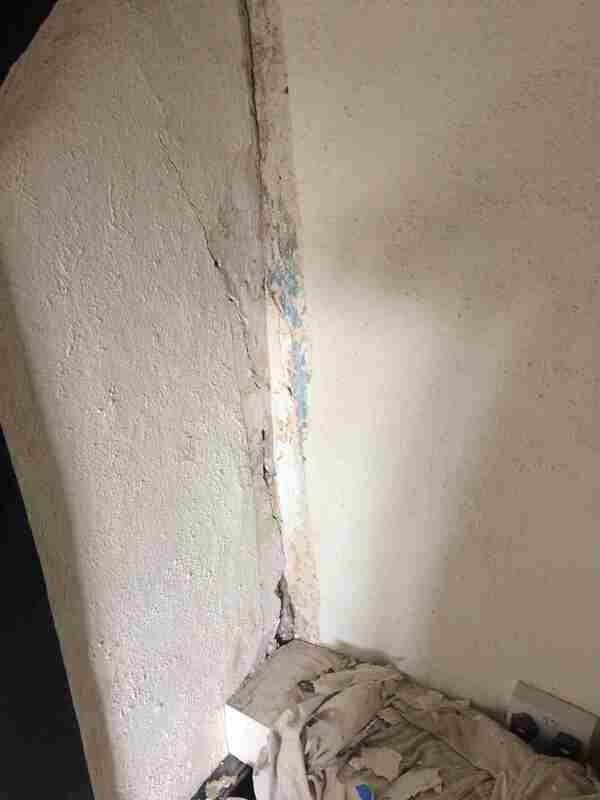 Bakers have promised to fix it! 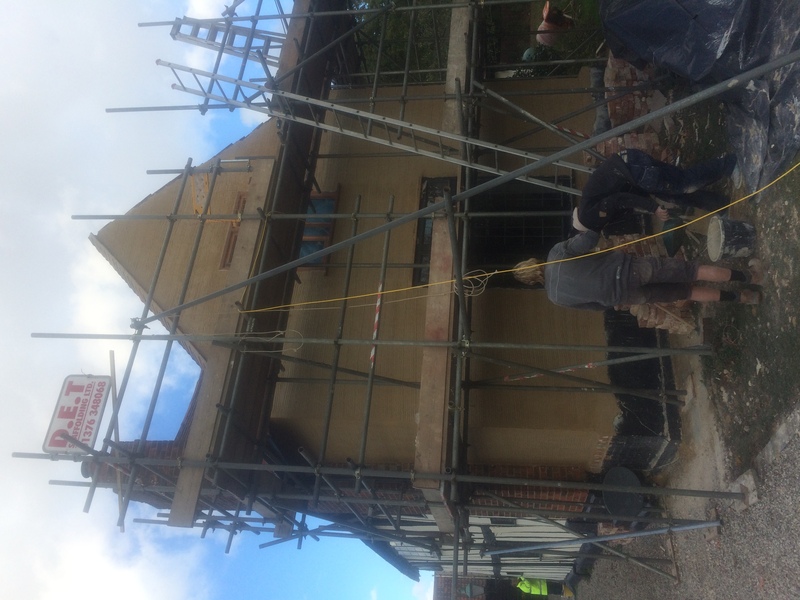 The mortar fillet at the gable end is coming away! 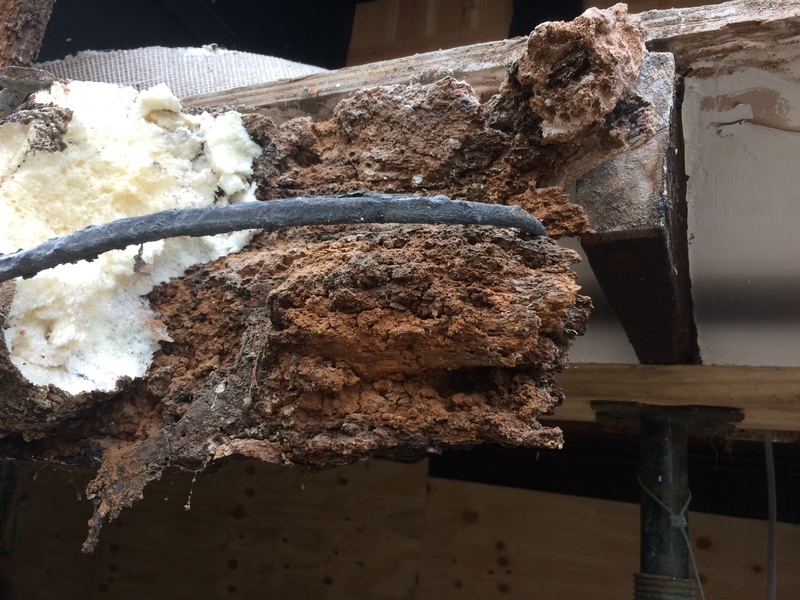 Not Bakers' fault, but they will fix it! 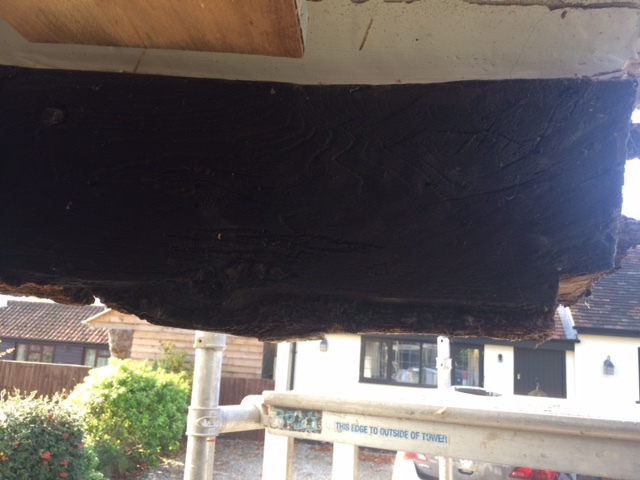 Looks like an extra beam, but it's the drain-pipe that came away in a downpour. 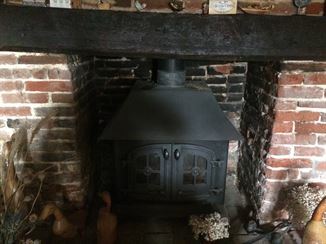 Needs an extra bracket. 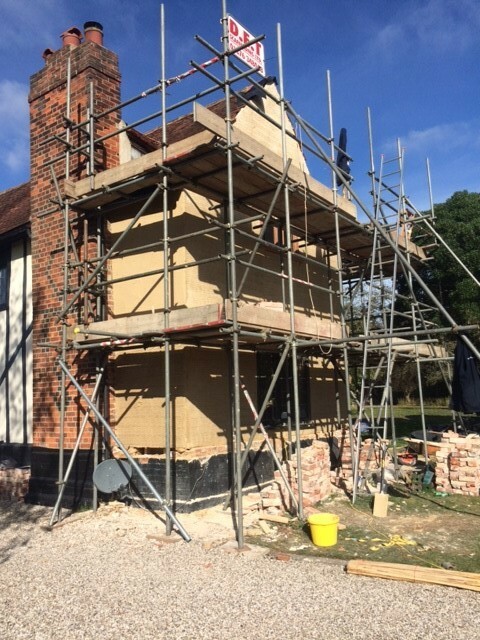 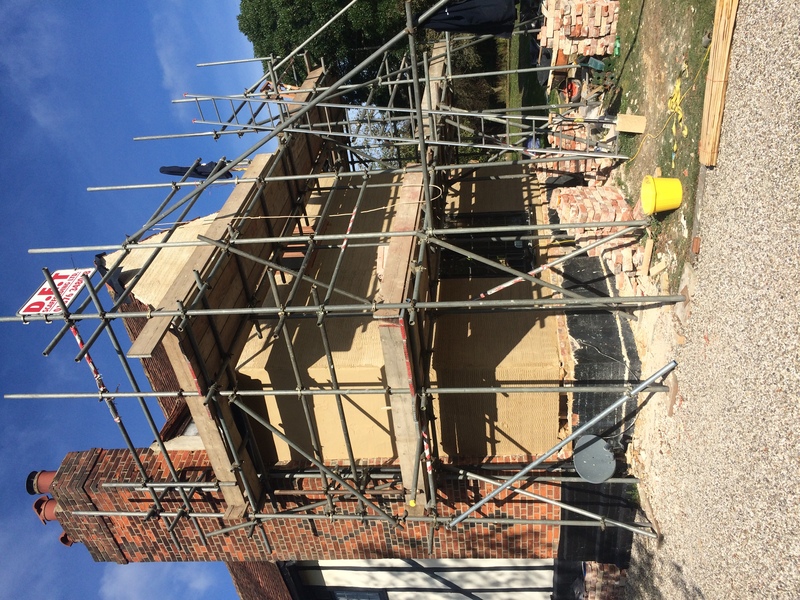 Work on the rear of the house is now complete, bar the exterior decoration which awaits the spring. 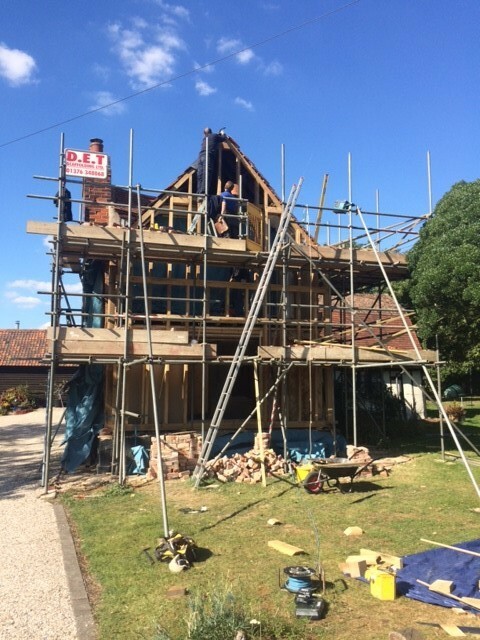 The front was completed last year. 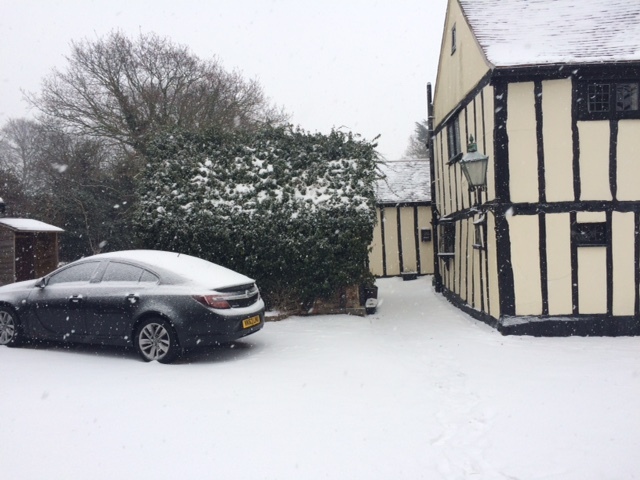 Herewith a few recent photographs. 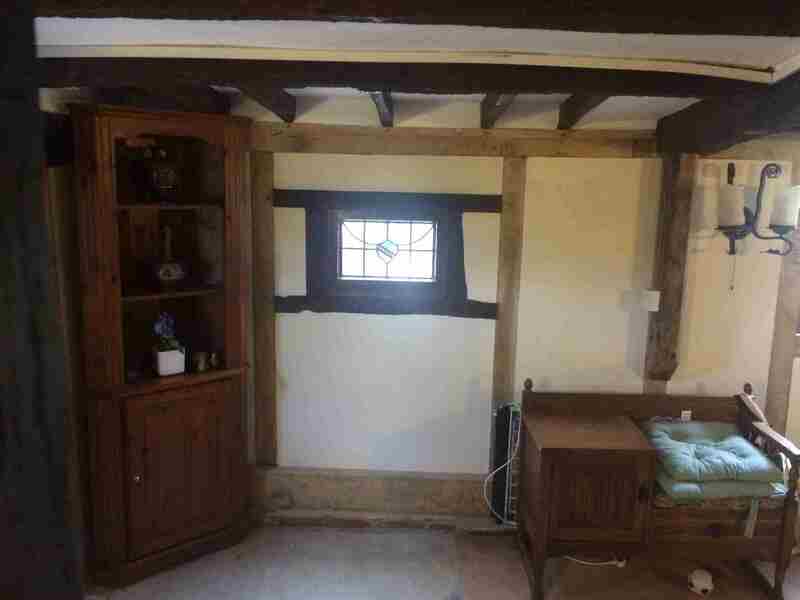 Those without comment are of the interior of the rear, after decoration but before the new carpet was laid. 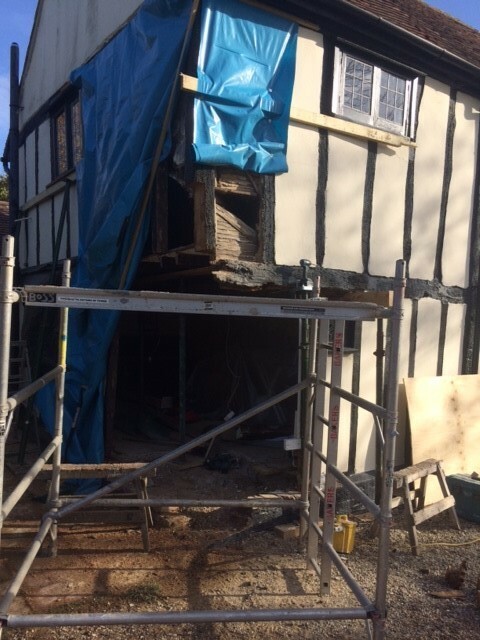 The next phase – also awaiting the spring – will involve the side of the house that projects out to the right, and which is pictured below. 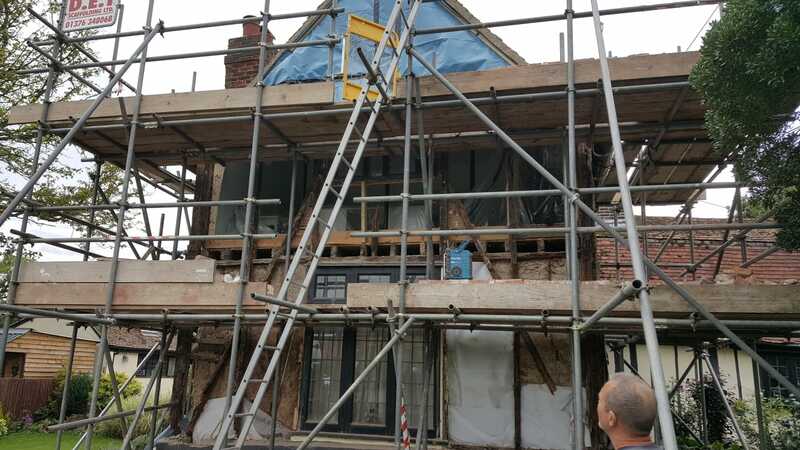 Not as much as might be done will be done as the budget is running out. 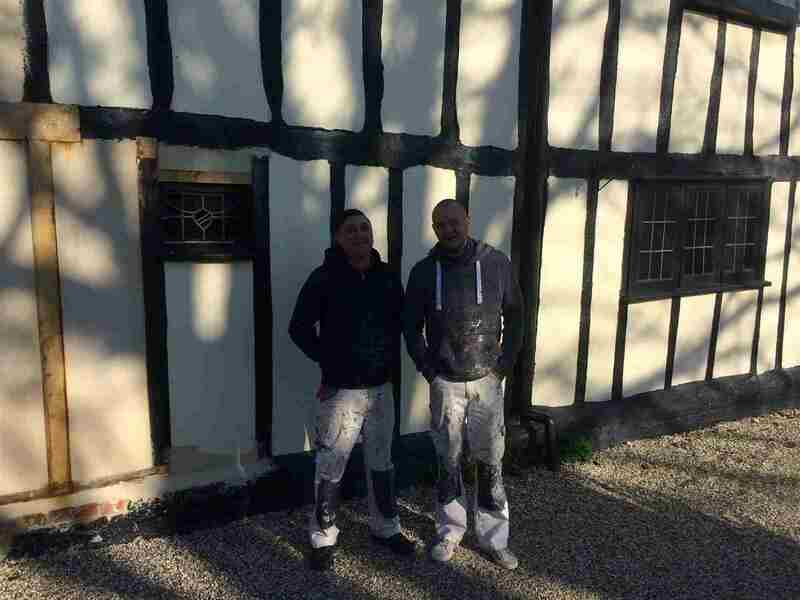 The Internal Decorators - Adam & Pete - from Bakers, who painted the front rooms and the lounge wall, and made the repairs in the next section. 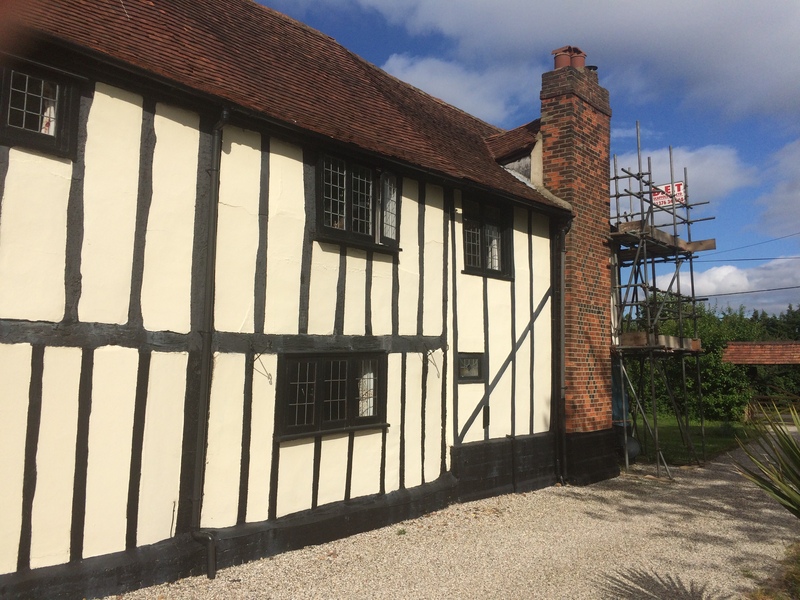 The front of the house after repairs and several coats of buttermilk limewash. The rear of the house after repairs, taken from the left. 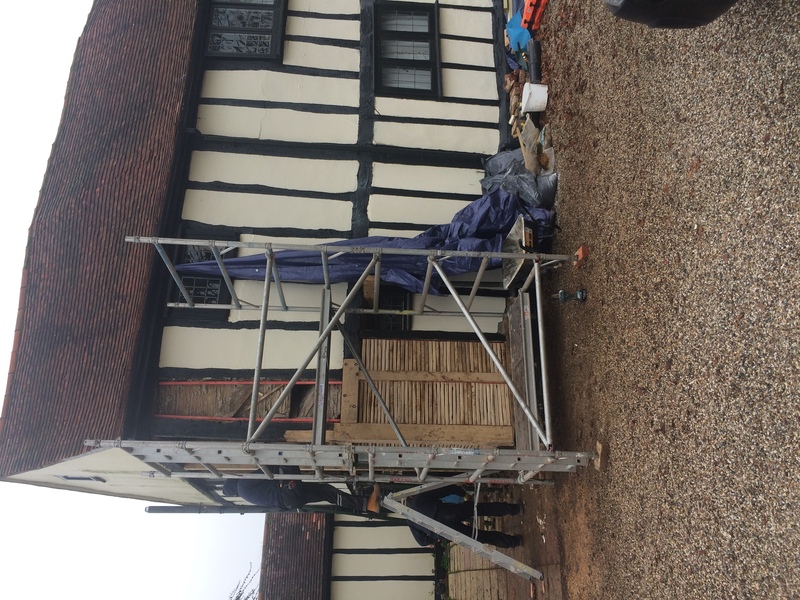 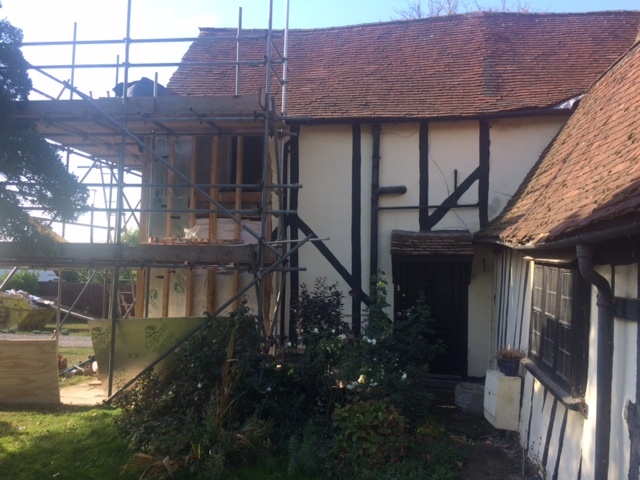 Limewash will be applied in the spring. 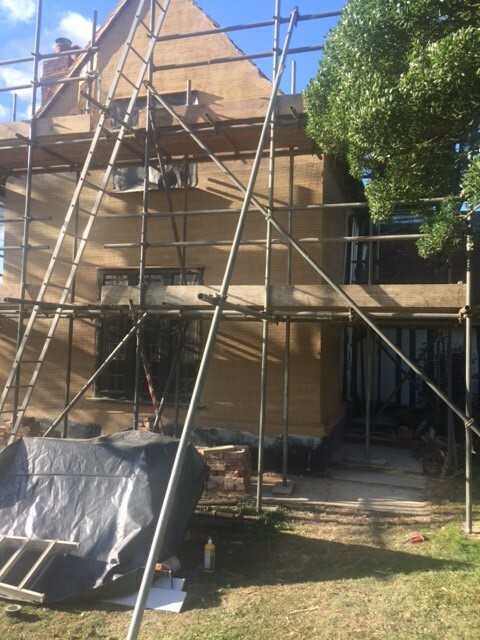 The rear of the house after repairs, taken from the right. 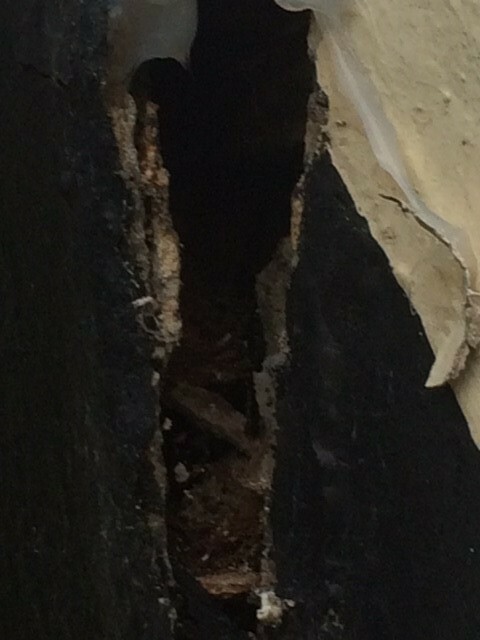 Closer view of adjacent. 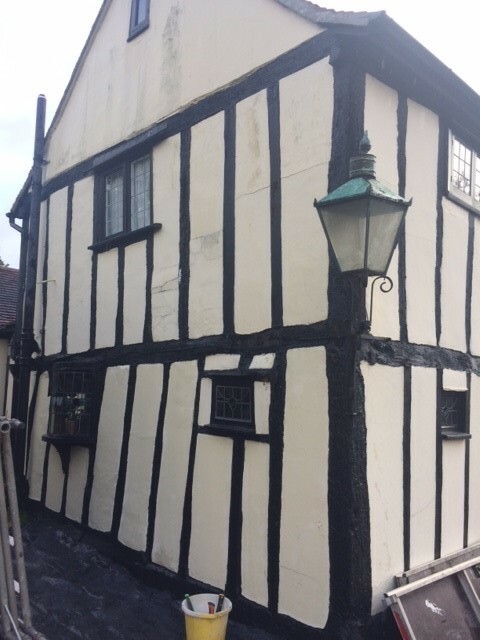 Not sure whether the new timbers will be painted. 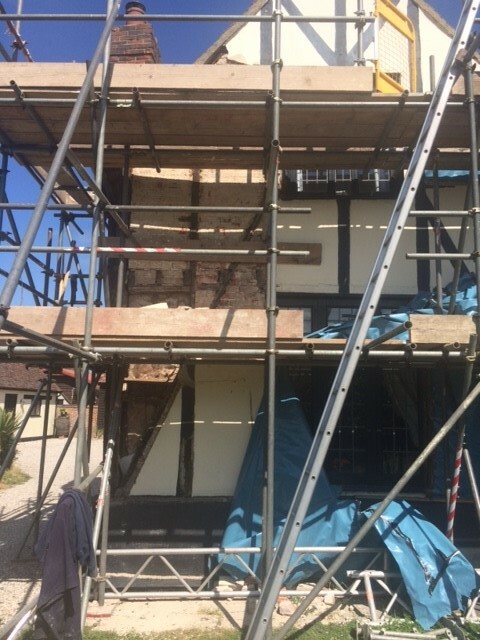 Shows the minor repairs - at various stages - though not (yet) as completed - performed by the Bakers Interior Decorators. 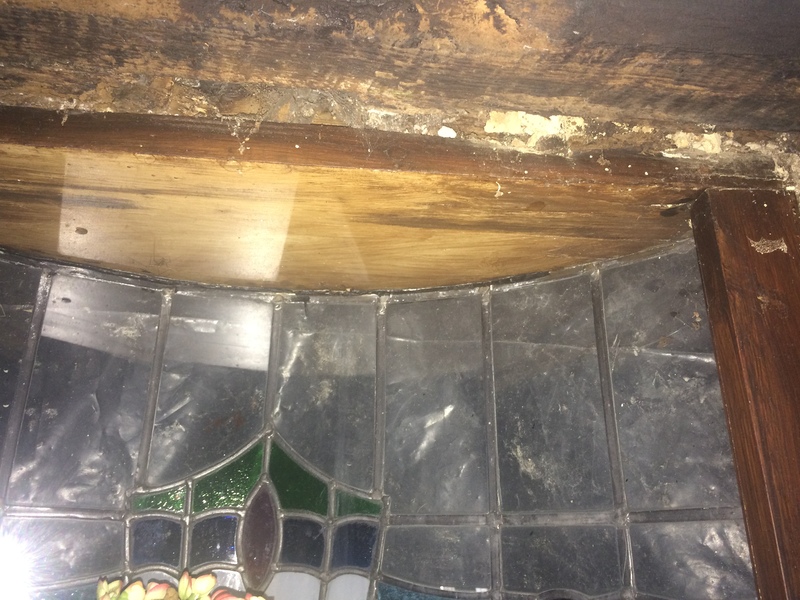 Movement of the frame over the years had caused (very minor) cracks to appear in the bathroom and (less minor) cracks in the master bedroom. 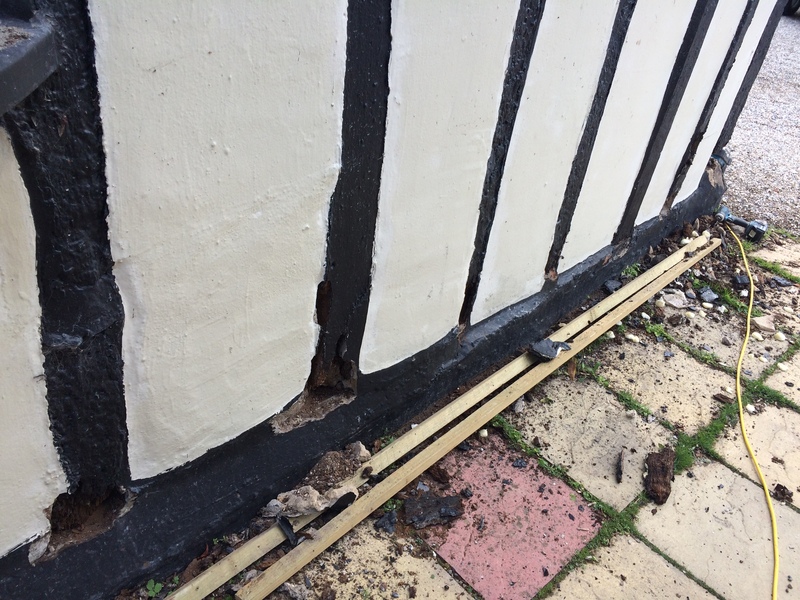 These were repaired fairly easily, but need monitoring for further movement. 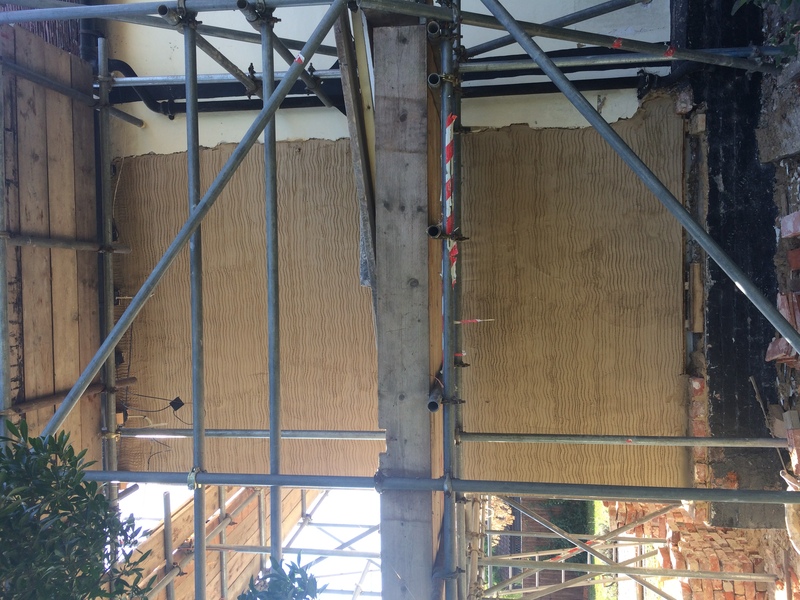 There's a panel next to the one that was fixed on the master bedroom external wall that is loose and also needs doing, but as it's less visible we let it be for now. 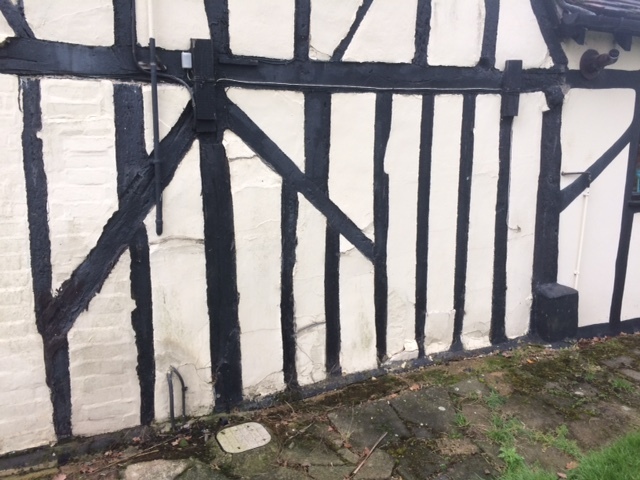 Where do you stop? 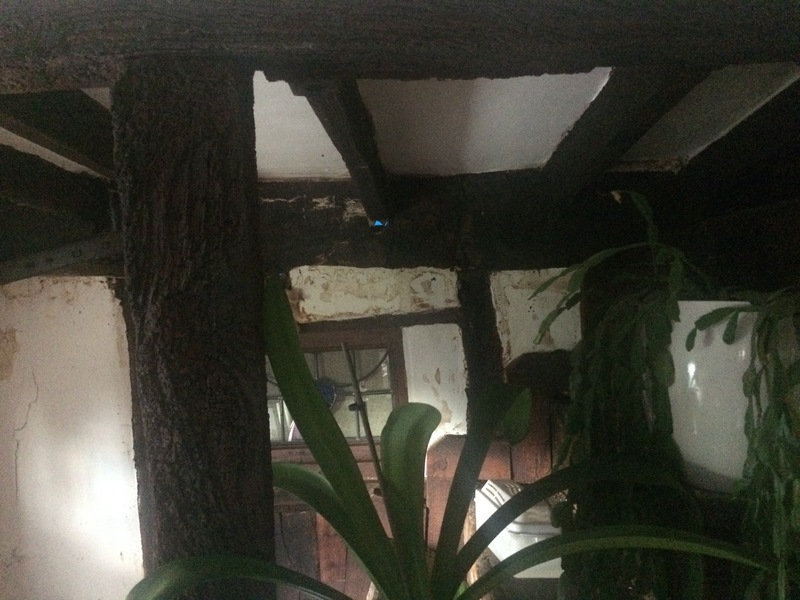 Bathroom, above the loo. 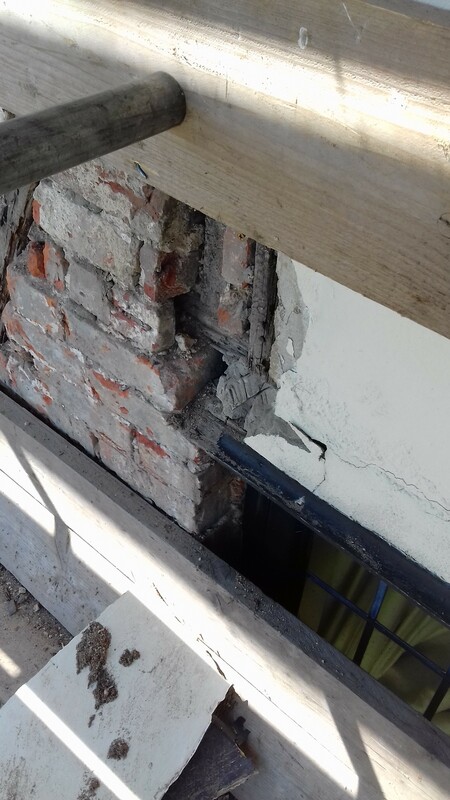 A small crack had appeared in the plaster - filled in, hopefully without further movement. 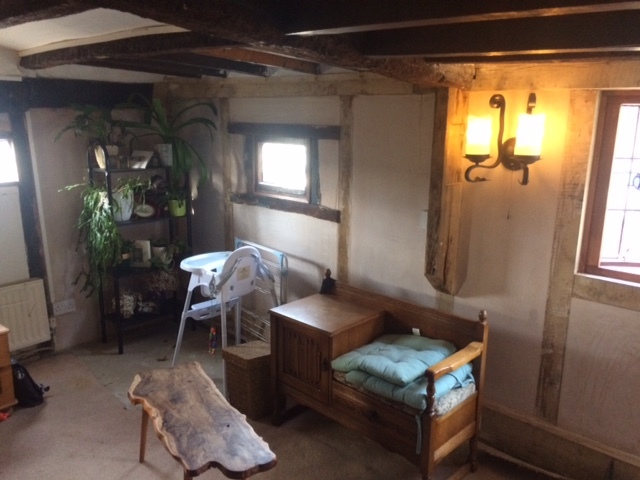 Bathroom, the corner above the bath. 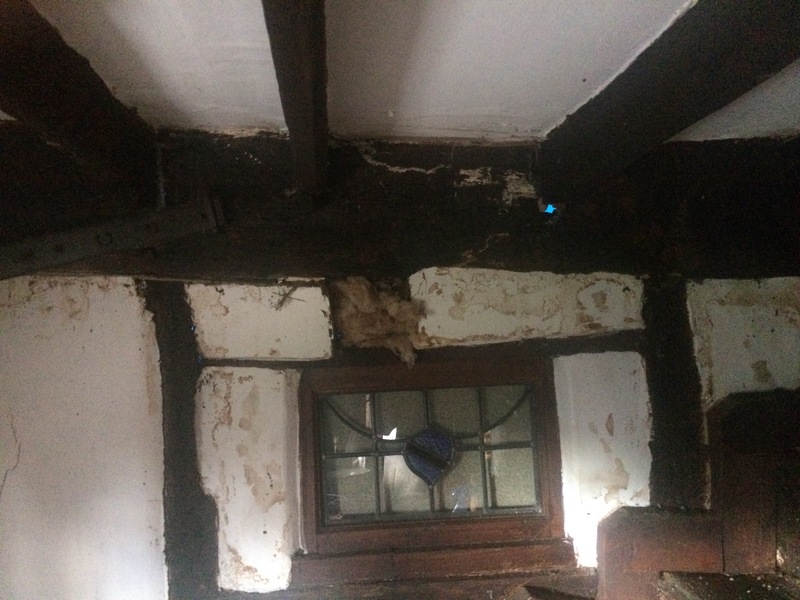 Plaster had come away by the beam. 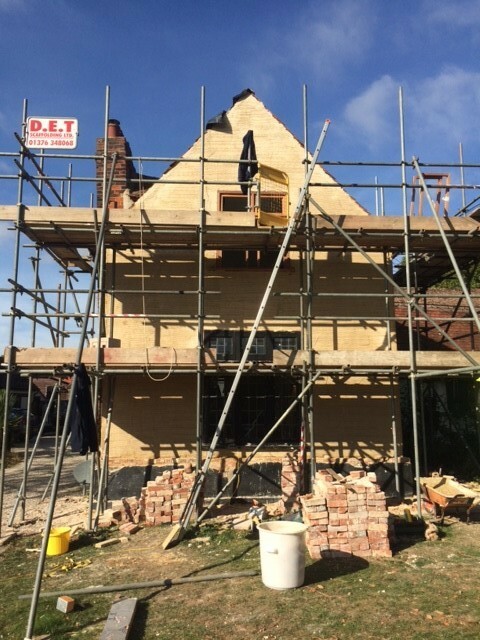 Filled in, hopefully without further movement. Movement had ripped poorly applied wallpaper in the inside-wall corner of the master bedroom. 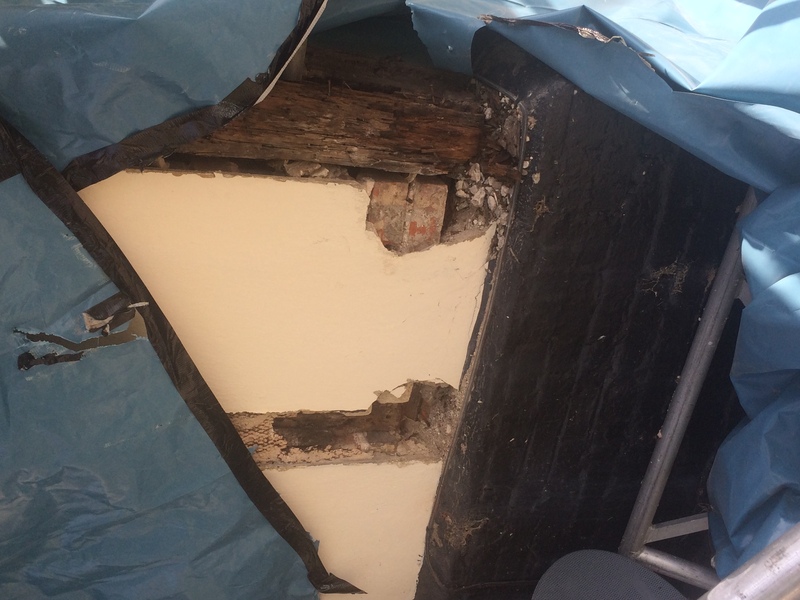 Dug out and plaster applied, to be watched for further movement. 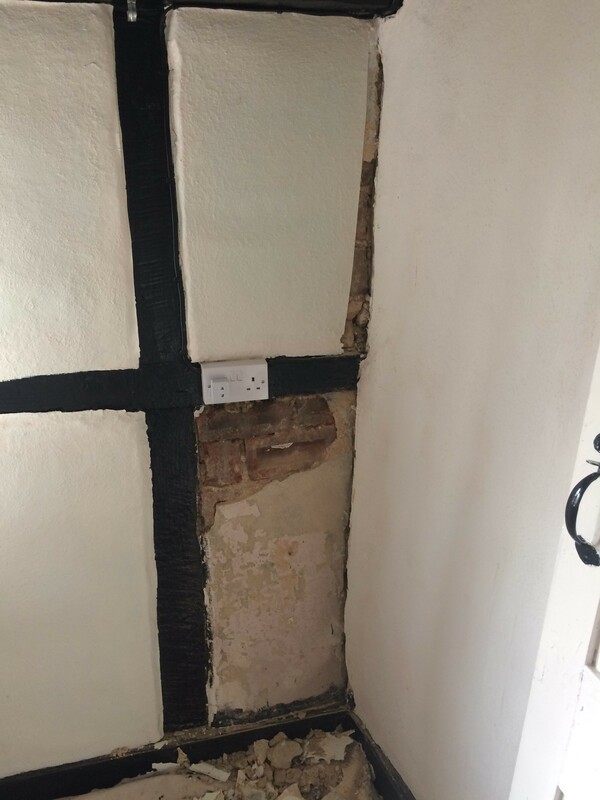 The opposite, external wall in the master bedroom - similar, more extreme splitting of the wallpaper. 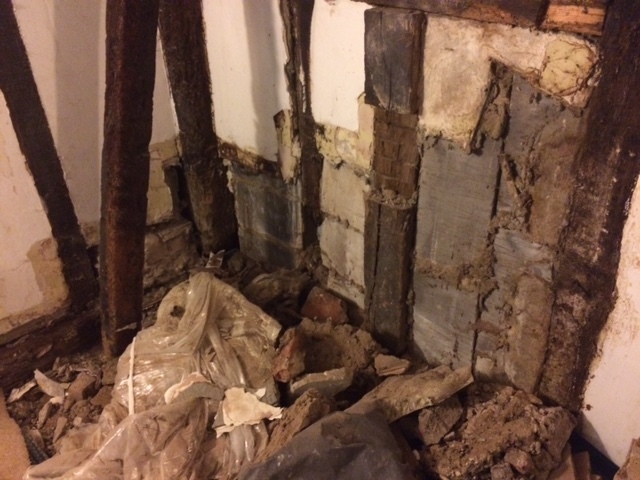 Plaster underneath excavated revealing brick infill. 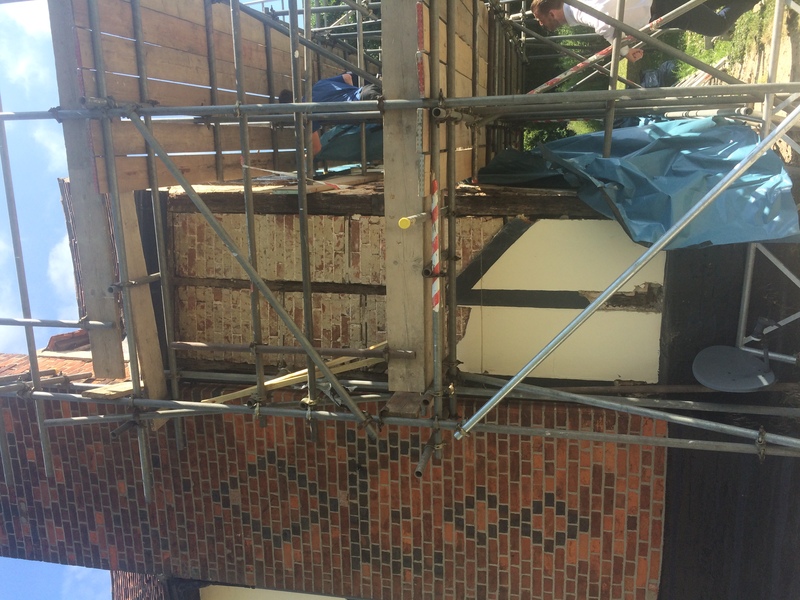 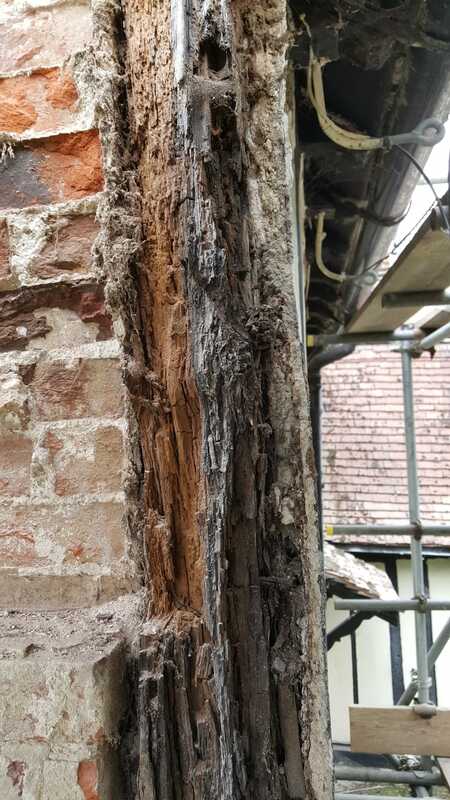 During the dry summer months there was some dropping of the visible brick infill in the lower half of the gable-end wall – leaving gaps that have been temporarily plugged. 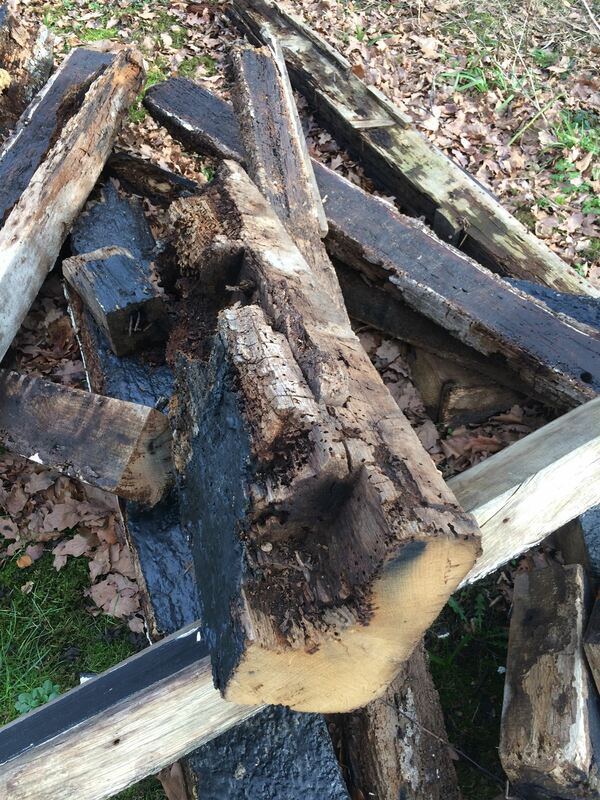 This is no doubt ultimately due to the sole plate having rotted away, with settling as the ground dried out. 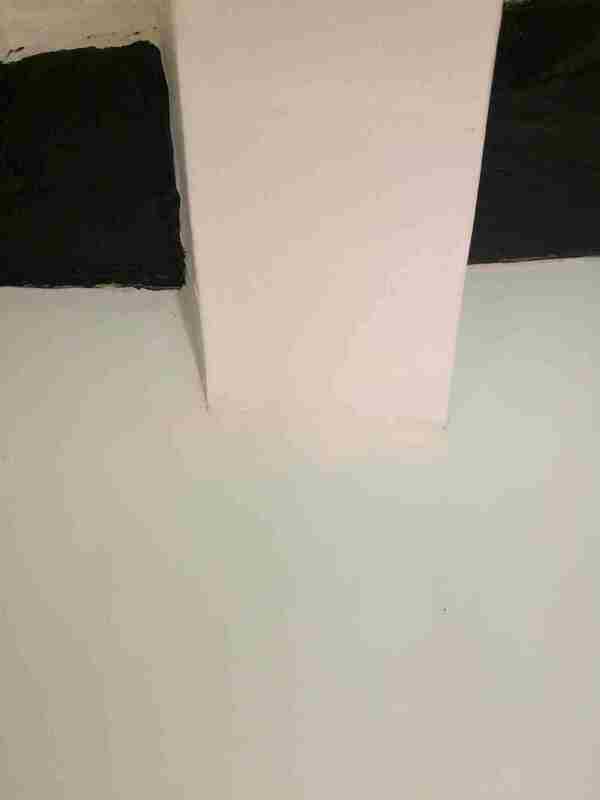 The central post is also compromised, though the bressummer seems sound. 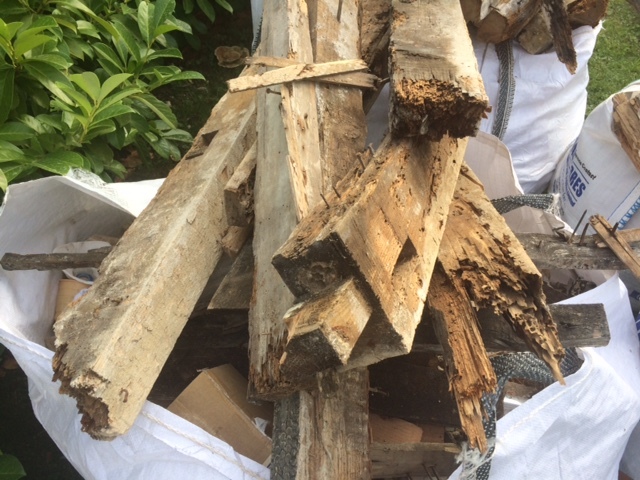 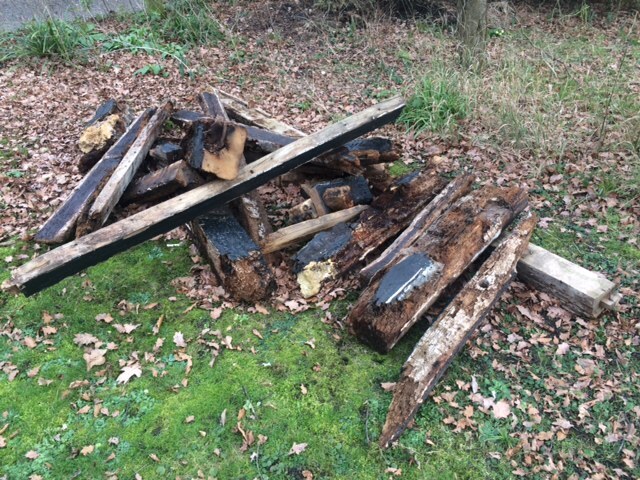 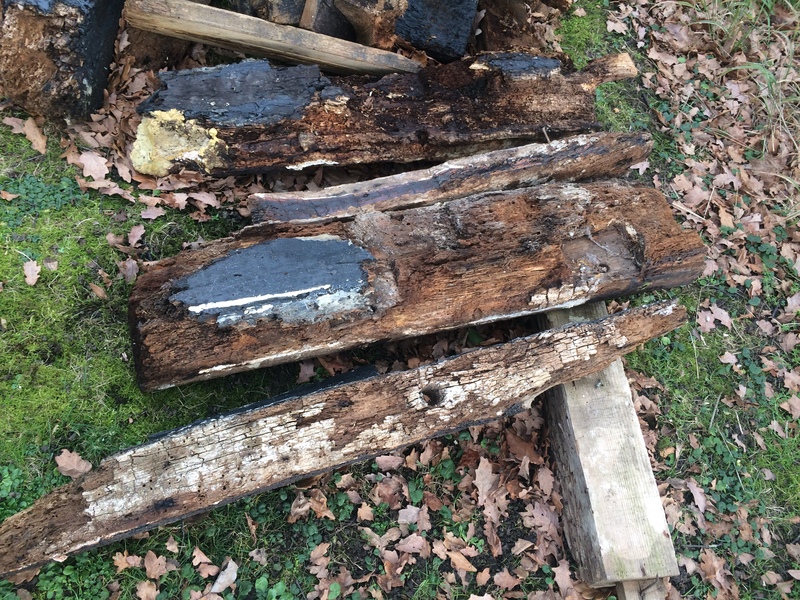 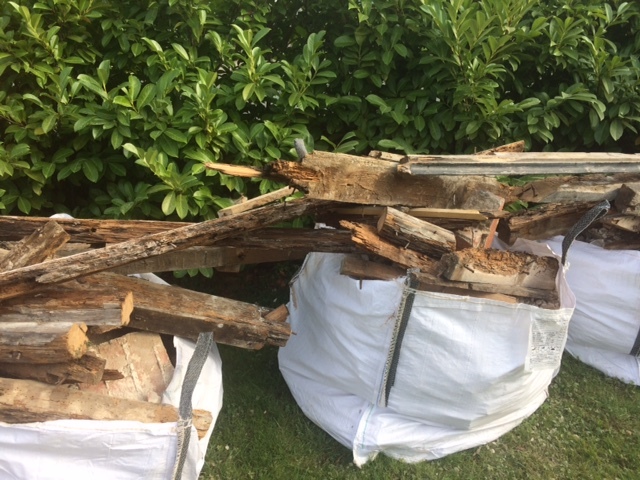 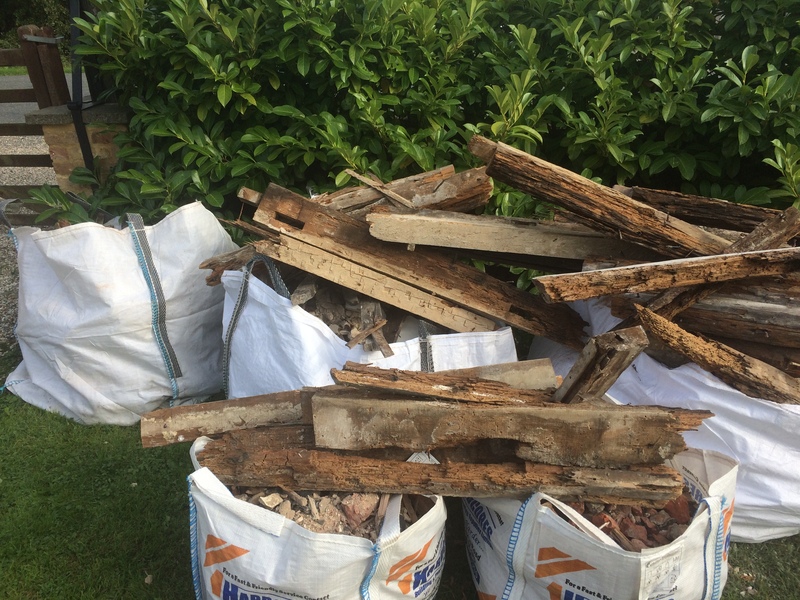 Rather belatedly, I've taken some snaps of the pile of - mostly ancient - beams taken from the back of the house. 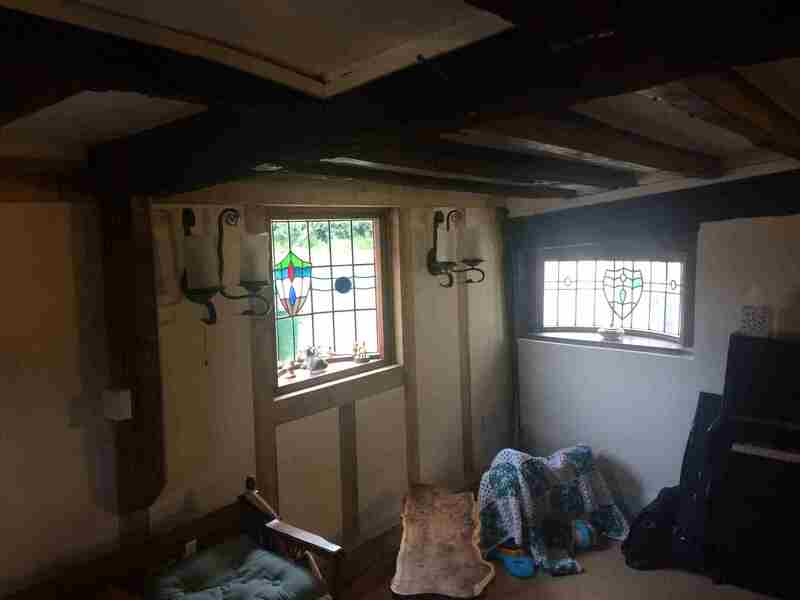 The rear interior. 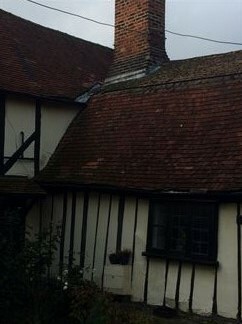 View of the oriel windows. 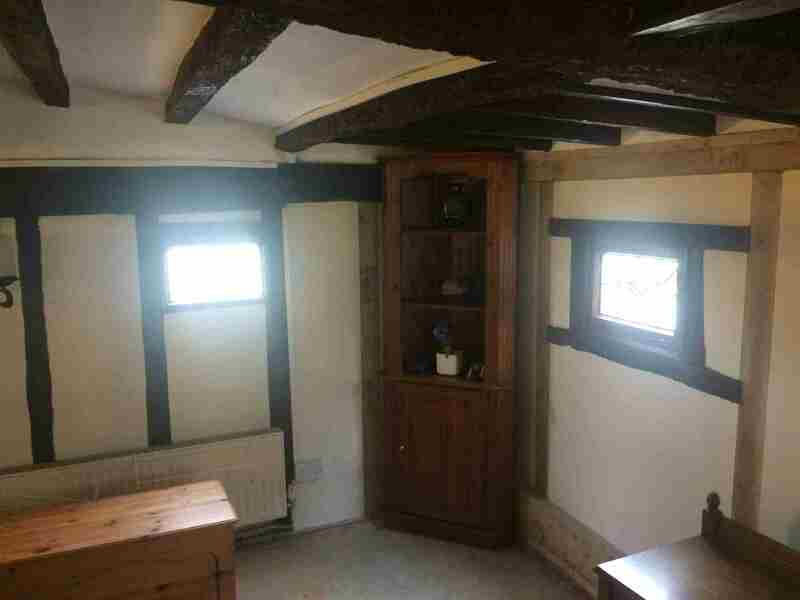 The rear interior. The staircase to nowhere is nowhere to be seen! 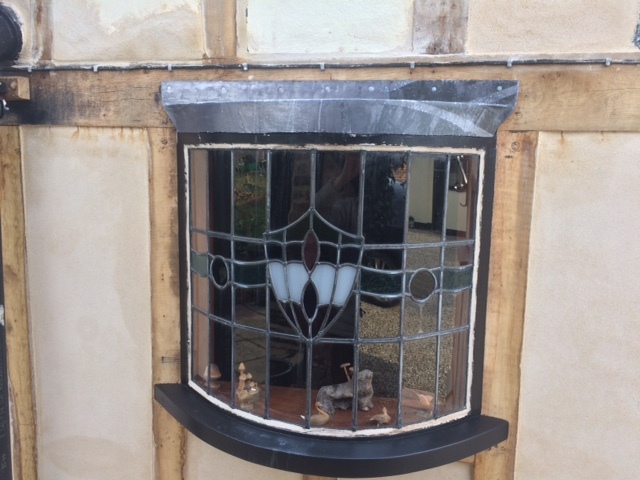 The rebuilt oriel window is back in, complete with its lead flashing. 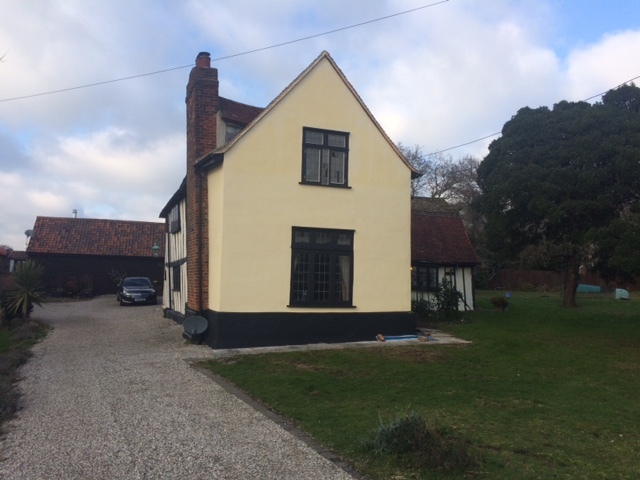 The completed rear of the property - View from the left. 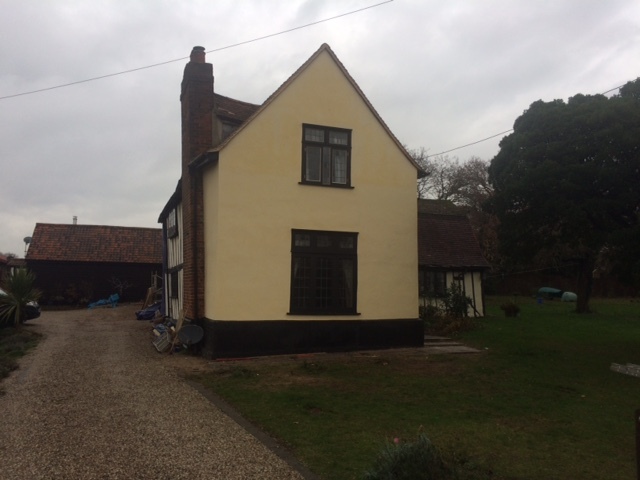 The completed rear of the property - View from the right. 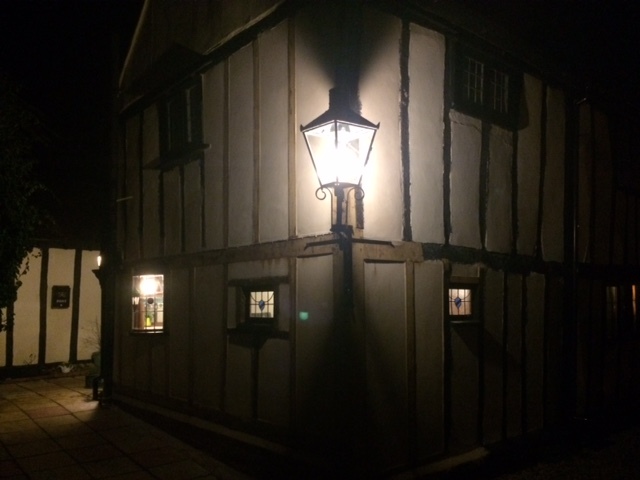 The lamps are now installed and working! 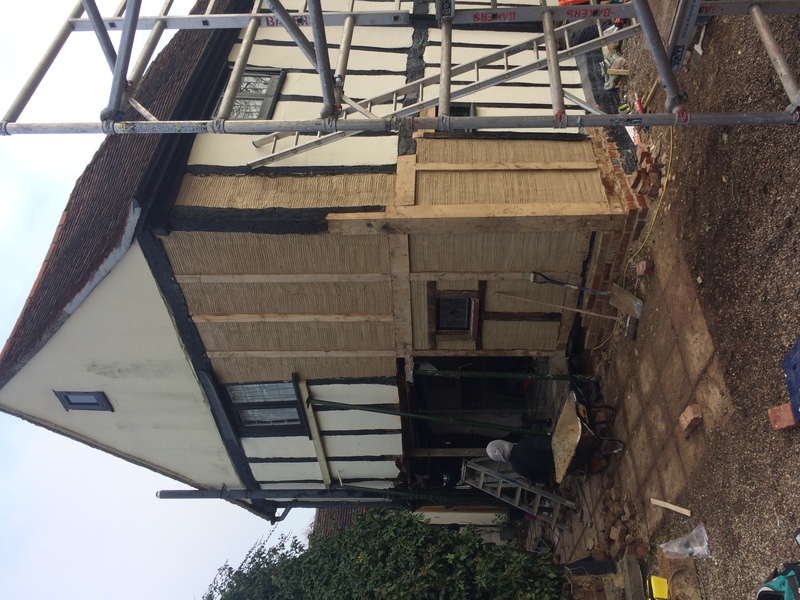 The next phase – awaiting the spring – will involve the side of the house that projects out to the right, and which is pictured below. 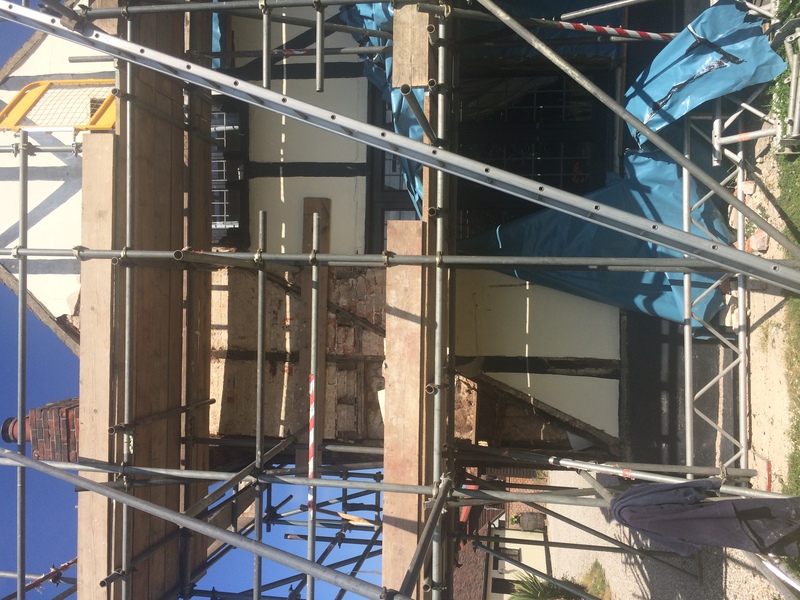 Not as much as might be done will be done as the budget is running out. This wall will mostly have to wait! 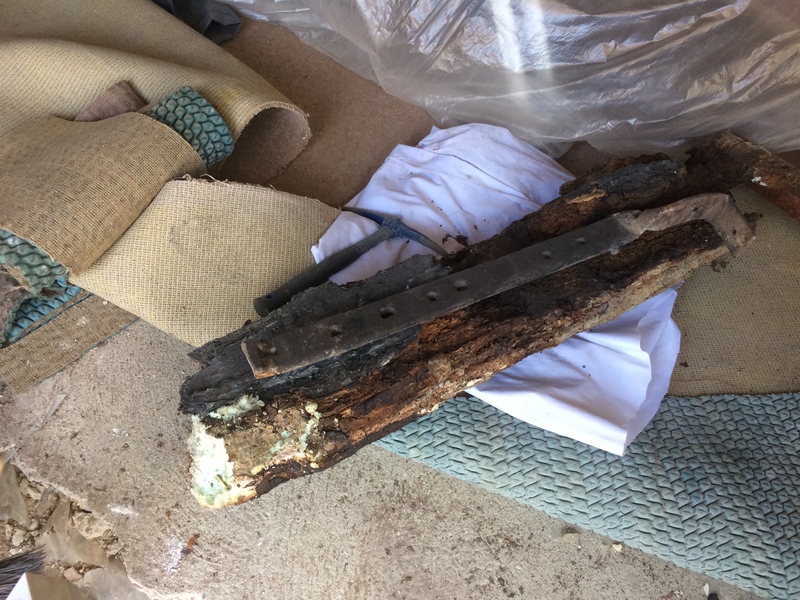 Probably for the next owner, though there's a cracked plate that requires more immediate attention. 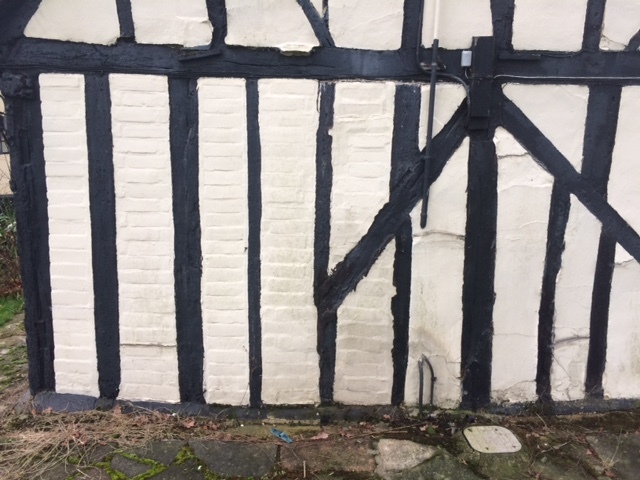 The sole plate on this wall is under-ground, though part of it can be seen from within the house. Not much can be done above the bressummer - though we hope to have the cracked and protruding plate to the right of the window repaired. 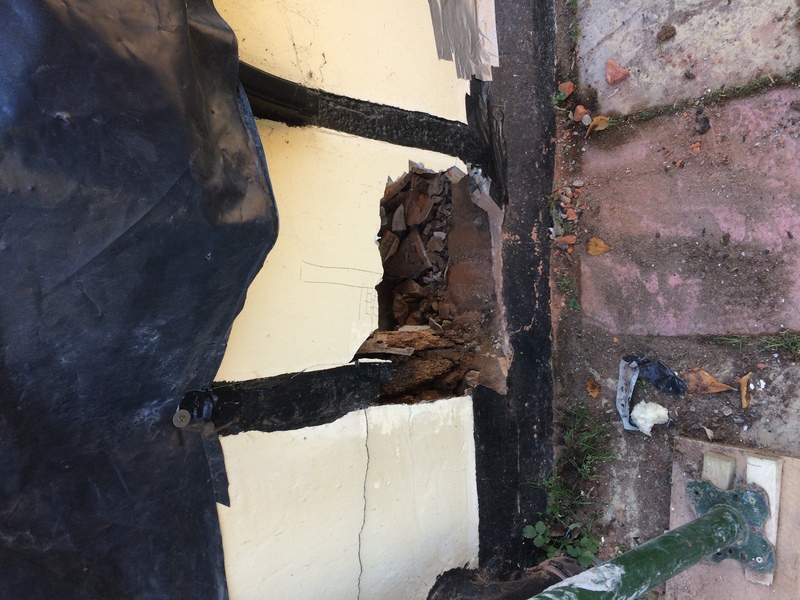 Fixing this wall may be awkward - though important - as this is the point of entry of the electrics. 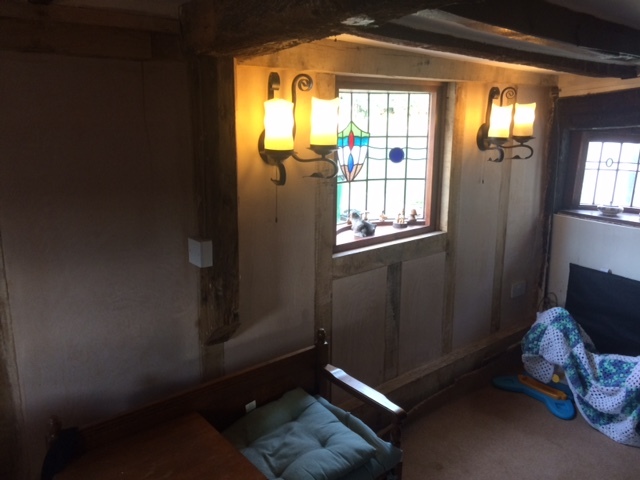 Three fuse-boards are behind the wall. 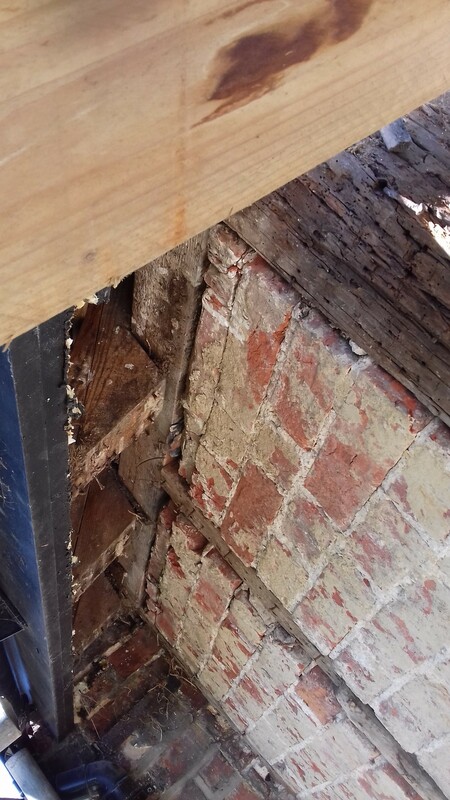 Cracking in the end wall, showing the filled-in gaps in the brick infill. 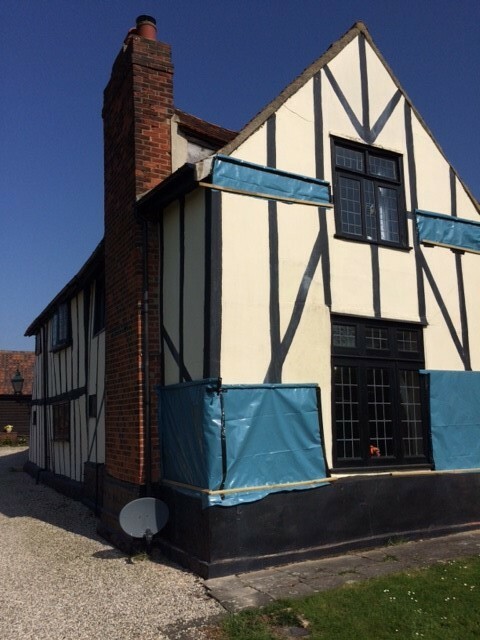 The blue colouration is actually black bituminous paint. Close-up of expanding-foam applied to the bressummer. 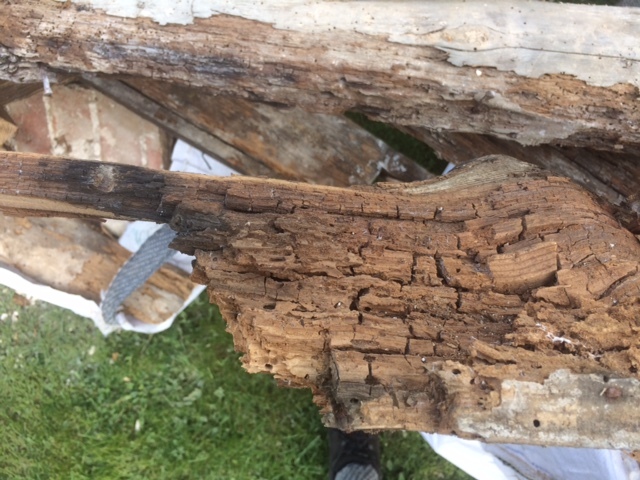 The corner post (I think) – it shows that while part of the cross-section has rotted away, the residue is sound (though maybe this is a joint). 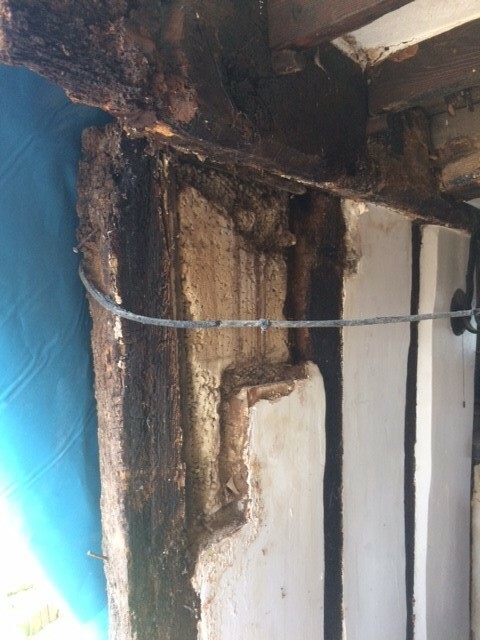 Two pieces of rear bressummer showing extreme decay (and more expanding foam). 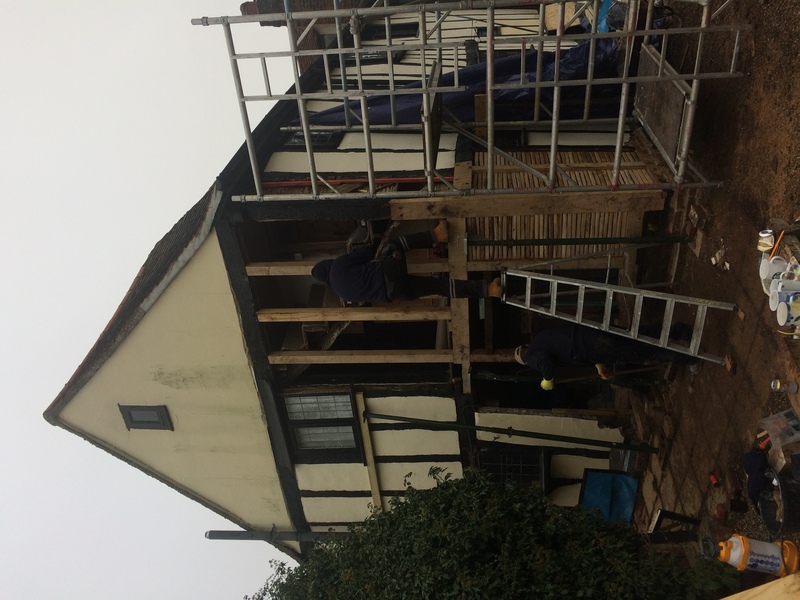 The long beam at the back is from the front of the house. 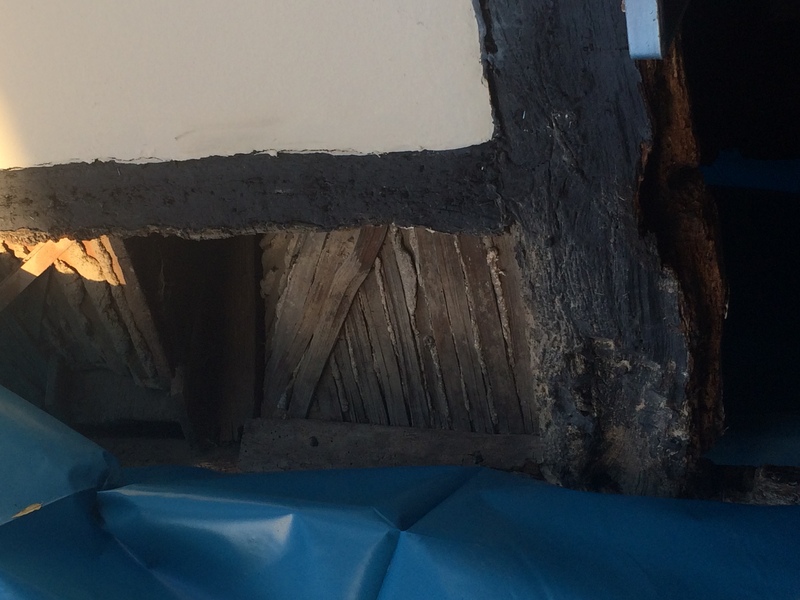 Shows a section of the rear bressummer replete with painted expanding foam. 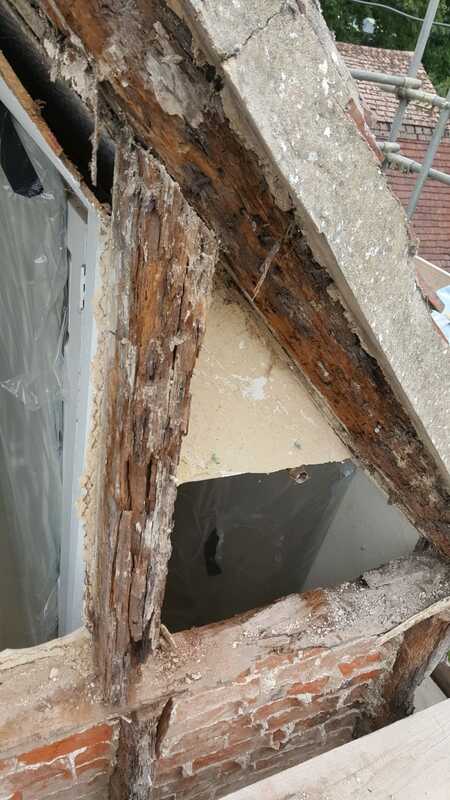 The chunky beam in the centre newly cut through is a discarded bit of a rear corner post, I think. 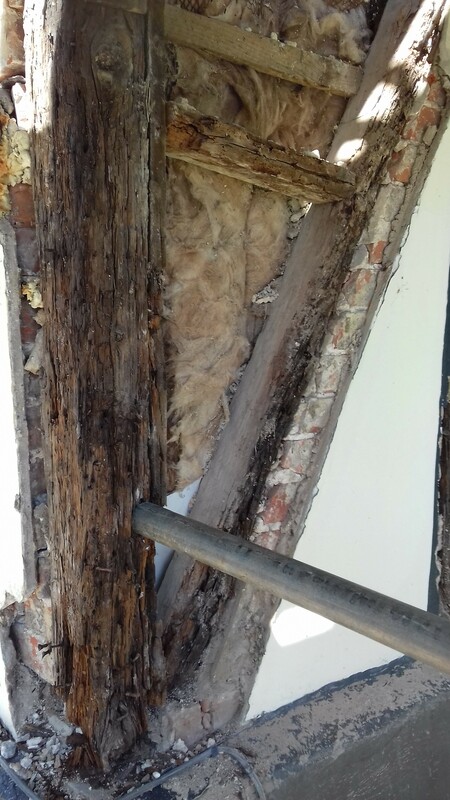 More decayed bressummer and foam! Shows - inter alia - the tennon on the beam from the front. 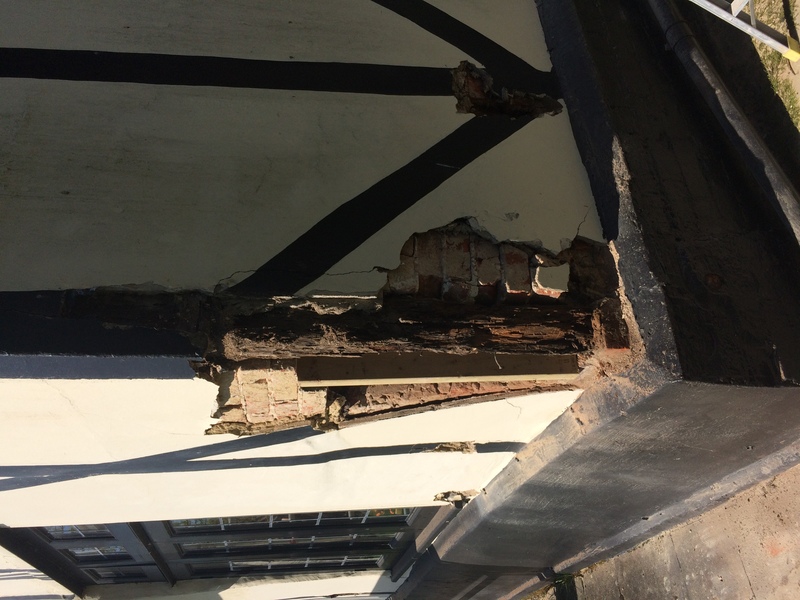 The long diagonal beam is probably a modern repair to the rear. 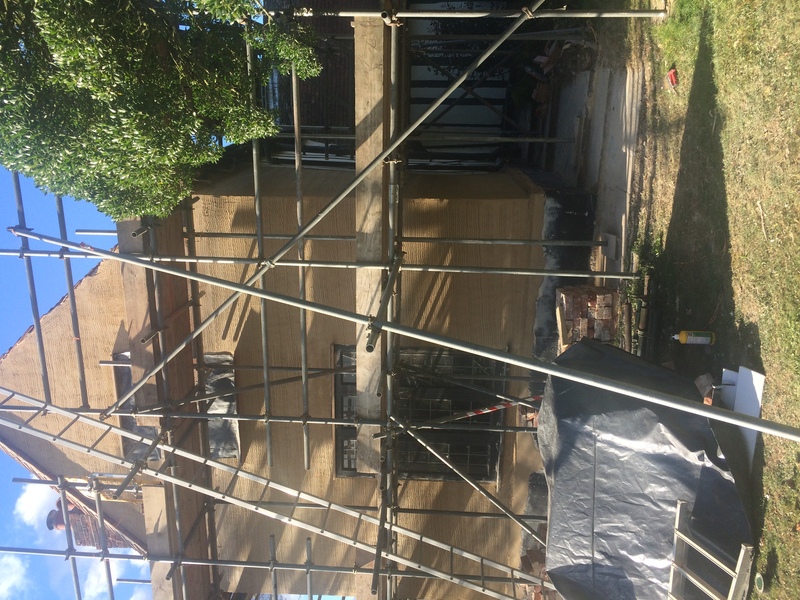 Work on the rear of the house is substantially complete. 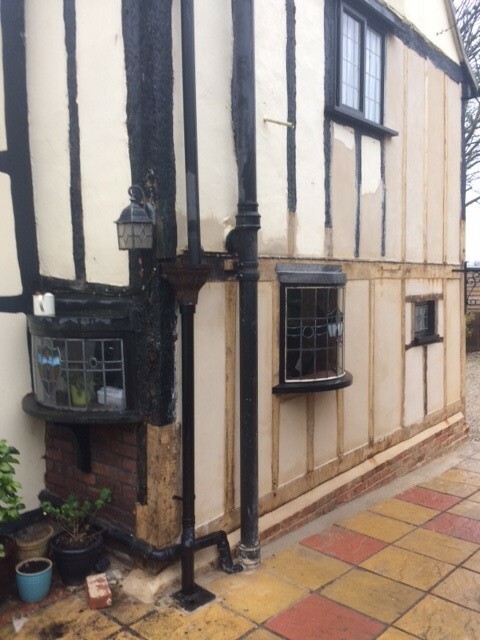 Outstanding items being the oriel window (currently boarded up), the outside lamps, the downpipe from the bathroom and the exterior decoration. 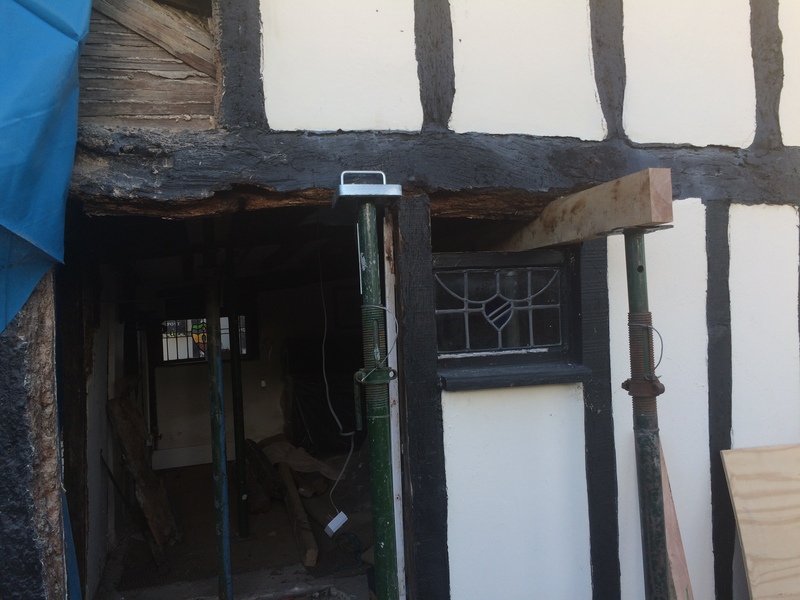 The photographs show the new frame, and the joins with the retained portions of the old frame. There's also a photo showing the similarities between the Tudor lath-and-plaster (which is overlain with a thin layer of brick), and the modern equivalent (which isn't). 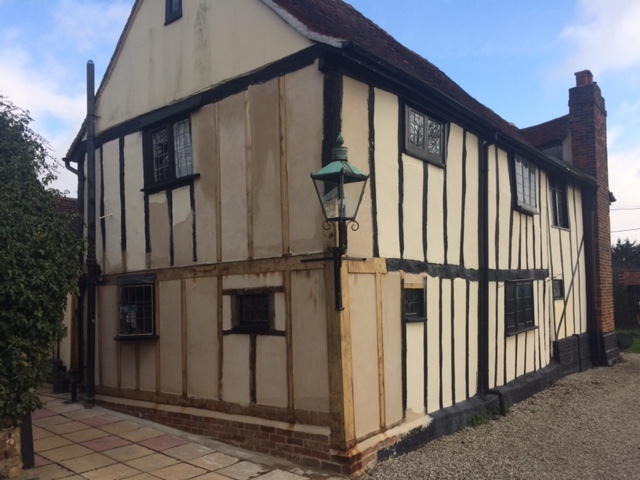 The front of the property is complete. 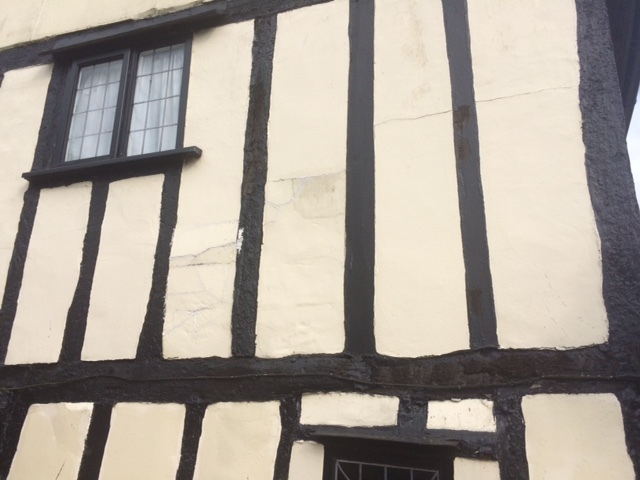 The faux beams are not to be painted on as they were before the restoration, as the lime-wash would 'run', so the facade looks somewhat plain. 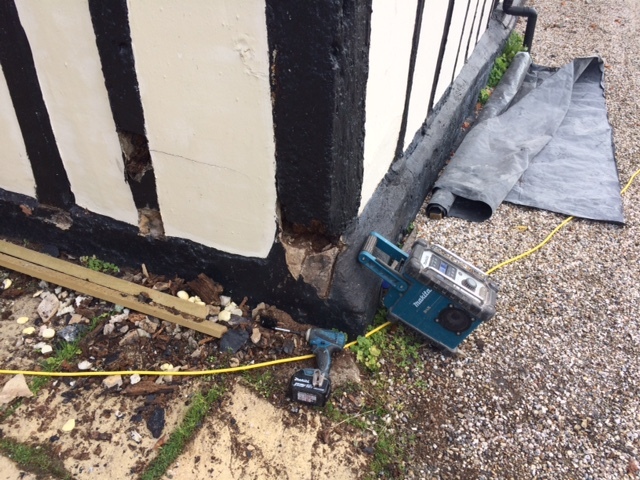 Shows the repair to the corner post, and the new sole plate, bressummer, studs and rebuilt plinth. 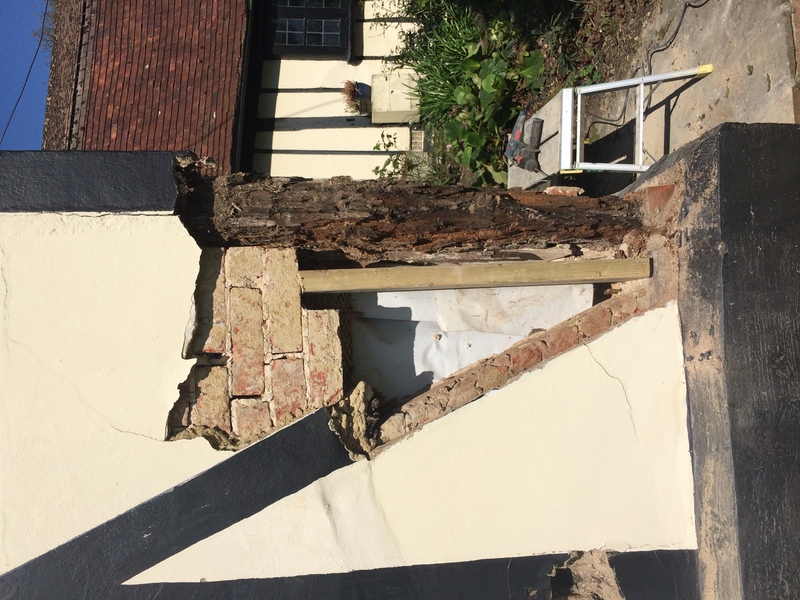 Repairs to the corner post and the 'return' to the long side wall. 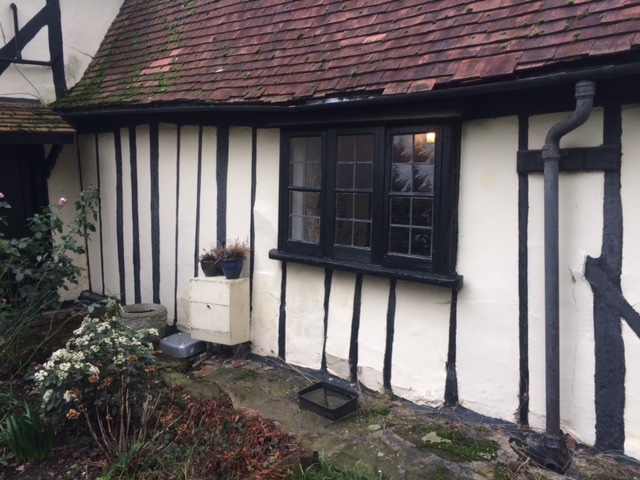 Some old wood used to re-house the small window, but otherwise green oak. 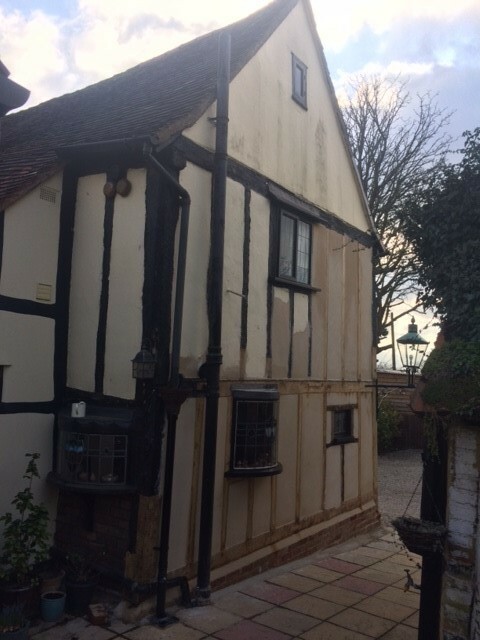 The rear of the house, complete bar the items noted above. 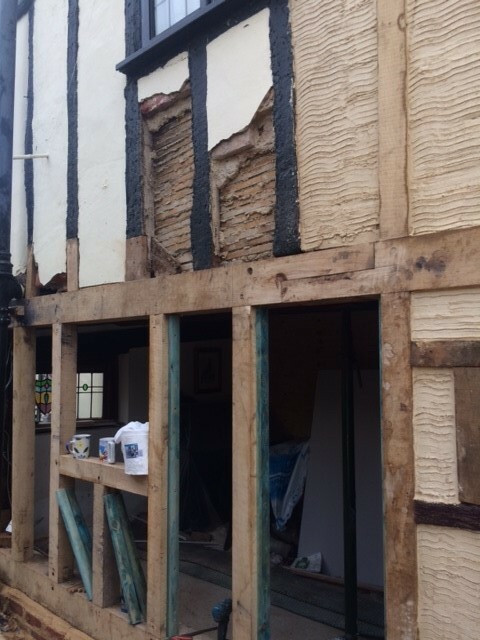 Shows the similarities between the Tudor lath-and-plaster (which was overlain with a thin layer of brick), and the modern equivalent (which isn't). 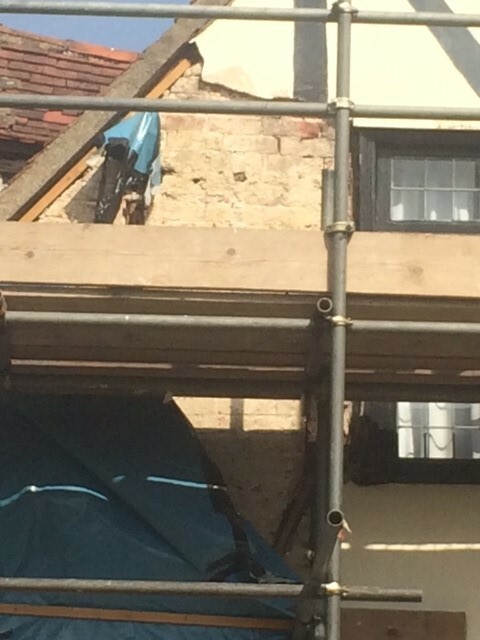 Close-up showing the gap awaiting the rebuilt oriel window. 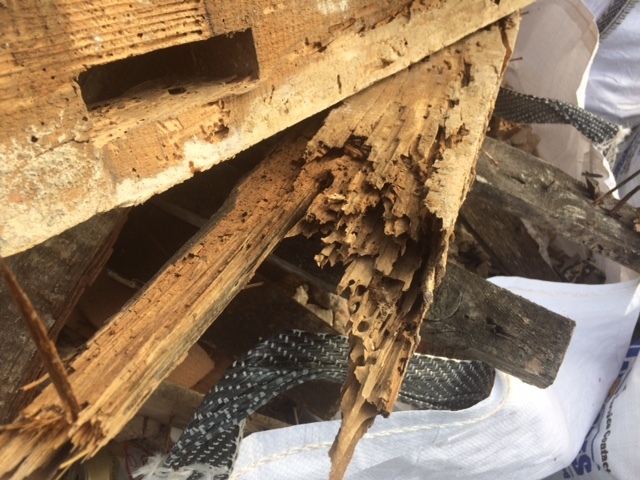 Close-up of the joint in the rear left-hand repaired post. View - inter alia - of the repaired studs, showing the state of those left in situ. 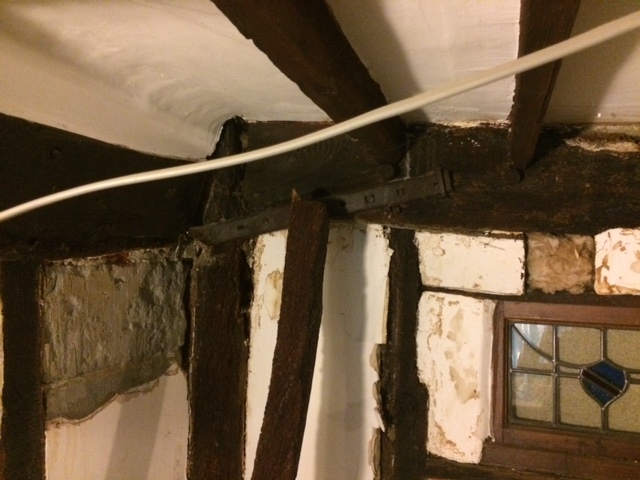 Shows the joint connecting the two halves of the replacement bressummer. 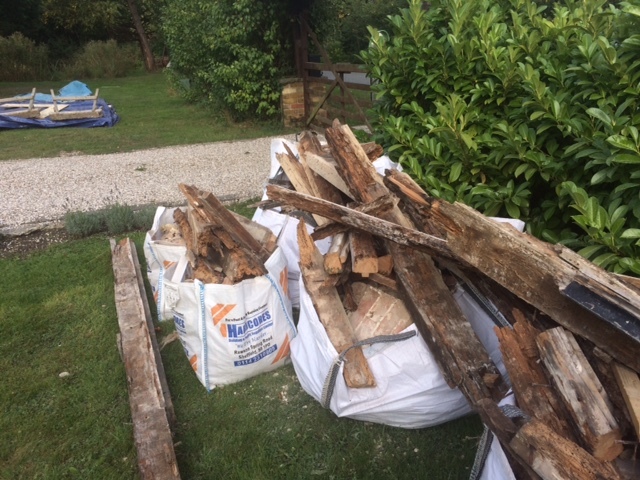 As adjacent, plus Steve the Plumber! 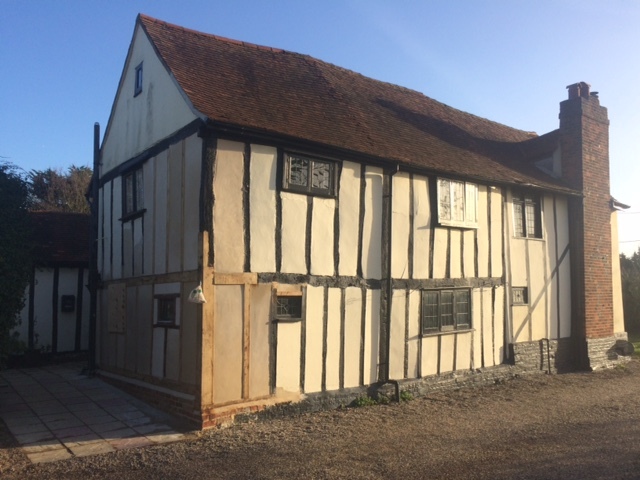 The finished front façade. 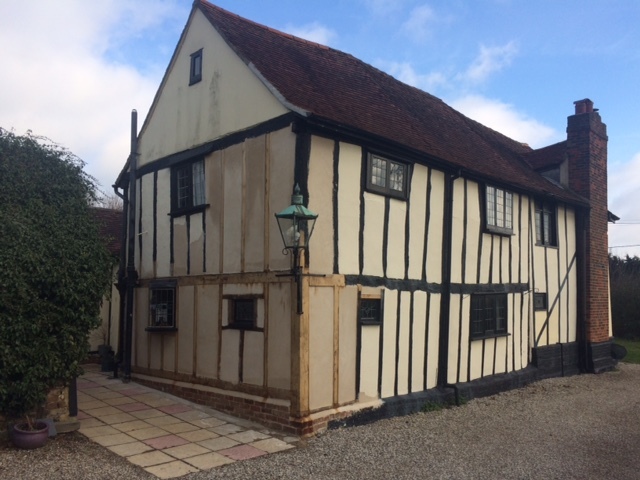 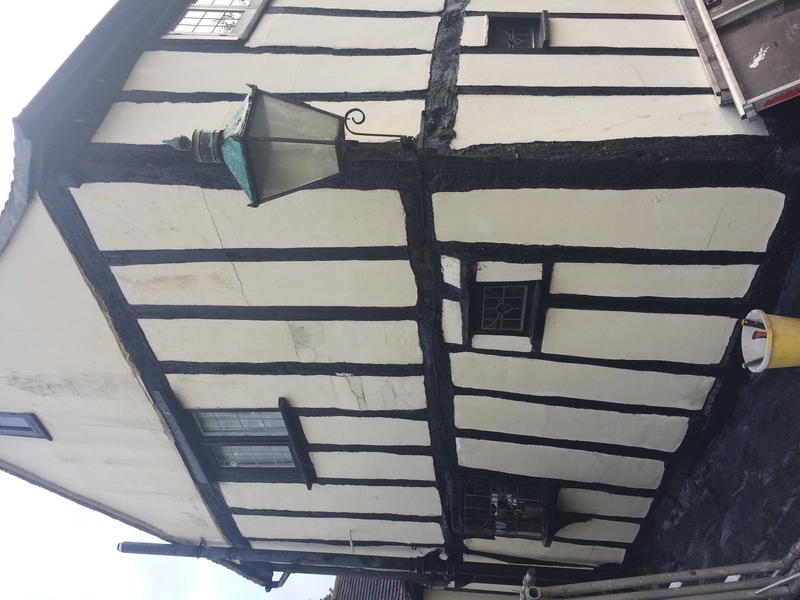 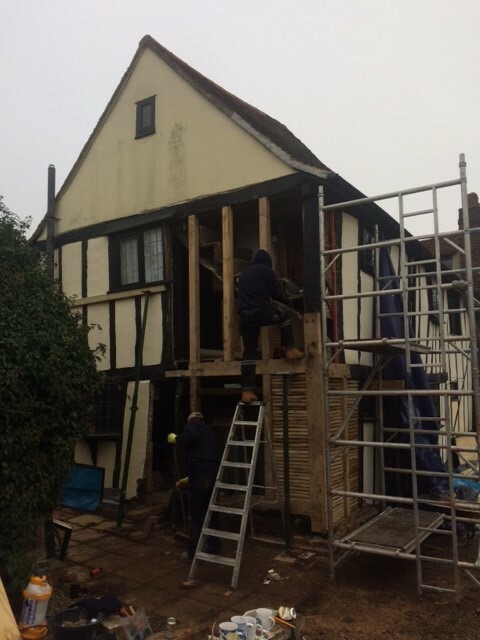 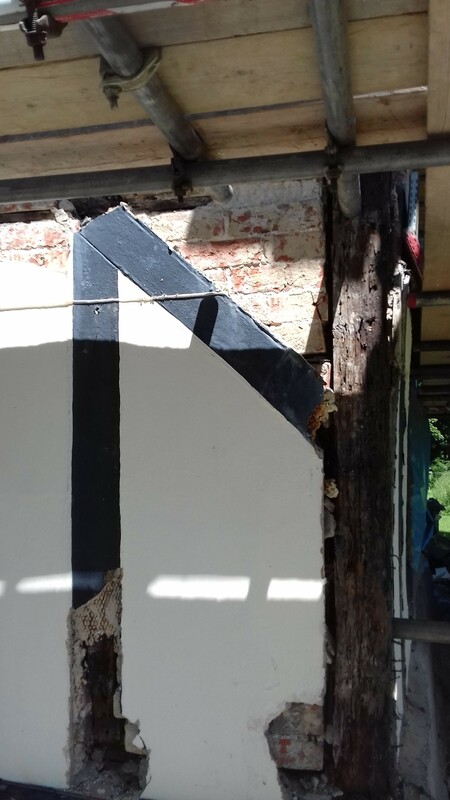 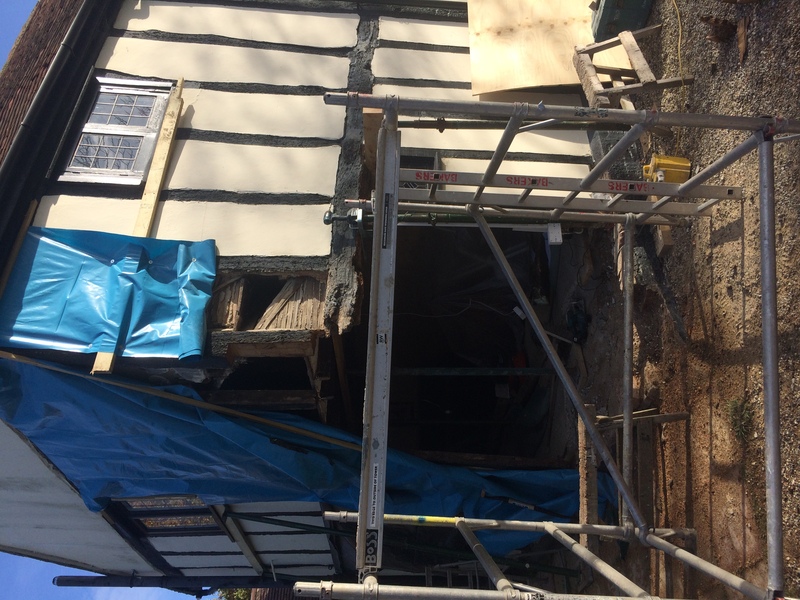 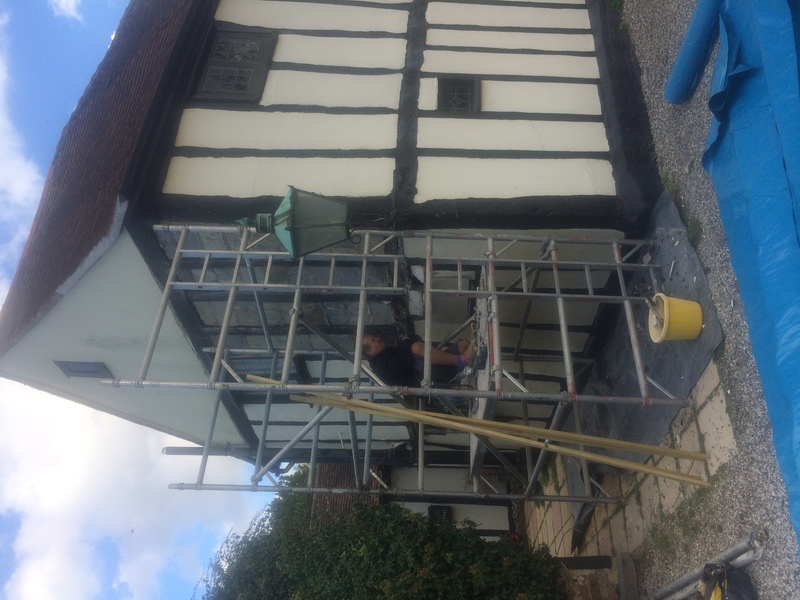 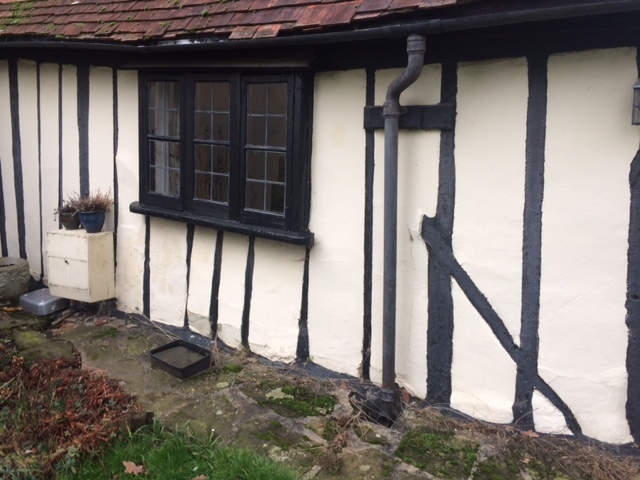 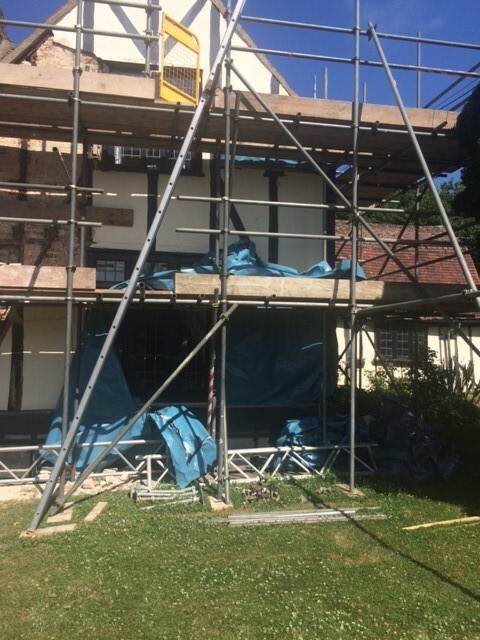 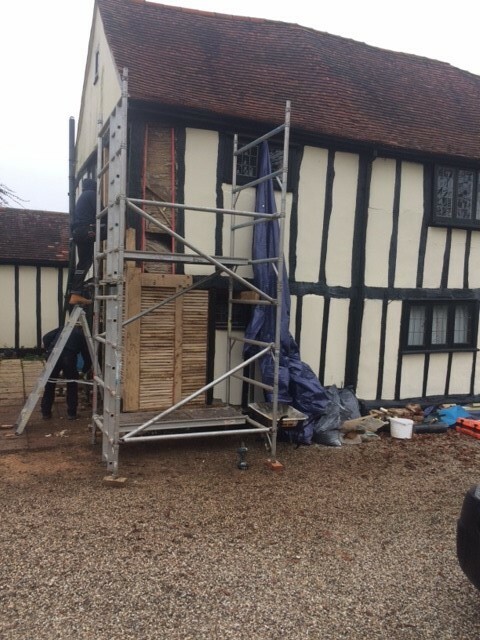 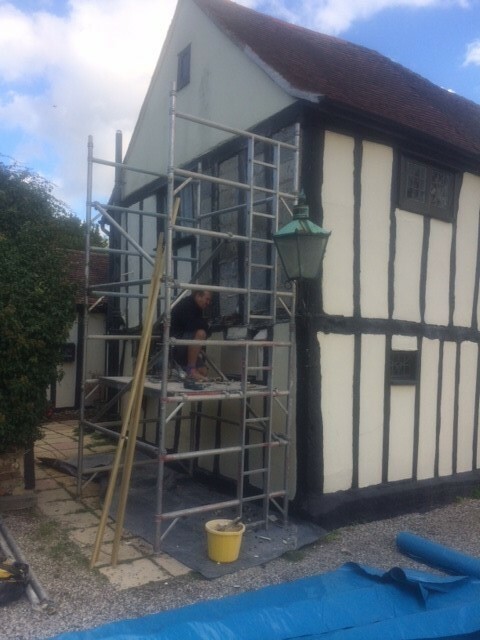 Somewhat plain as the faux beams cannot be painted on with lime-wash.
Reconstitutive repairs to the rear of the property were underway towards the end of the month. 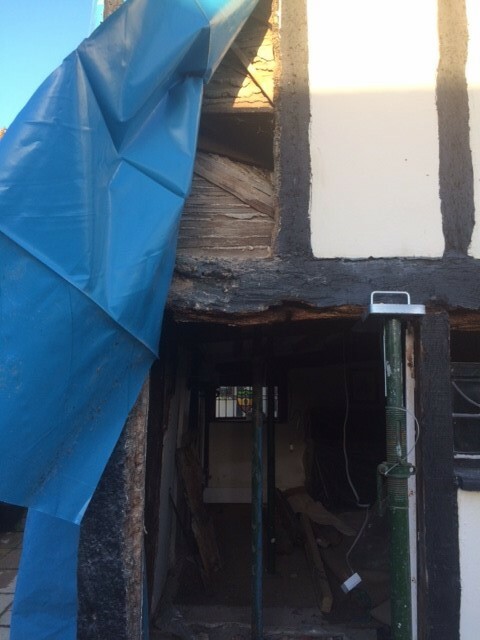 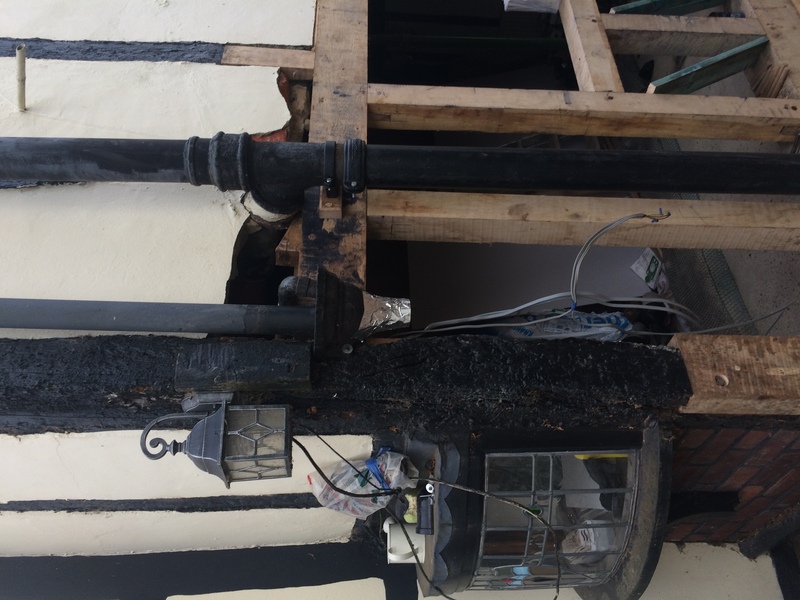 The photos further down show the extent of the damage to the timber frame to the rear of the property. 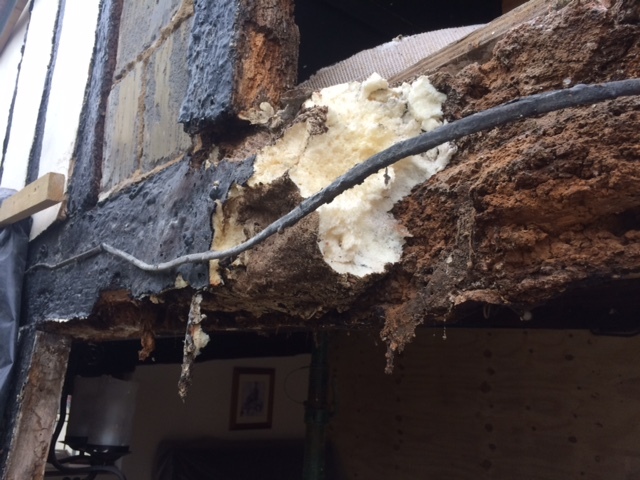 Note in particular the expanding foam used to disguise the complete failure of the main supporting bressummer. Sole plate yet to be bedded-in. 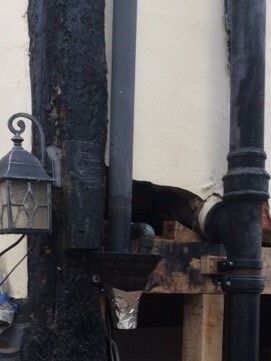 Corner post repair awaiting installation. 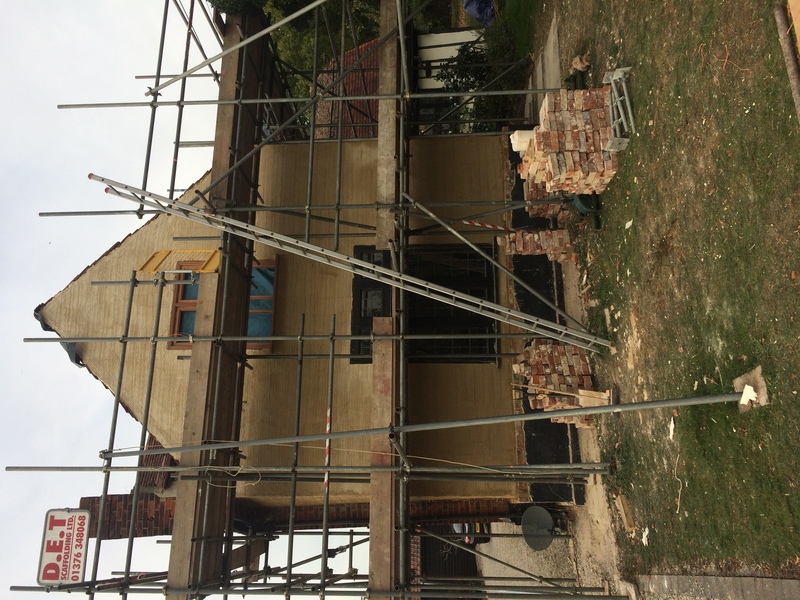 Right-hand-side back wall and return complete bar a second coat of lime plaster. 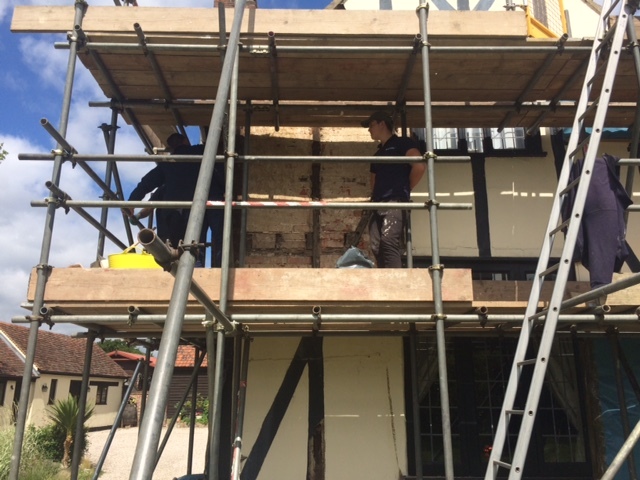 Repairs to the supporting studs for the stair well going up to the attic. Cupboard under the stairs. 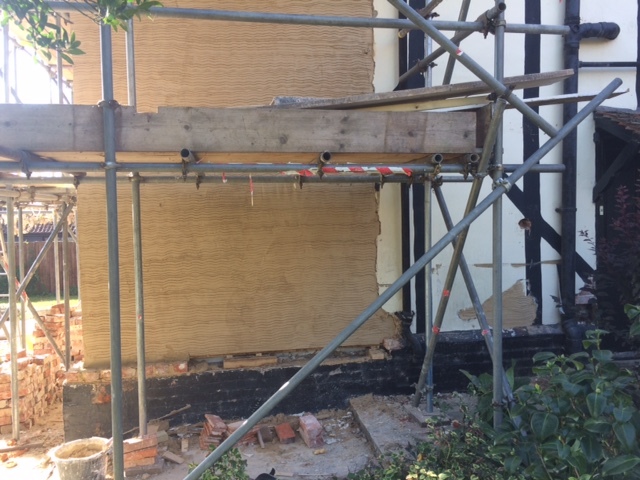 Work starts on the right-hand side of the back wall now the corner post is secure. Compare & contrast Tudor and replacement laths. 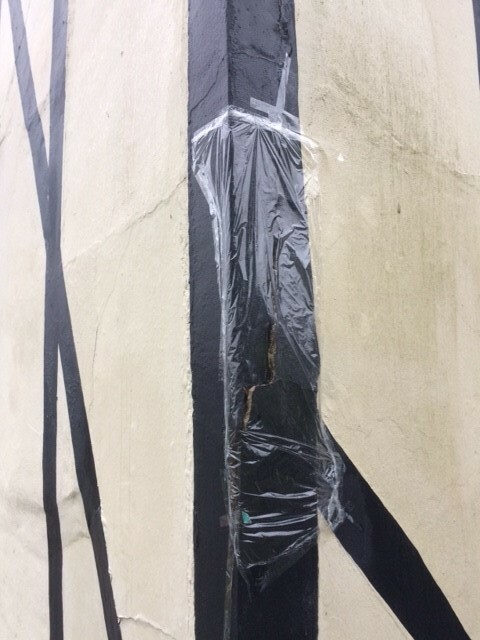 Note corner-post & bressummer joints. 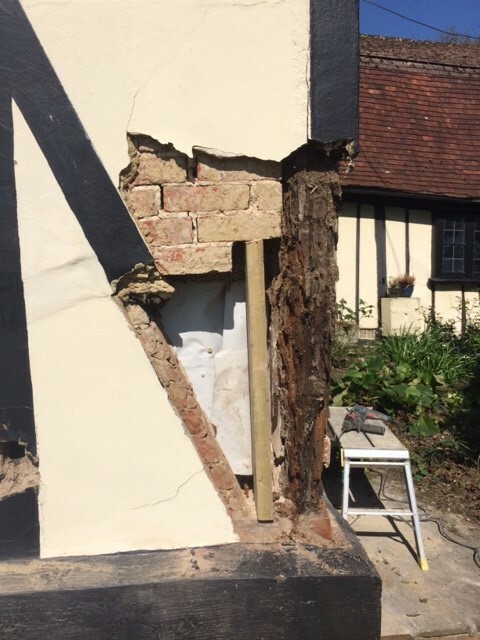 Retained section of right corner post awaiting the new section and jointing to the retained side bressummer. 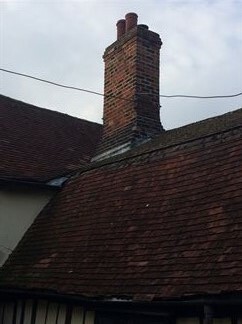 The attempt to join as shown in the picture was later abandoned. 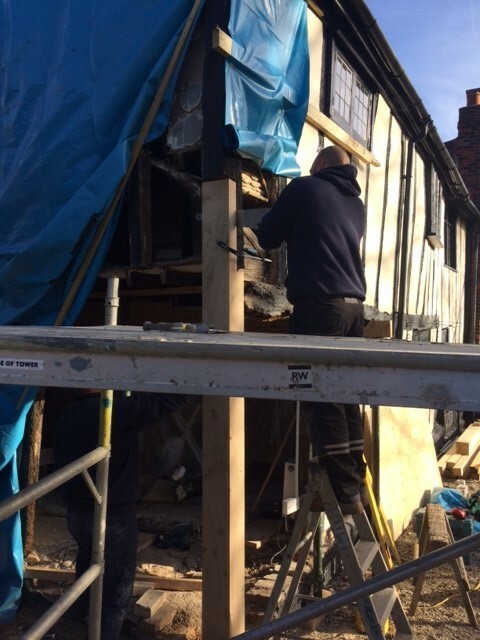 Greg the Head Carpenter fine-tuning the joint for the new section of the corner post. 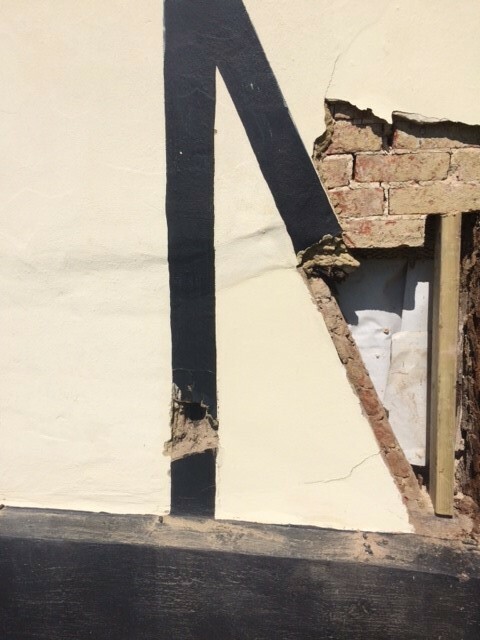 Shows the extent of the damage to the timber frame to the rear of the property. Decay above the oriel window, as revealed by exploratory work. 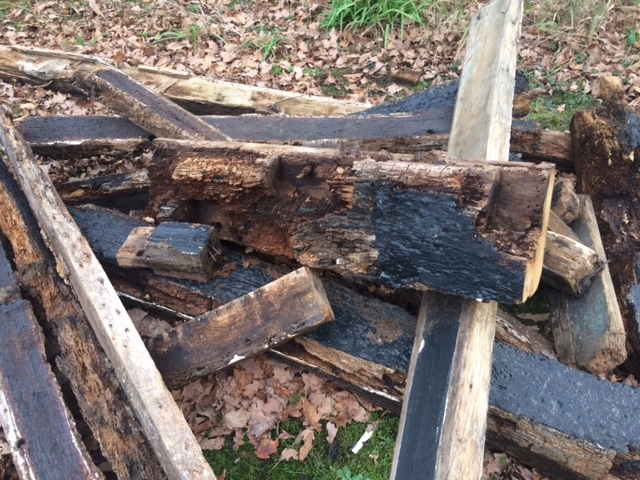 As adjacent, also showing the bituminous 'gloop' used to cover up the decay. 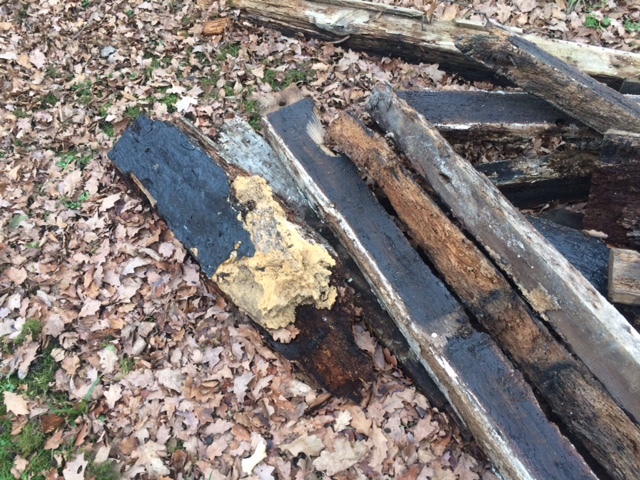 The surviving bressummer timber - such as it was - looks weaker than the expanding foam! Bressummer replaced by expanding foam, painted over! 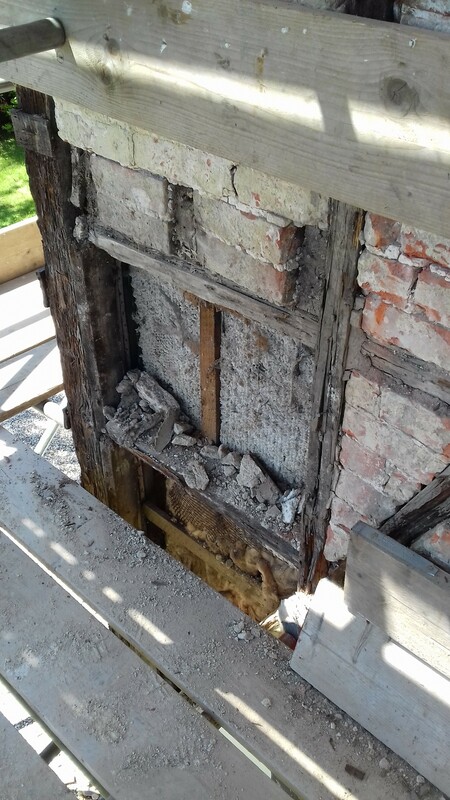 Interior of the back wall after initial excavation. State of the studs and sole-plate under the oriel window. Back wall viewed from interior after section removed: rotten base of stud; no sole plate. 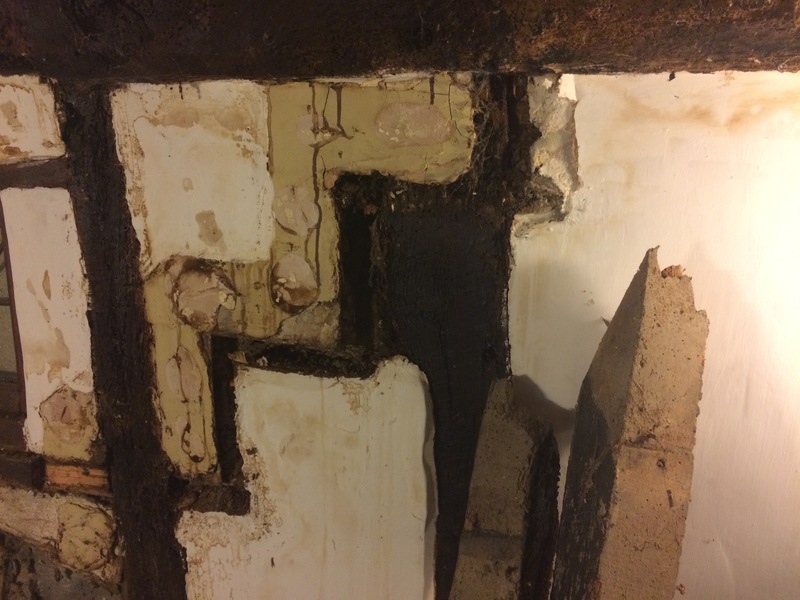 Wall & ceiling after 'staircase to nowhere' removed. 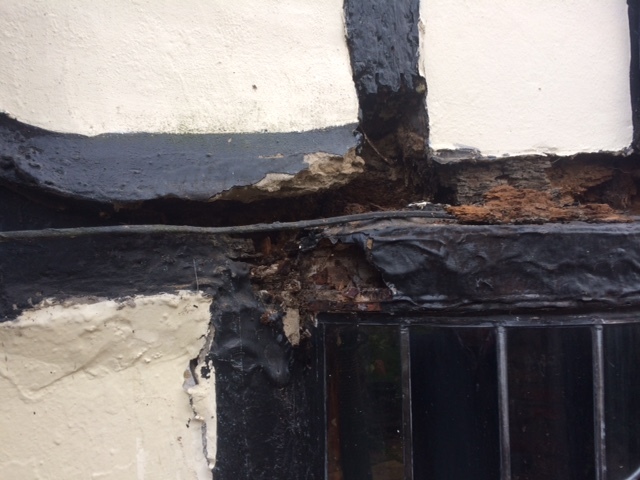 Evidence of an old structural repair, together with a modern 'foamy' bodge! 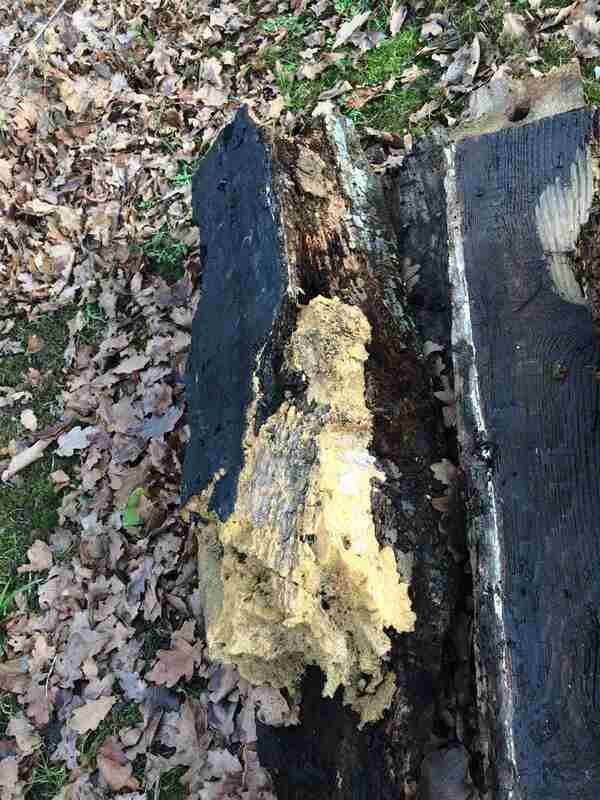 Residue of the right-hand corner post after cropping. 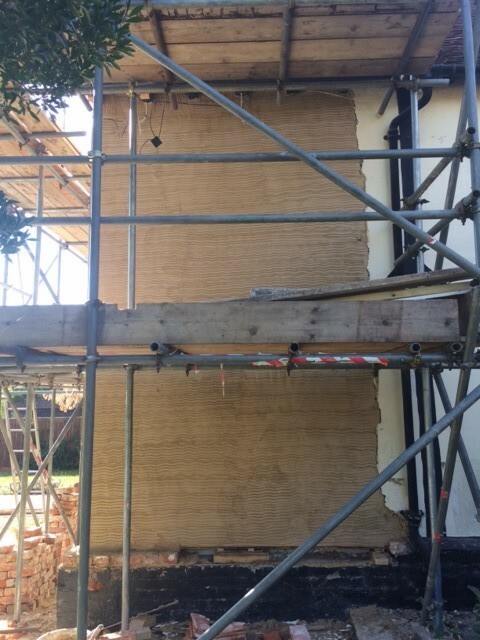 Side bressummer after removal of stud and panels. This will be cropped and repaired. 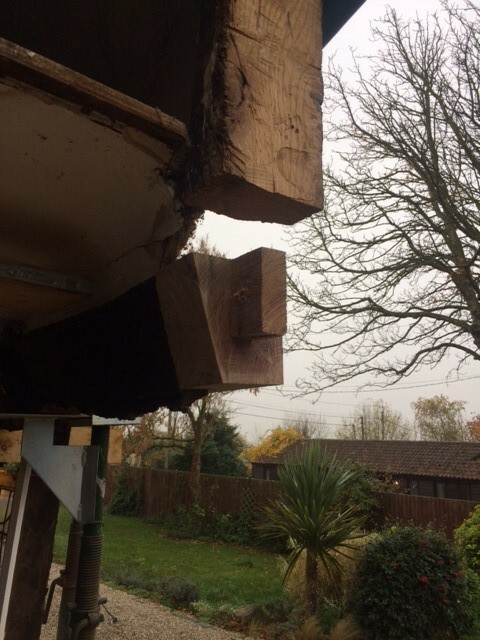 Close-up of the side bressummer now showing the next stud to the right, for which a small repair at the top will be supplied. 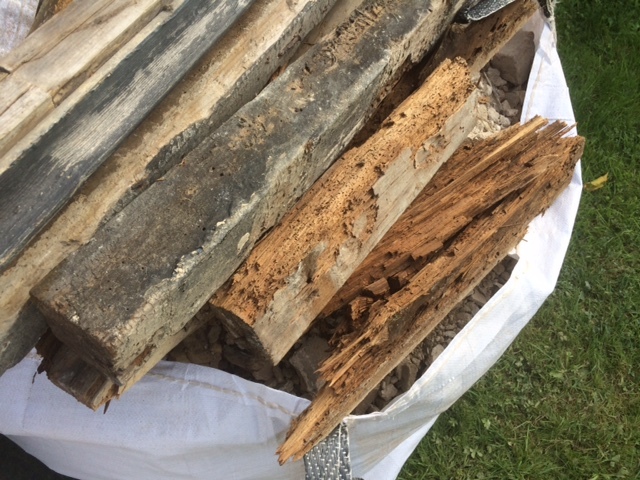 Close-up of the side bressummer from the inside. Looks OK this side, but the other side is terribly decayed. 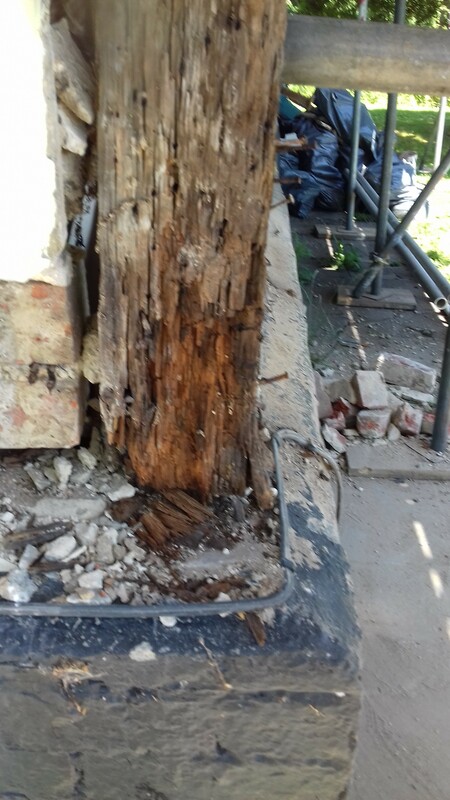 The other side of the to-be-repaired truncated corner post noted above. 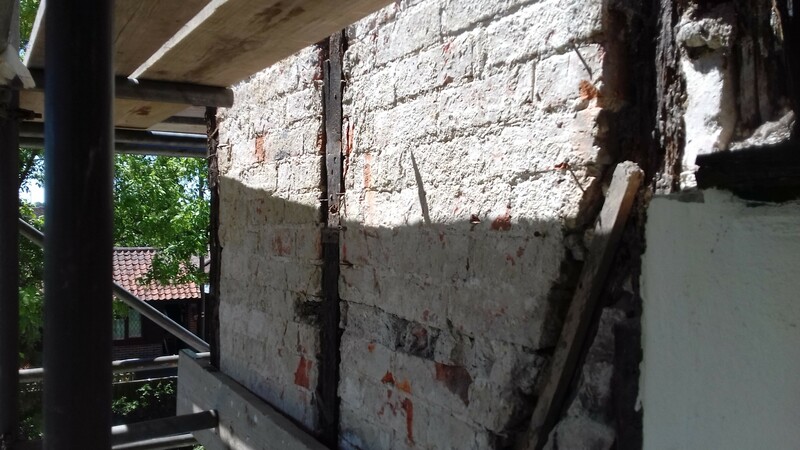 Shows the state of the 'foundations' of the right-hand rear corner after the removal of the side wall 'return'. 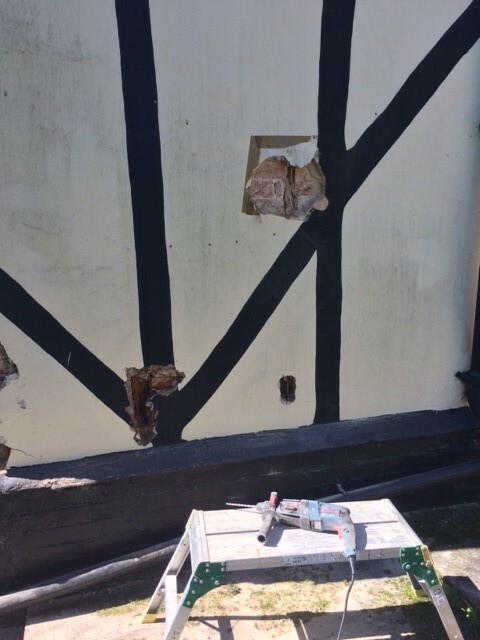 Right-hand rear corner after the removal of the lower half the the corner post and two ground-floor panels and central stud. 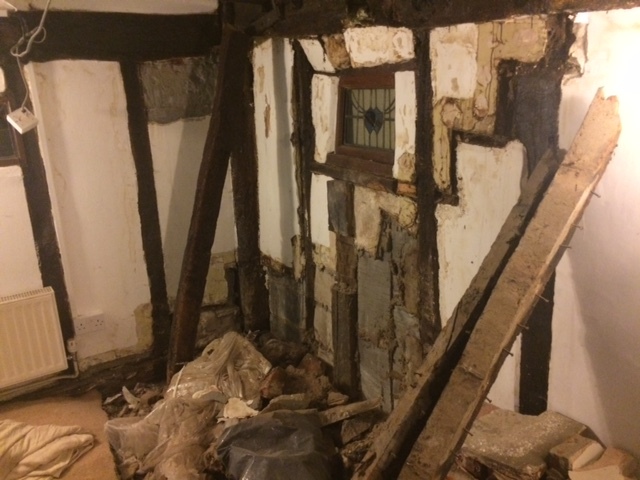 Right-hand rear corner after excavation and removal of rotten timbers. 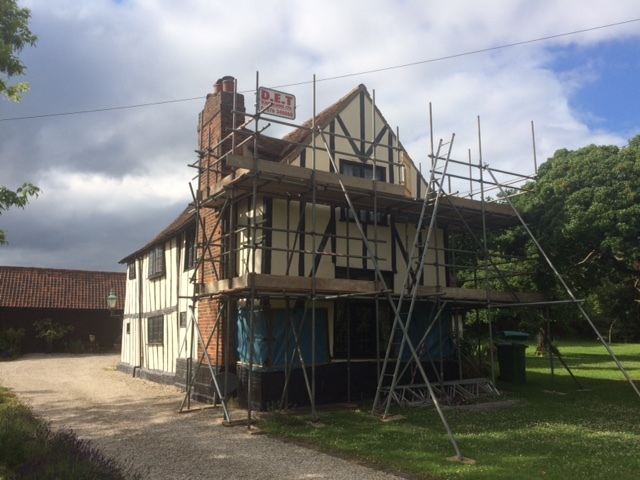 The soon-to-be-condemned piece of side-bressummer. 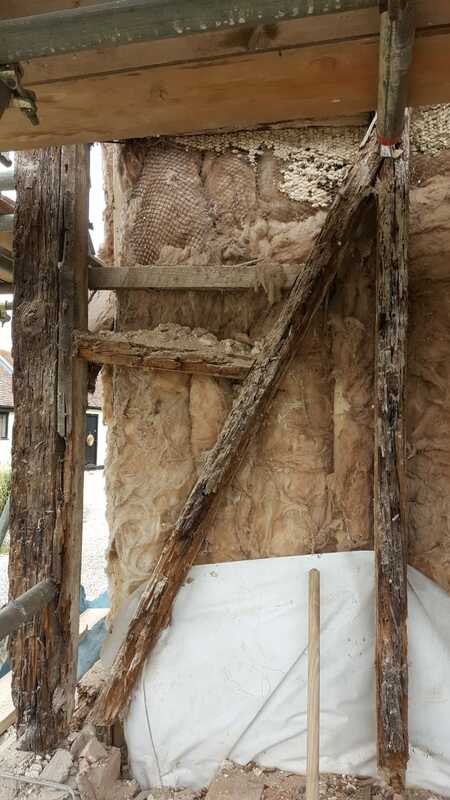 Old lath and plaster by the stair-well up to the attic. 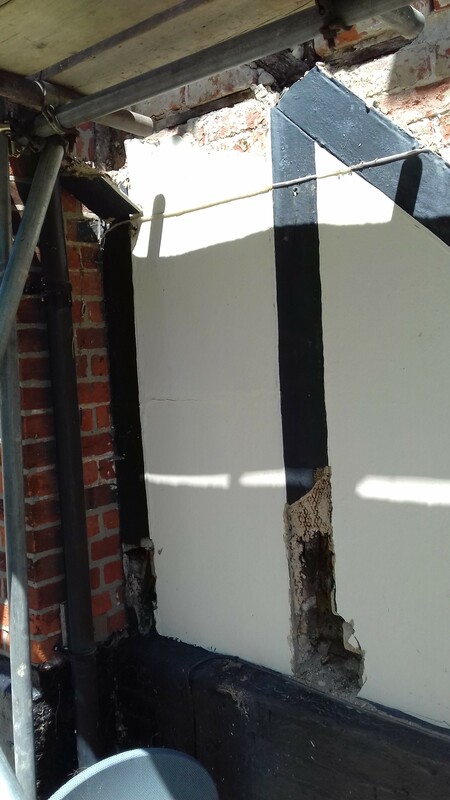 Temporary disruption to panel above the small window to the side-rear to allow support of the structure while the corner post is repaired. 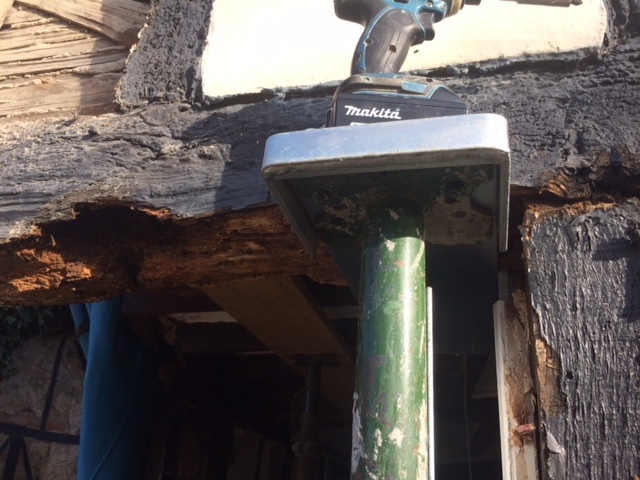 Corner post prior to removal - the weakness is hidden by the blue plastic. Right-hand rear corner post after excavation - showing loss due to rot and the need for amputation of the lower half. 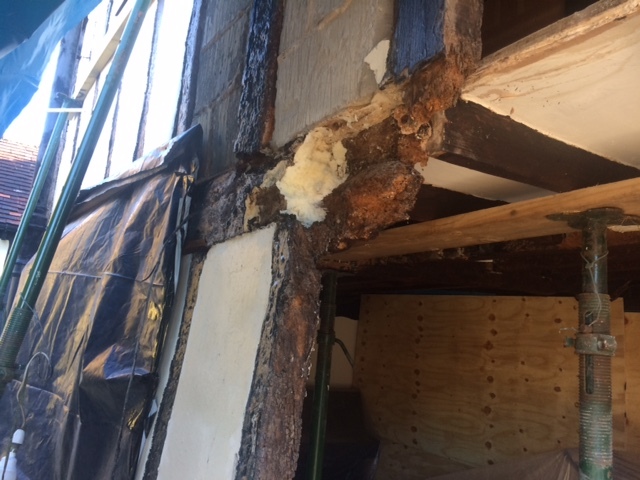 Modern studs and breeze block infill: evidence of fairly recent repairs to the rear right-hand corner by the stair-well to the attic. 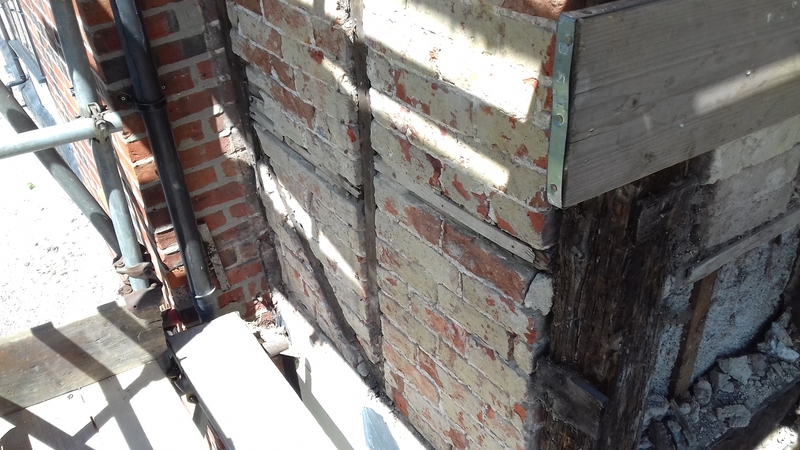 The back wall: breeze blocks, rotten wood and expanding foam. 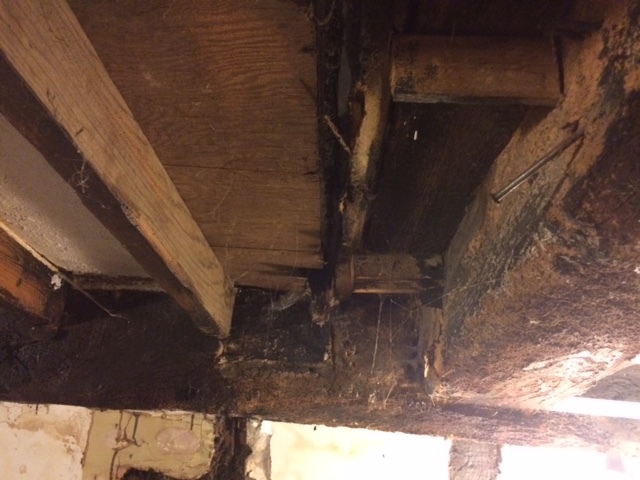 Modern ceiling joists inserted when the lower section of the staircase to the attic was blocked off (in the 1980s? 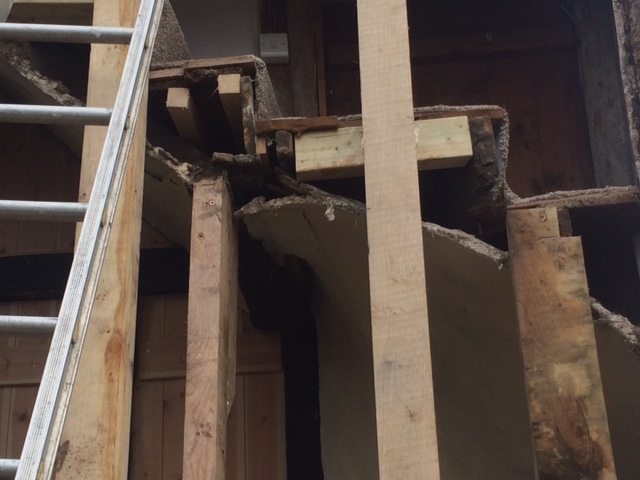 ), producing the 'staircase to nowhere'. 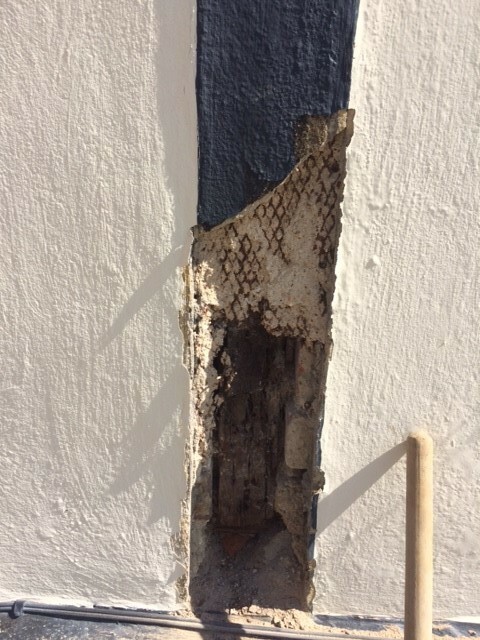 The right rear corner post - damage revealed after the bodged cement 'repair' had been removed. 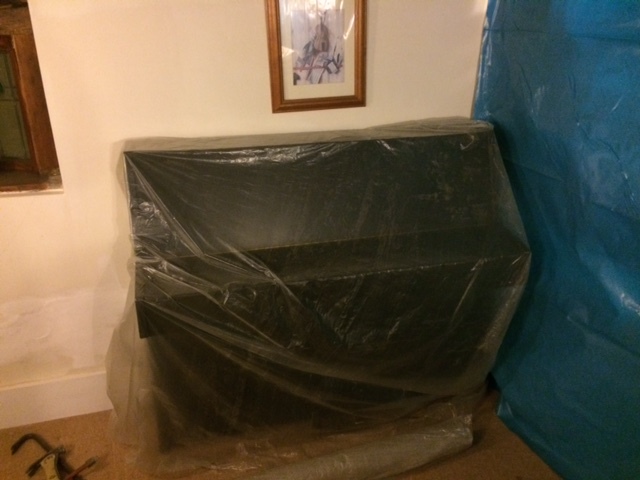 The piano protected against demolition dust. 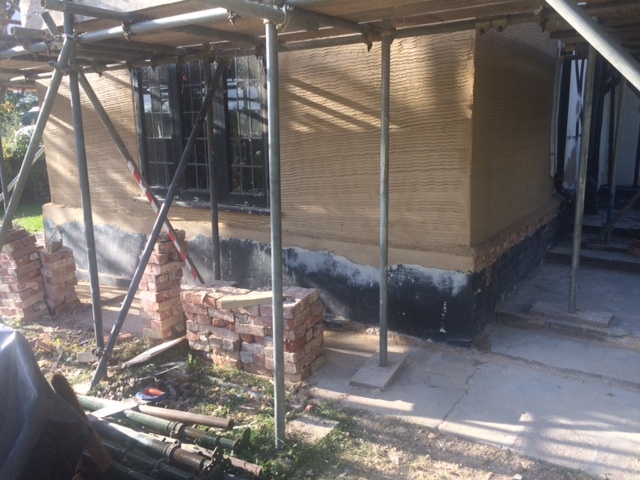 Also shows the rising damp in the modern brick wall behind to the left. An old repair to the corner - above the 'staircase to nowhere' - plus more modern infill! 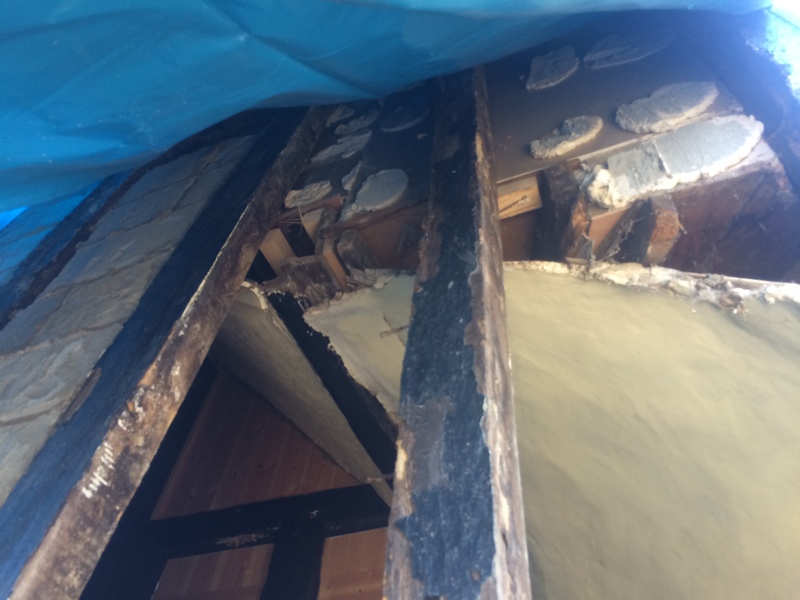 The ceiling after the 'staircase to nowhere' had been removed. 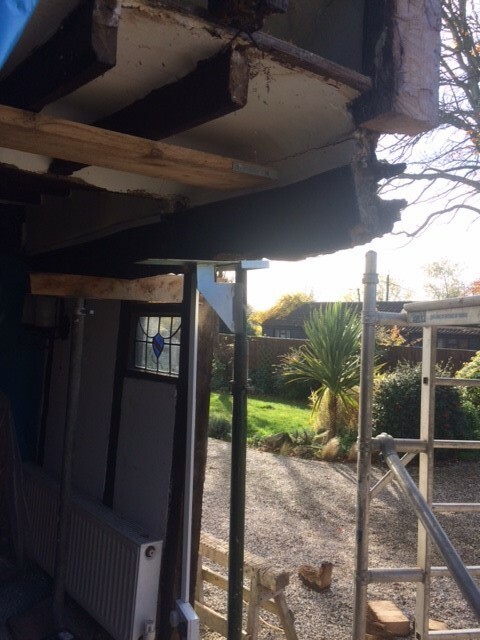 Shows the massive supporting beam is not supported by very much. 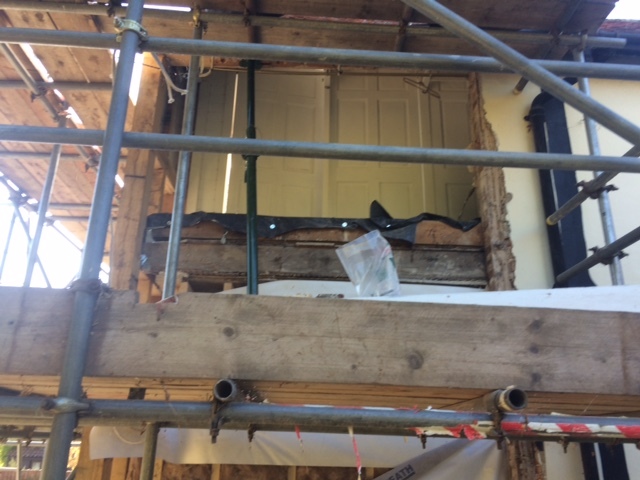 The inside of the back wall after the 'staircase to nowhere' had been removed. 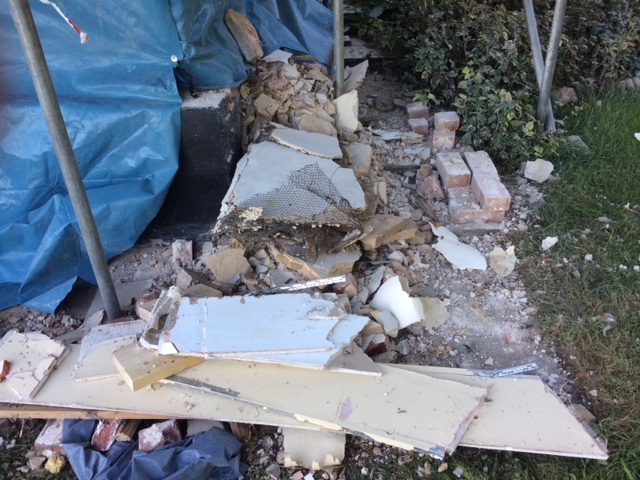 The base of the rear corner - soon to be demolished - after the 'staircase to nowhere' had been removed. 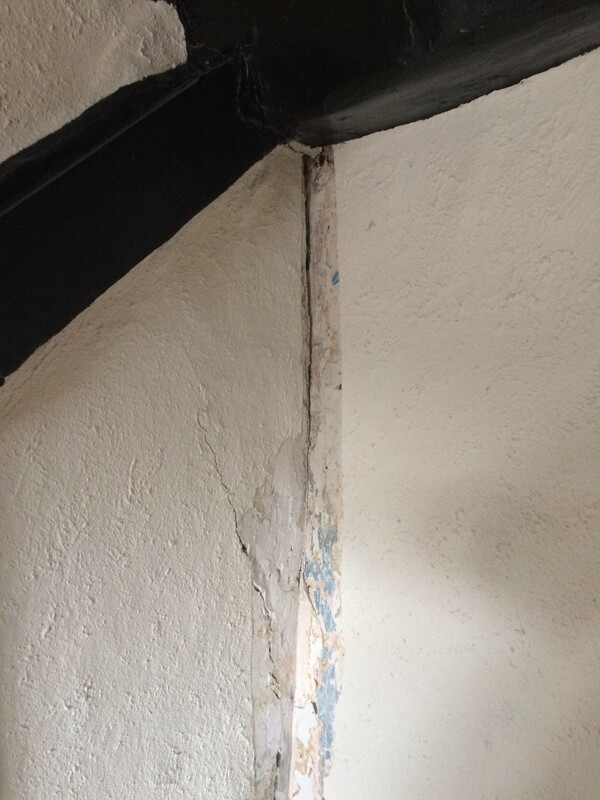 The corner after removal of the 'staircase to nowhere'. 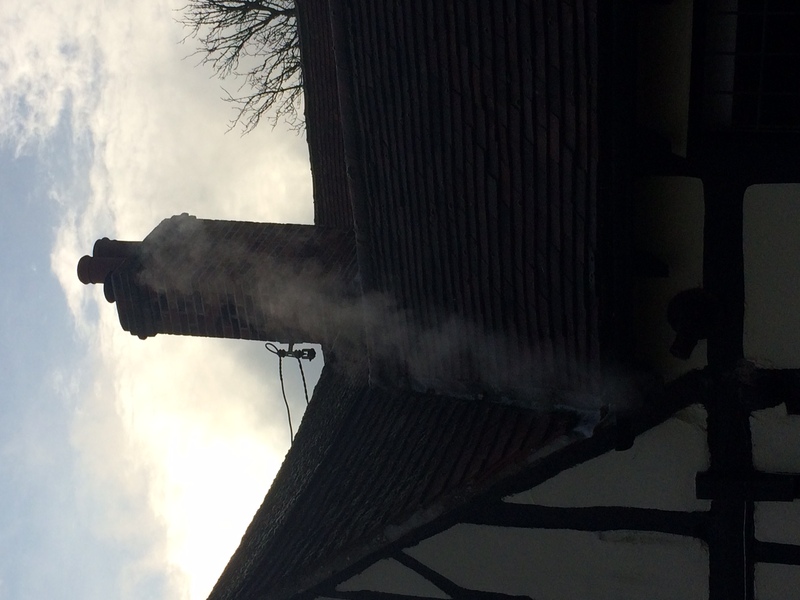 2018 - November - Chimney Lining? 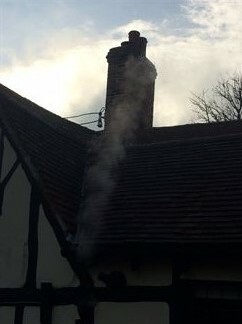 A few photos taken to try to persuade a company to line my lounge chimney - without success. The situation doesn't meet the regulations: no air brick, stove too large for the fireplace and too close to the wooden mantle-beam. 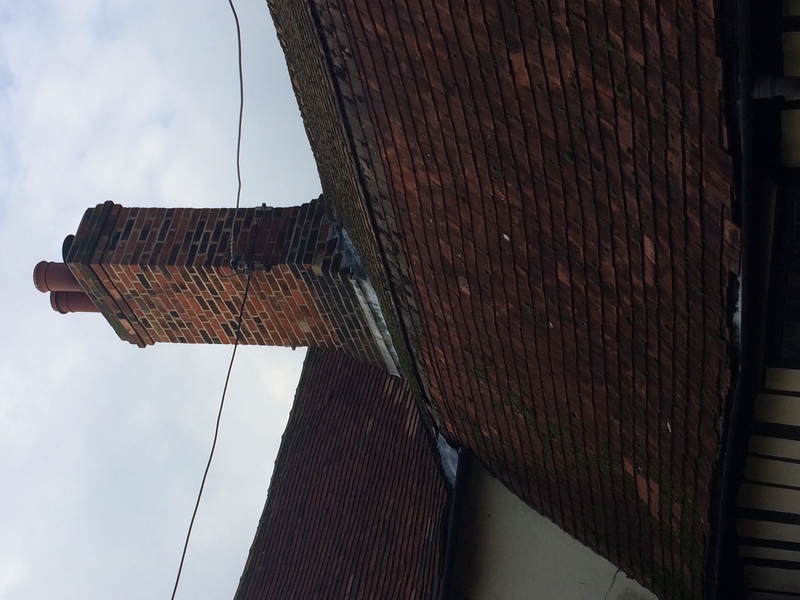 Also, the top of the chimney's really awkward to get to. 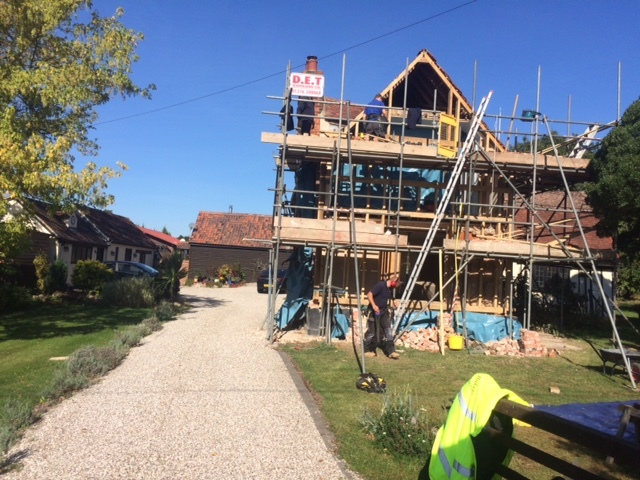 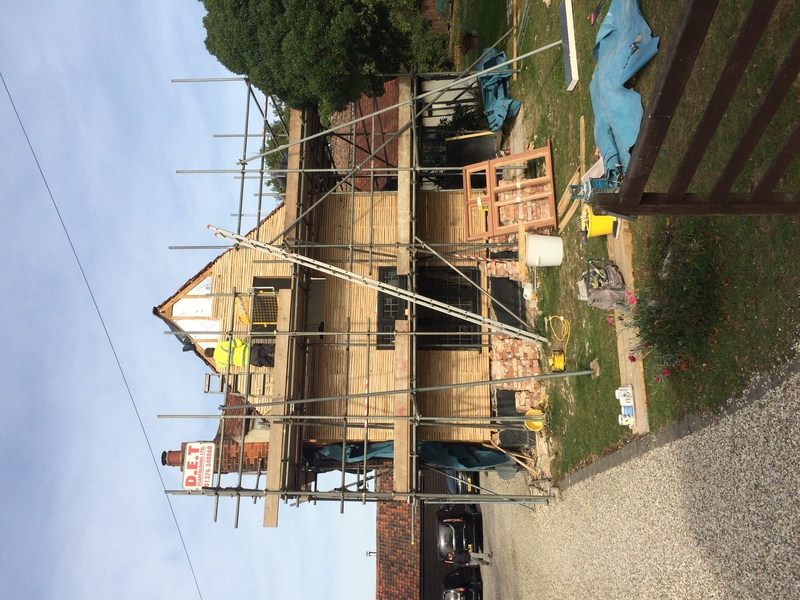 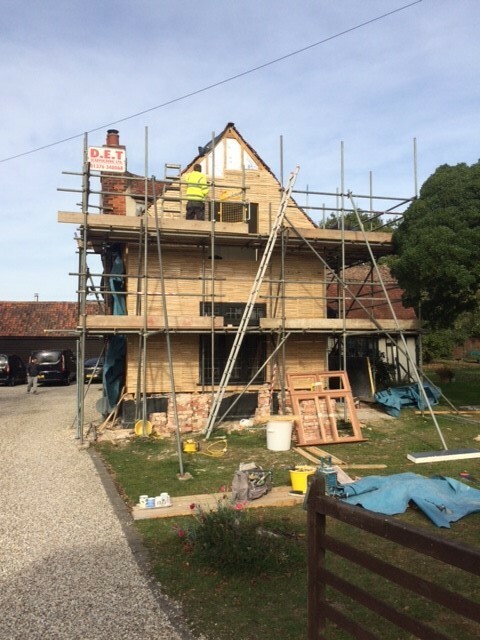 Shows the development of the work at the front of the property, nearing completion towards the end of the month. 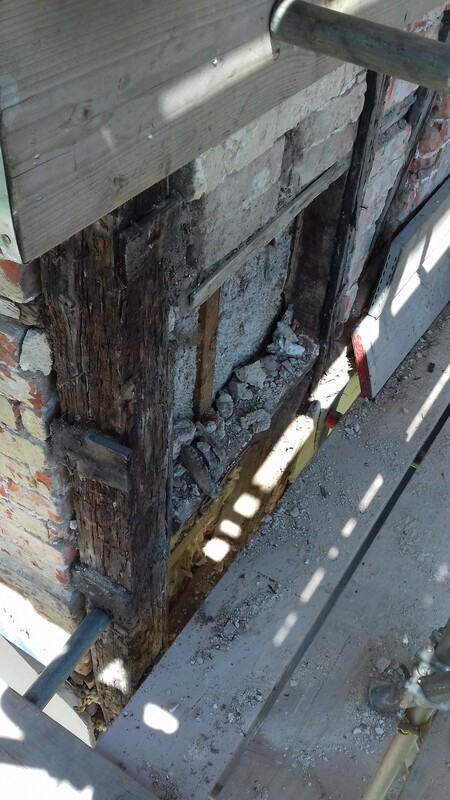 Also shows (next section) the preliminary investigative work at the rear of the property, with the initial bad tidings confirmed when restoration commenced in November. 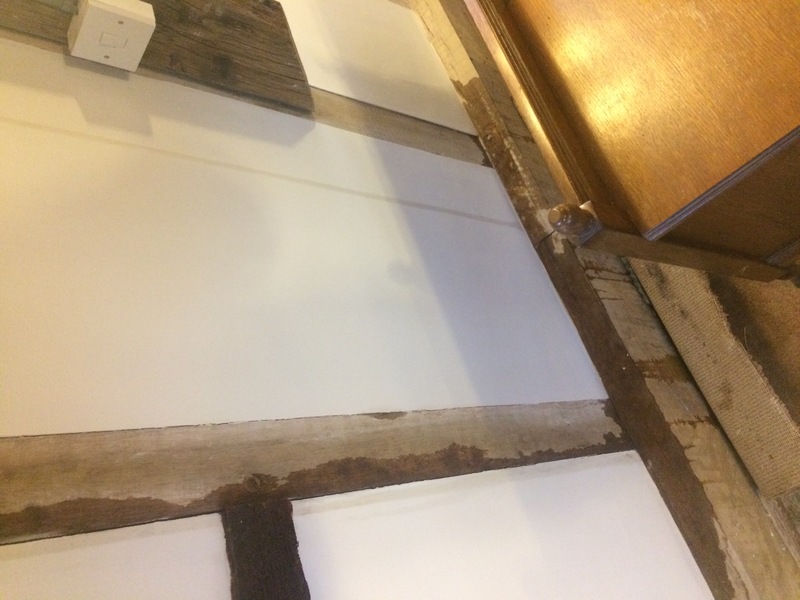 The original 'failed' corner (and much else) after lath-and-plastering. 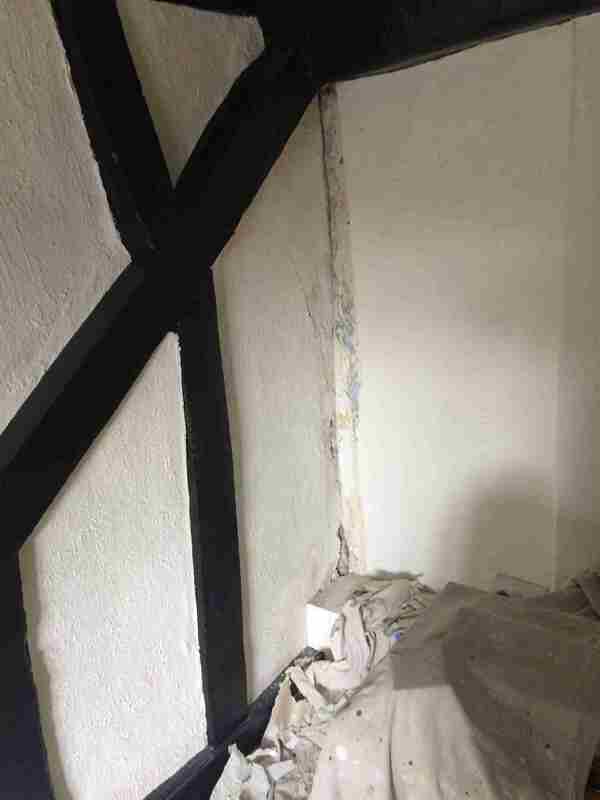 The front wall after a first coat of plaster. 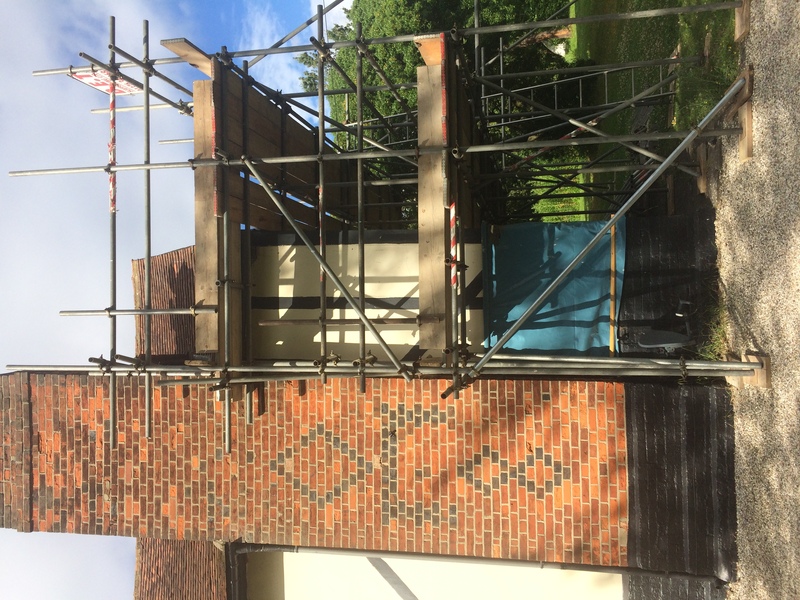 The tiling is still outstanding on the right. 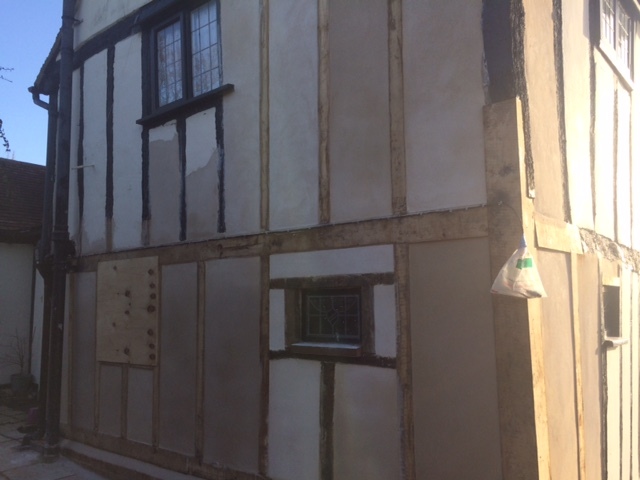 The new font wall viewed from the left. 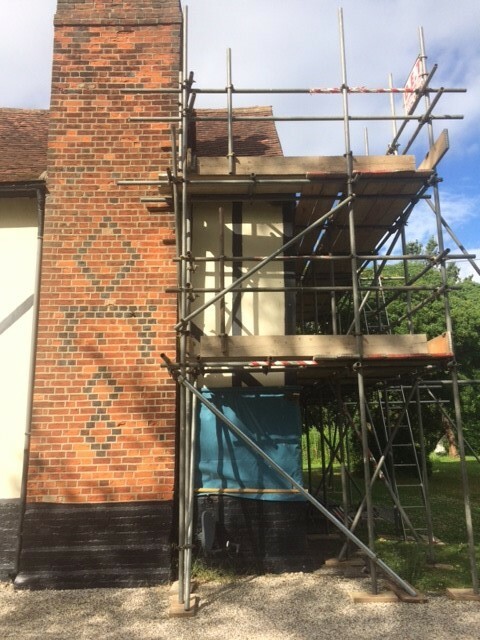 The left tiling is complete. The Bakers Gang: Gary, X, Keith, Y, Greg, Leslie, Morgan. 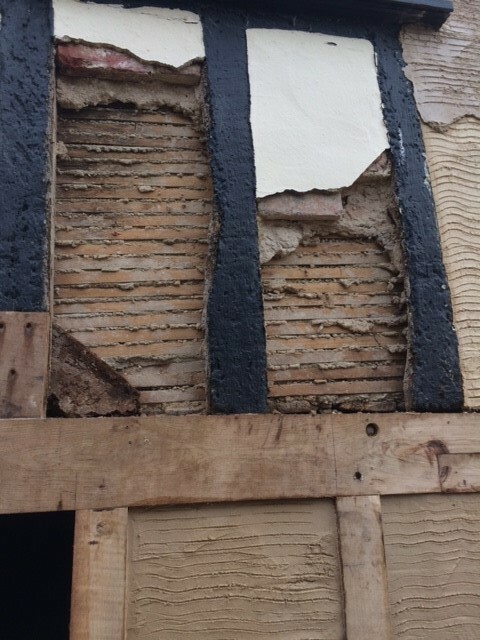 The right-hand 'return' after lath-and-plastering. 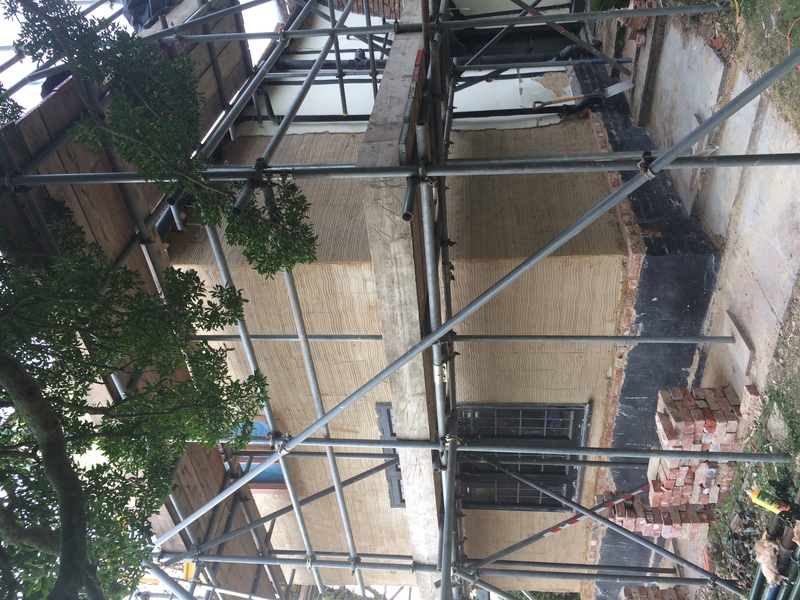 Plinth restored. 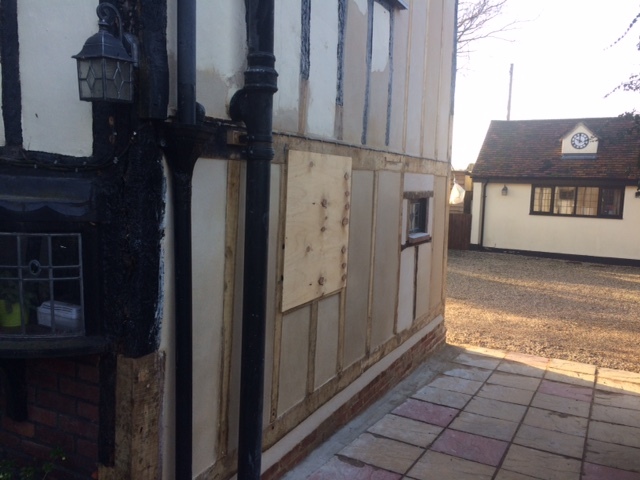 Another view of the rebuilt 'failed' corner. 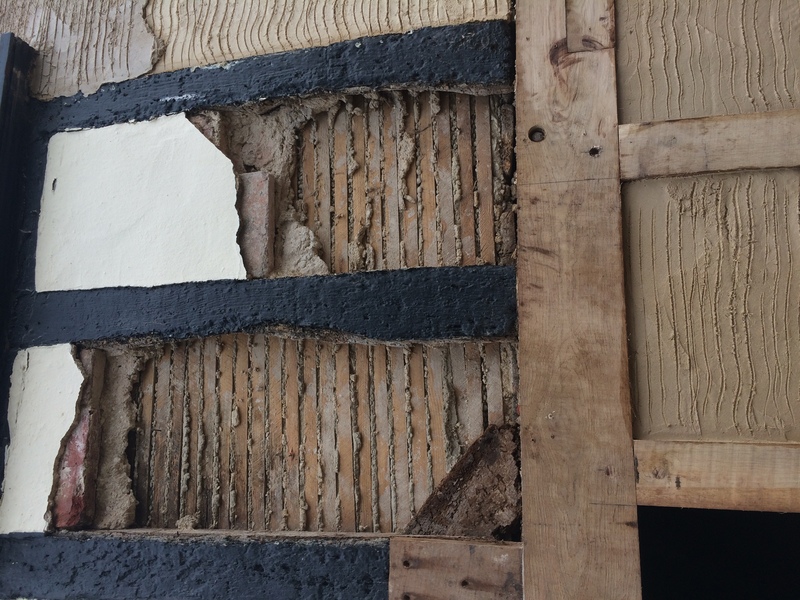 The front wall after lath-and-plastering. 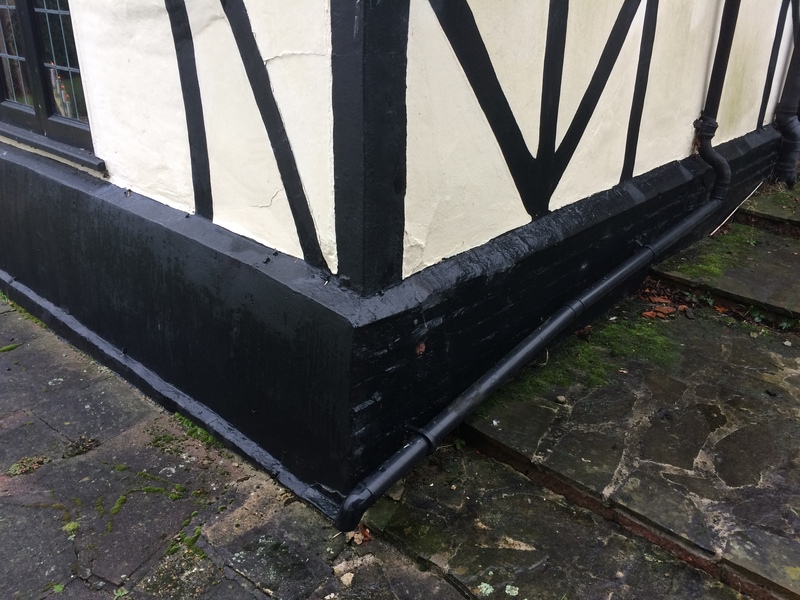 Plinth repaired. 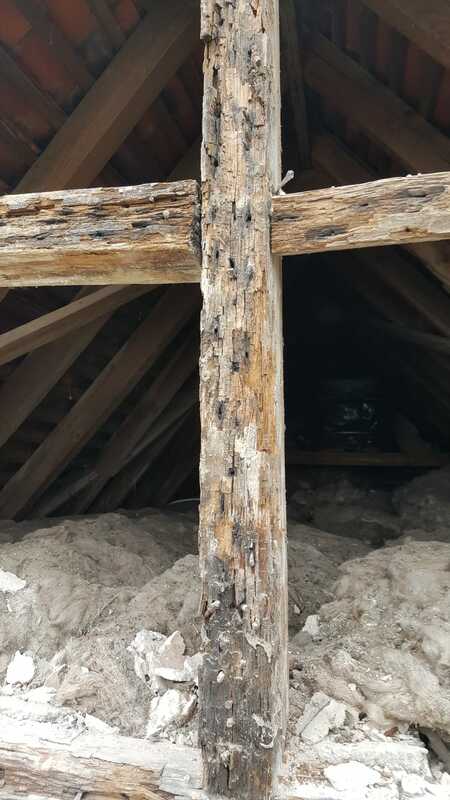 Roof yet to be fixed. 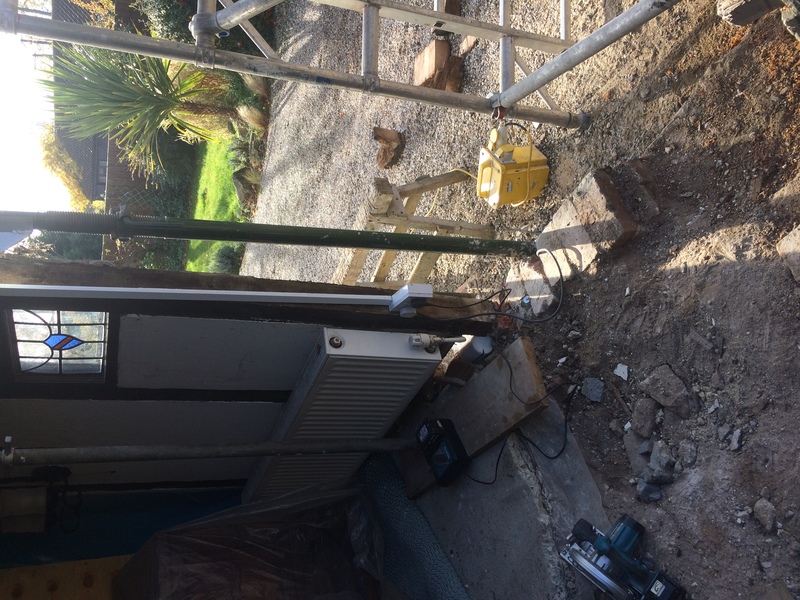 The right hand 'return'. 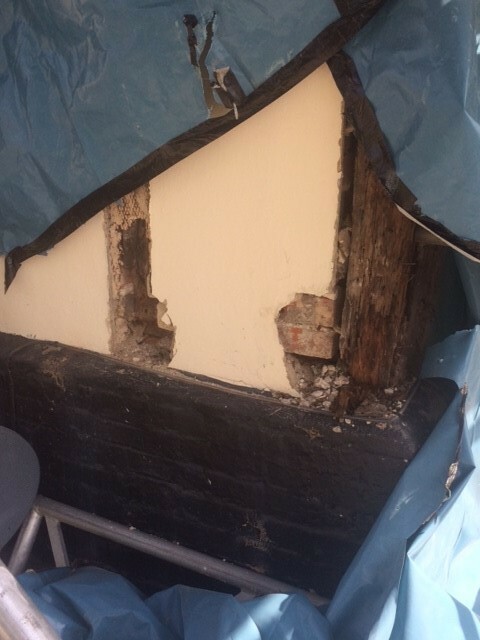 Plinth still to be repaired. The front. 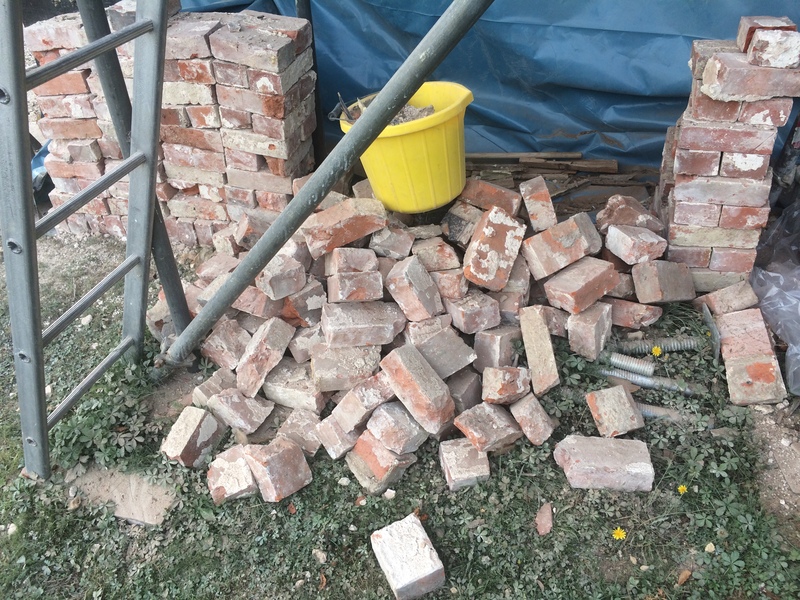 Note the brick infill - the rescued bricks - broken bricks ended up in the skip. 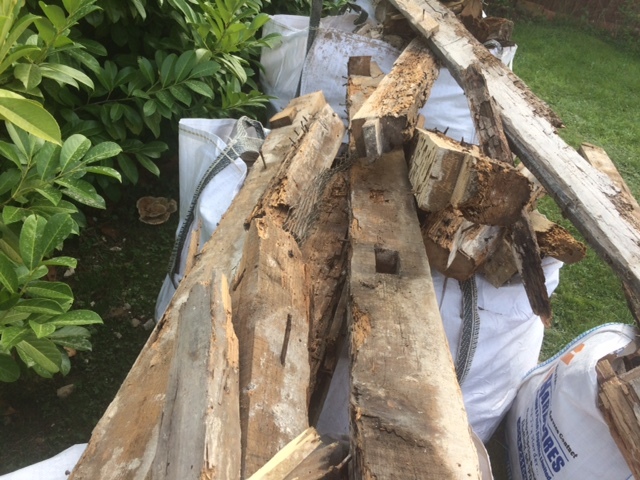 The left-hand 'return'. 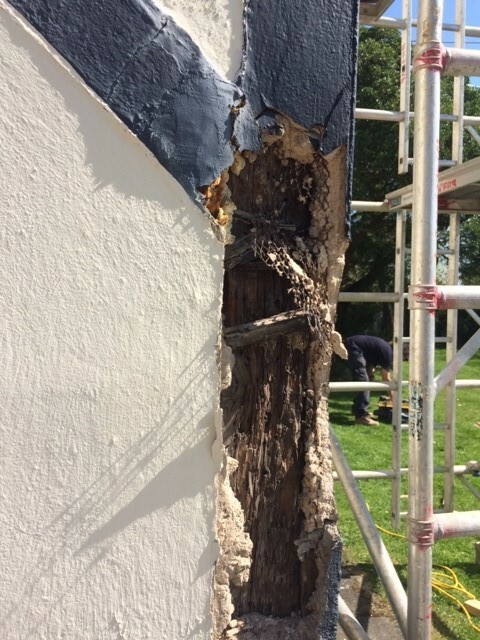 Plinth yet to be repaired. 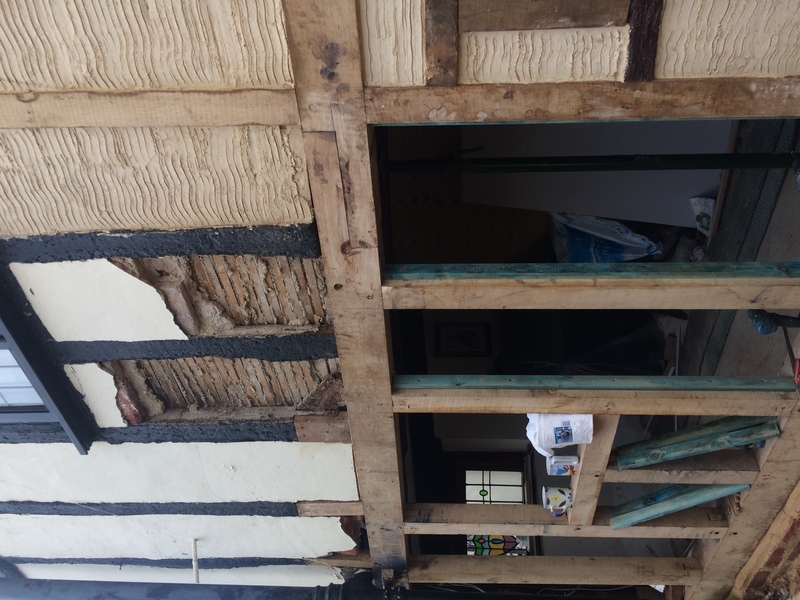 The laths prior to plastering. 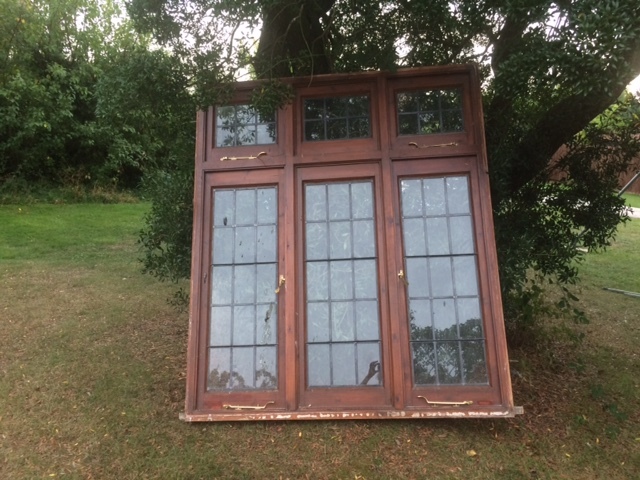 Plus the new bedroom window, awaiting glass to be re-loaded. 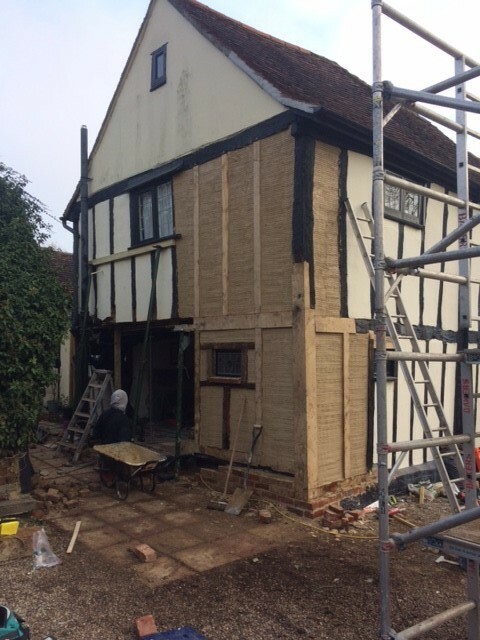 Finishing the laths. Note the 'modern' insulation in the gable-end. 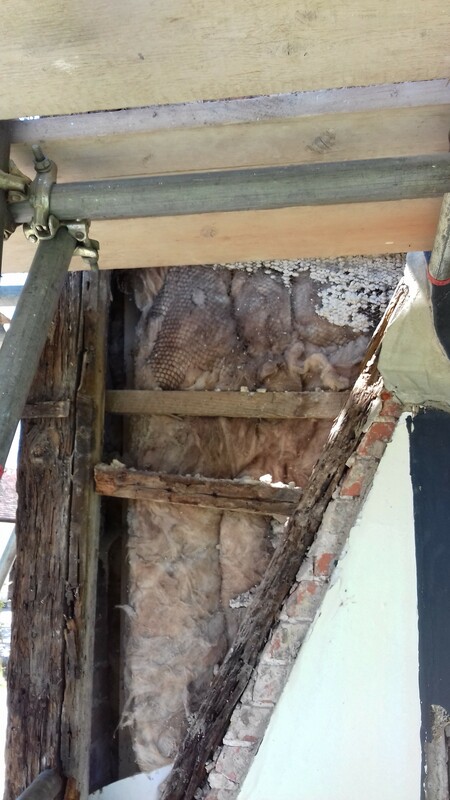 The frame of the right-hand 'return', with modern insulation partially installed. 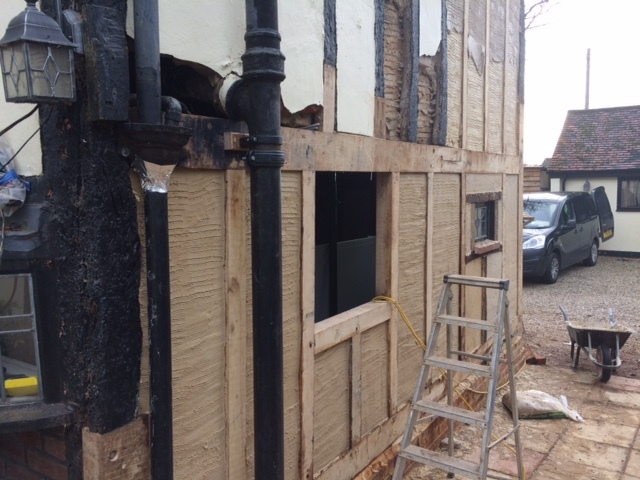 The rest of the side left alone (for now). 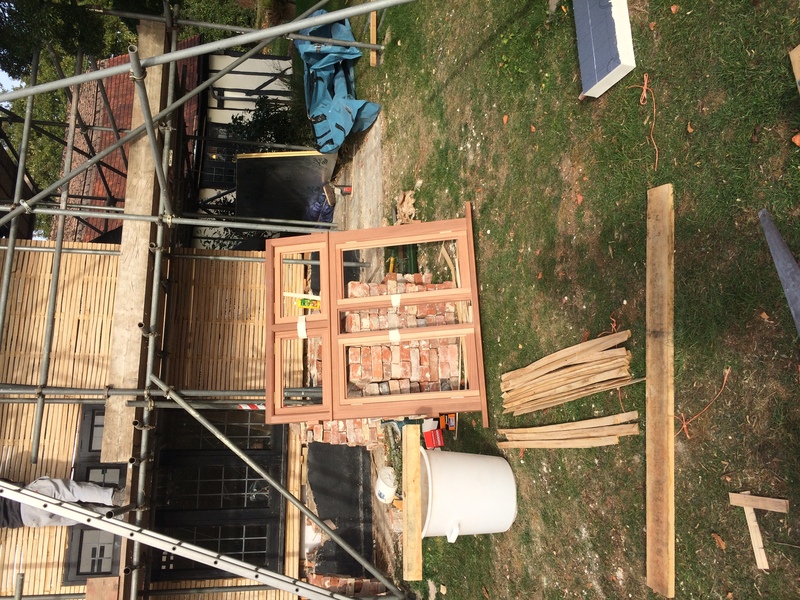 The new frame of the front wall. 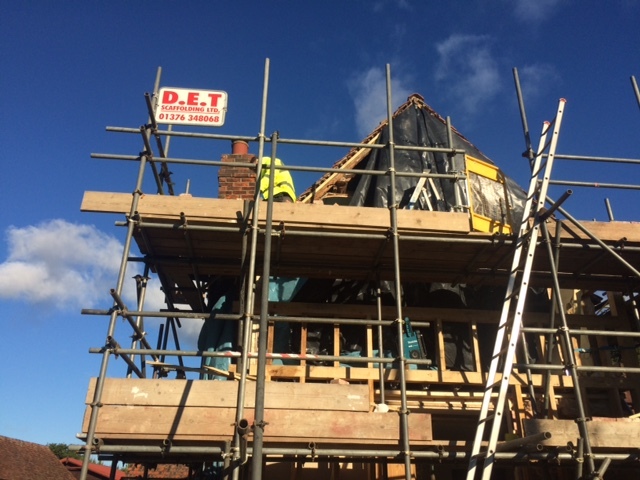 Blue sky reflecting off the insulation in the gable. 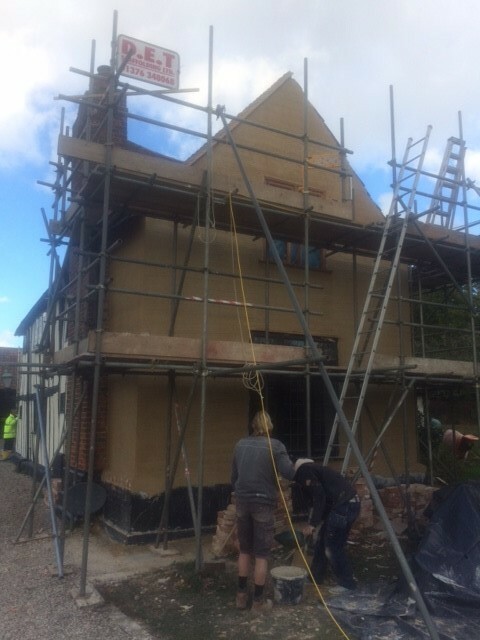 The right-hand 'return' half completed. 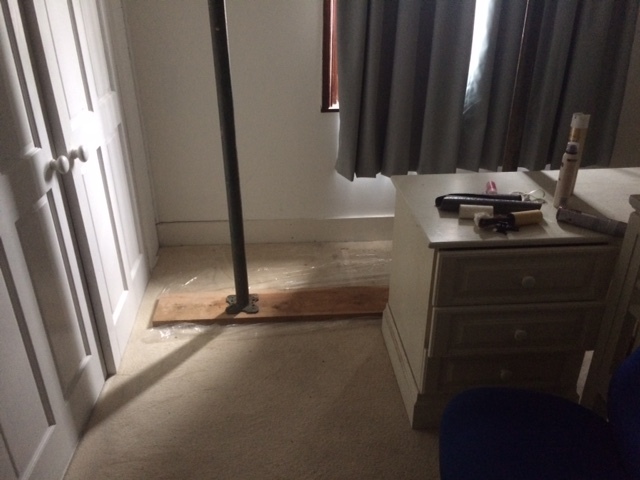 An old floor-joist and the bedroom-cupboard doors visible. Shows the preliminary investigative work at the rear of the property, with the initial bad tidings confirmed when restoration commenced in November. Eventually, the photos will be individually commented. 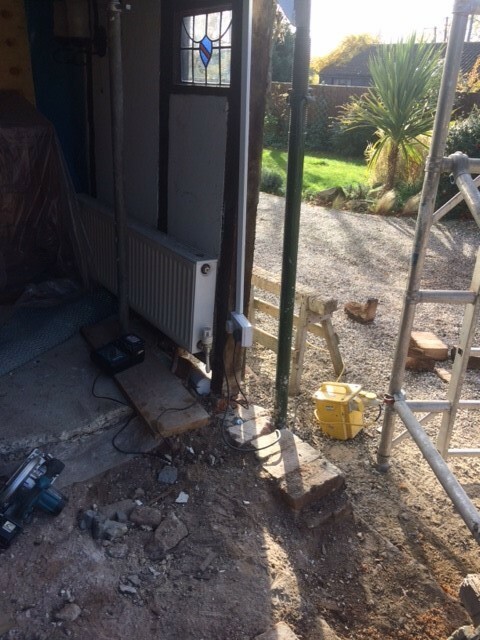 The right-hand corner-post at the back. Foot decayed and no sole plate: 'hardened' with cement. 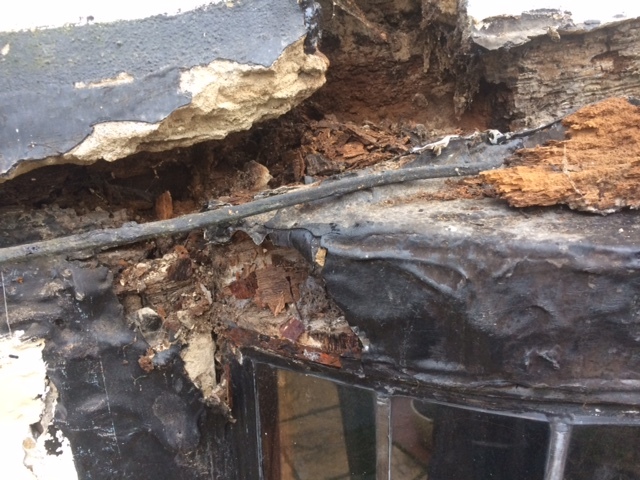 Excavations reveal rot around the little window, and a gap in the corner post ('hardened' with cement). 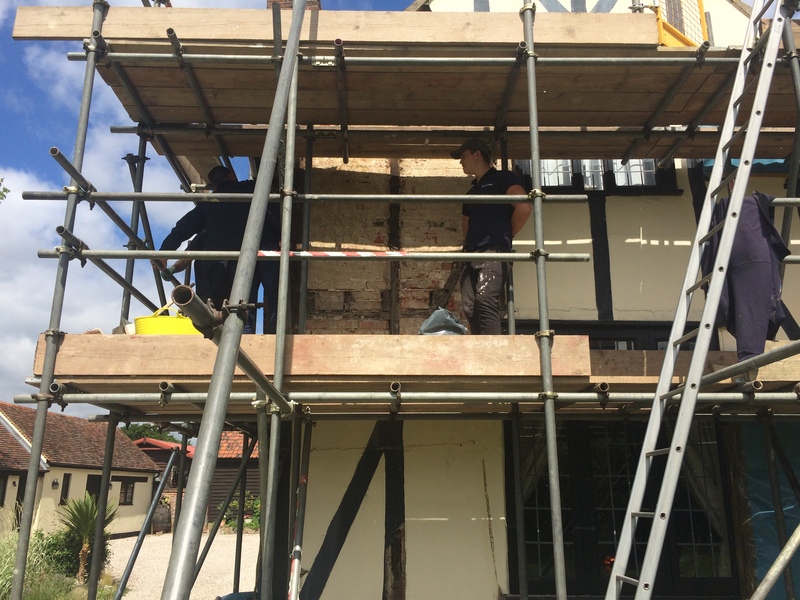 Modern studs and breeze-blocks above! 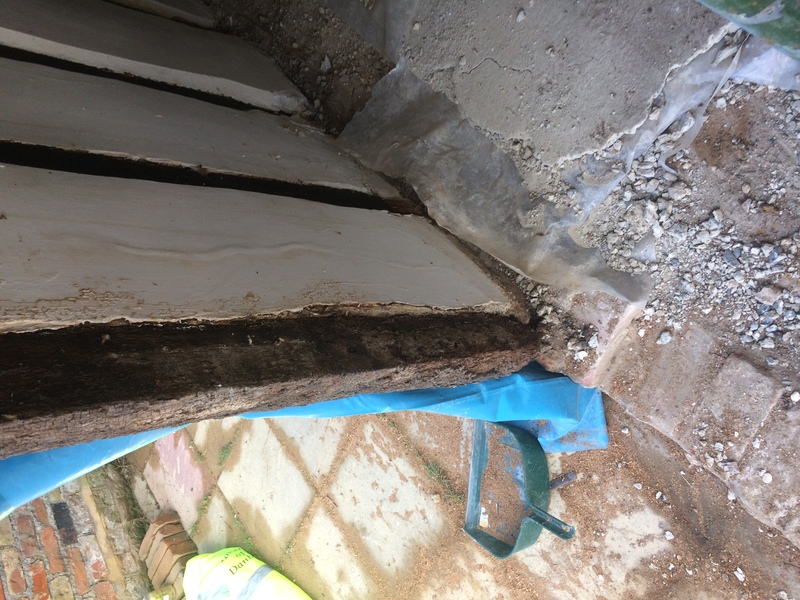 Studs rotten at the base. 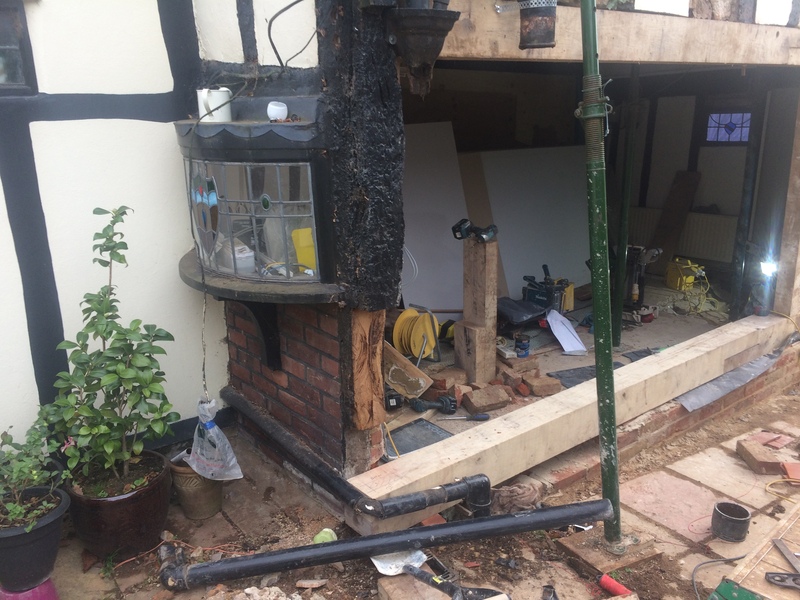 No sole plate - just a cement base. 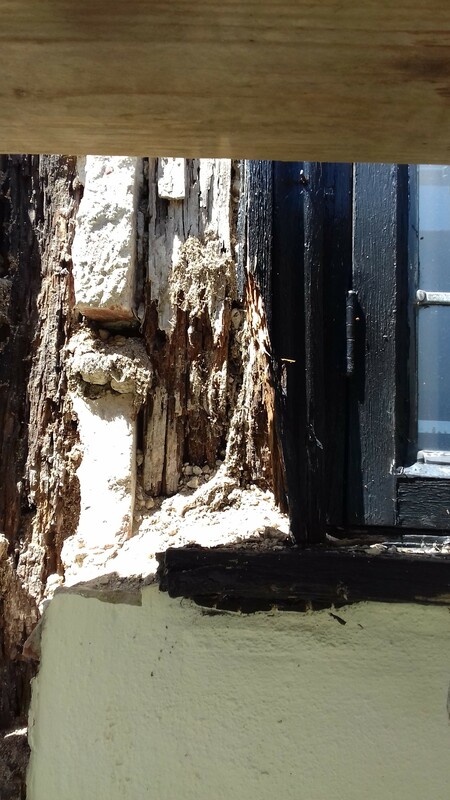 Studs under the oriel window - the same story: rot and no sole plate. 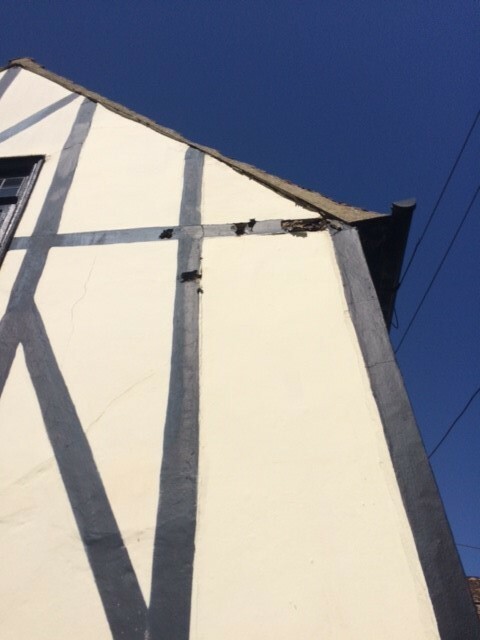 Above the oriel window. 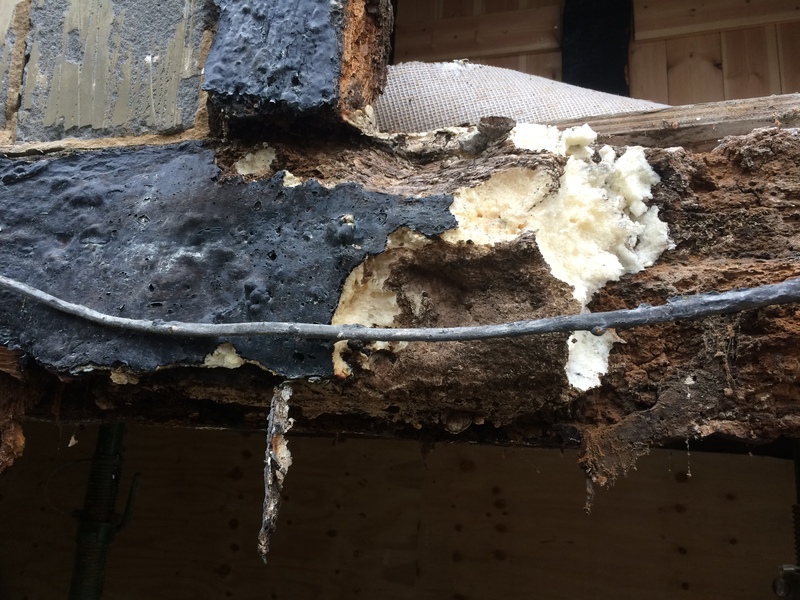 The first evidence of rot in the bressummer and 'repairs' with expanding foam. The left-hand-side of the back - the same story. 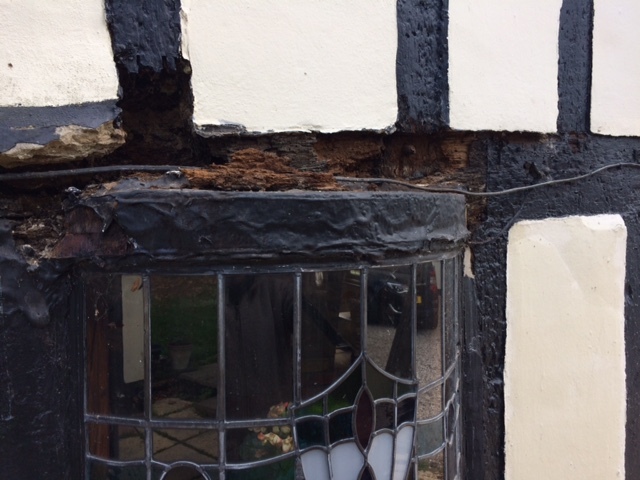 Also, the oriel window frame is rotten. 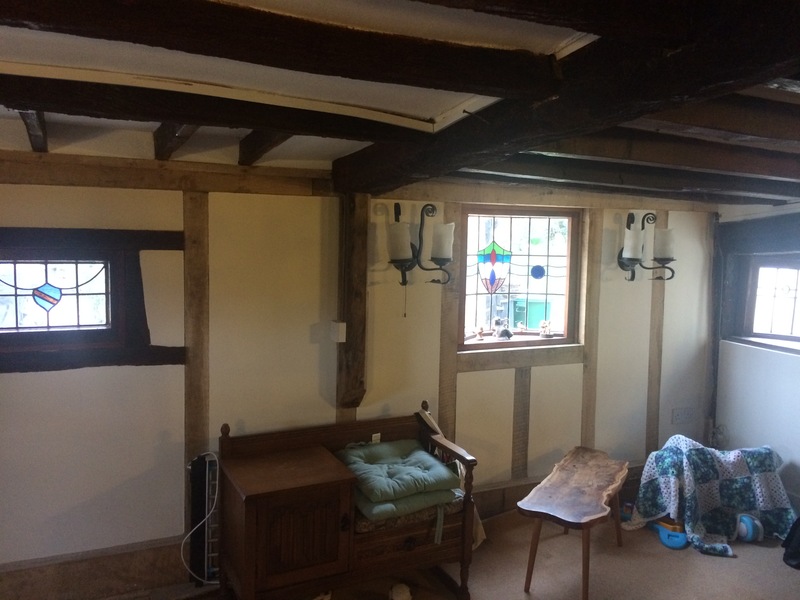 Another view of the inside of the oriel window, showing the surrounding timbers. The ceiling of the oriel window from the inside. 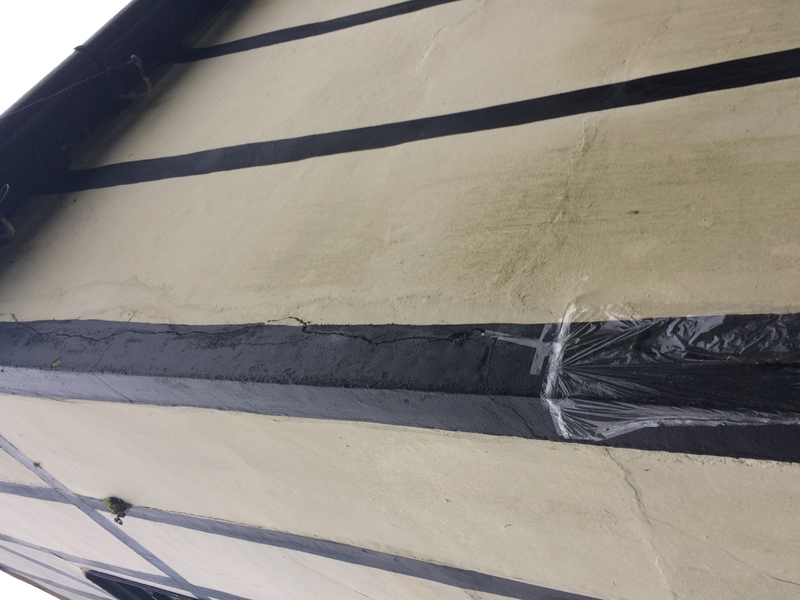 Of late it had leaked during the rain. 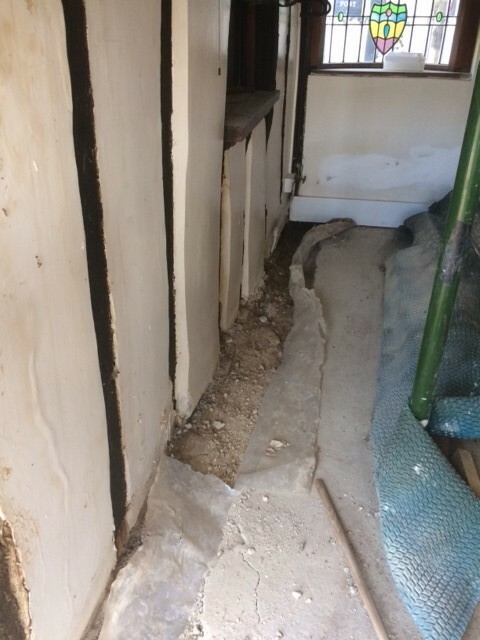 The inside of the right-hand corner (left-hand from the inside) by the then 'staircase to nowhere'. 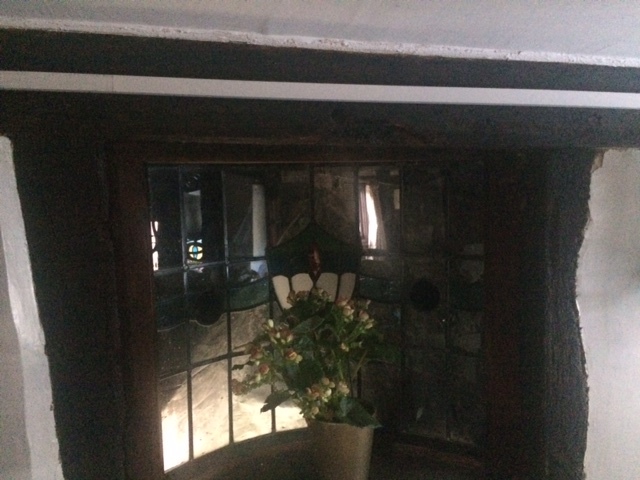 The small window - viewed through the 'staircase to nowhere'. 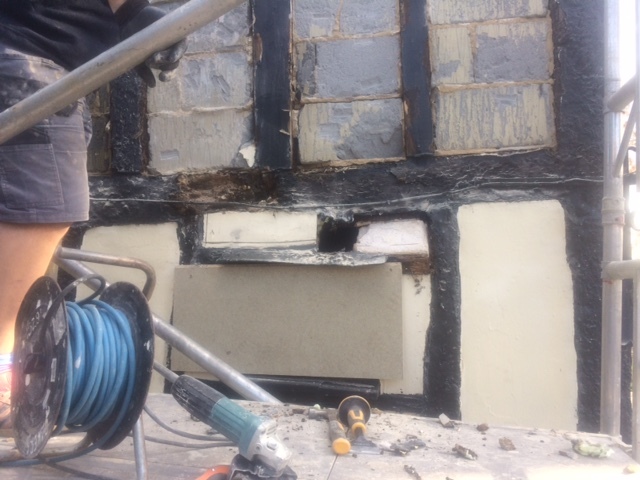 The small window, the surrounding panels showing ample evidence of water ingress, and a plugged hole where excavation had knocked out the beamlet. 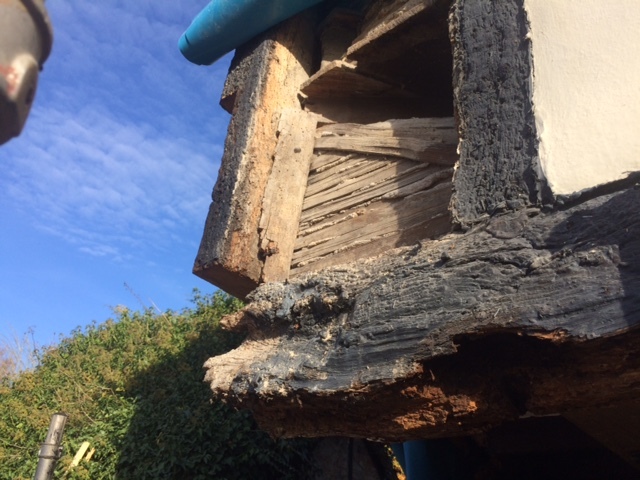 Another external view of the oriel window with a closer look at the rotten bressummer with its painted expanding foam. 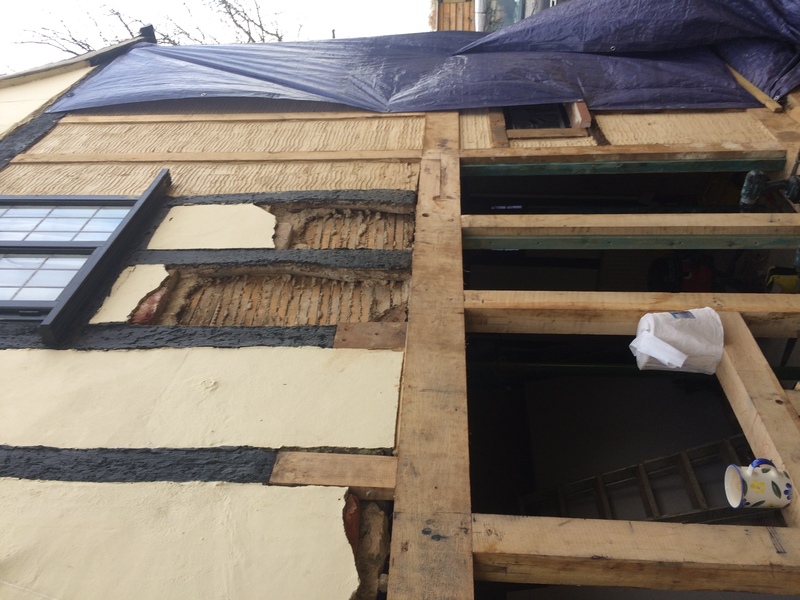 Another view of the little window (removed and boarded over) and the breeze-block infill revealed. 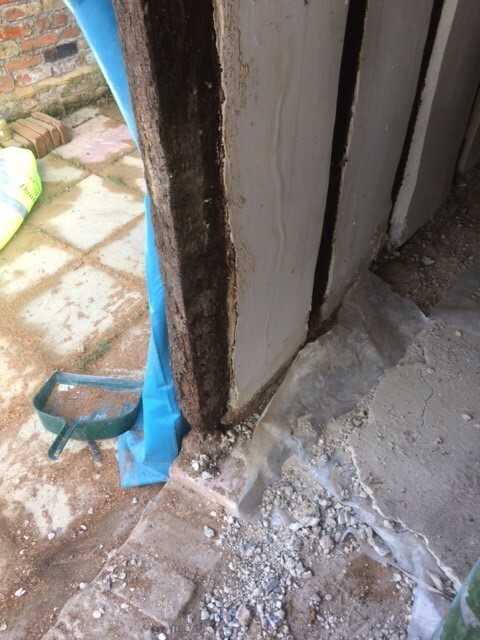 Wider view of the rear after the cement render had been removed to reveal earlier repairs with new studs and breeze-blocks. 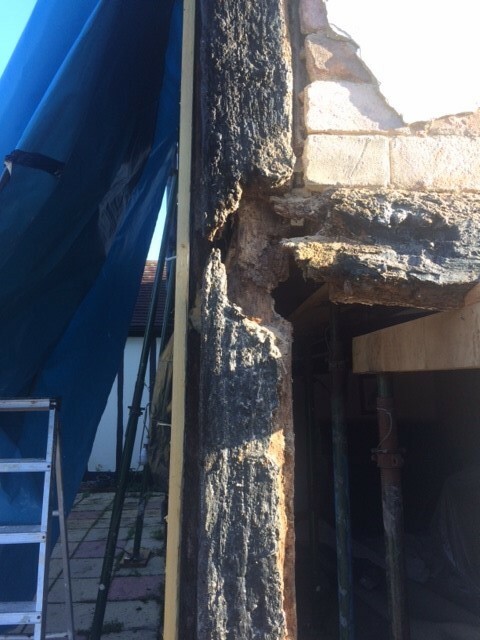 The rear of the house prior to investigation - showing the cracking that was the initial concern - though probably fairly benign. 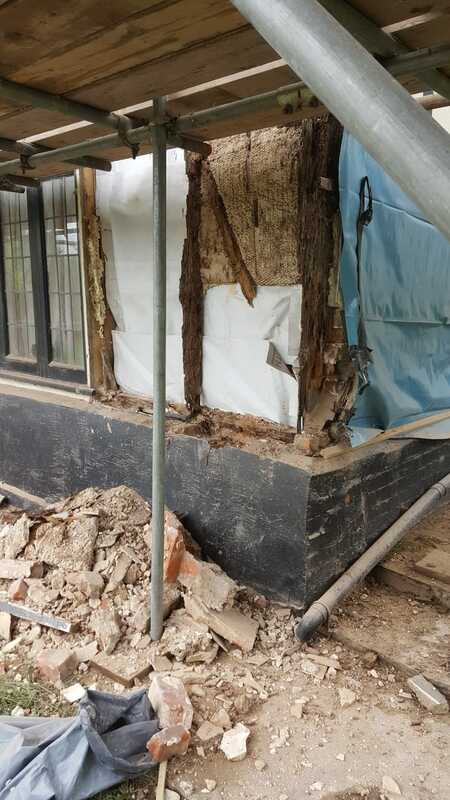 Photos taken by Bakers show the terrible state of the original frame at the front of the property. 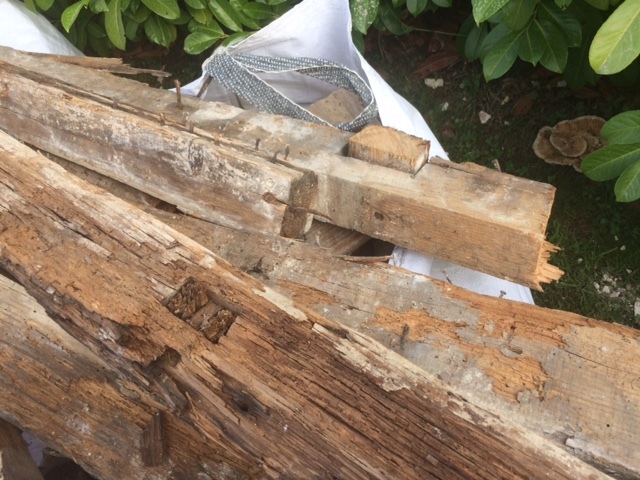 The timbers were - in general - in such a sorry state that they fell into pieces. 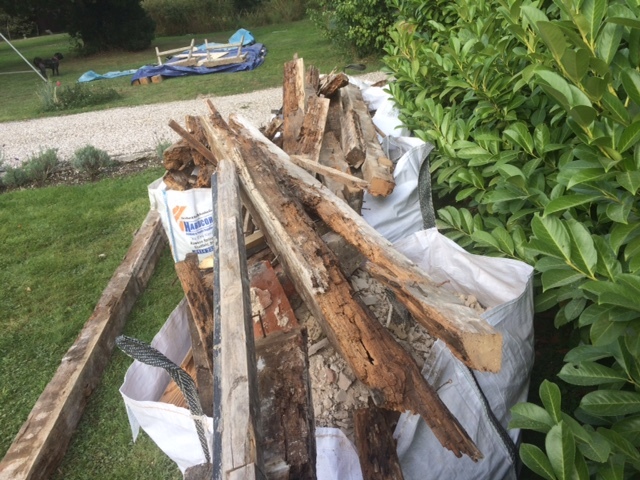 I took a number of photos of them all bagged up ready for removal. 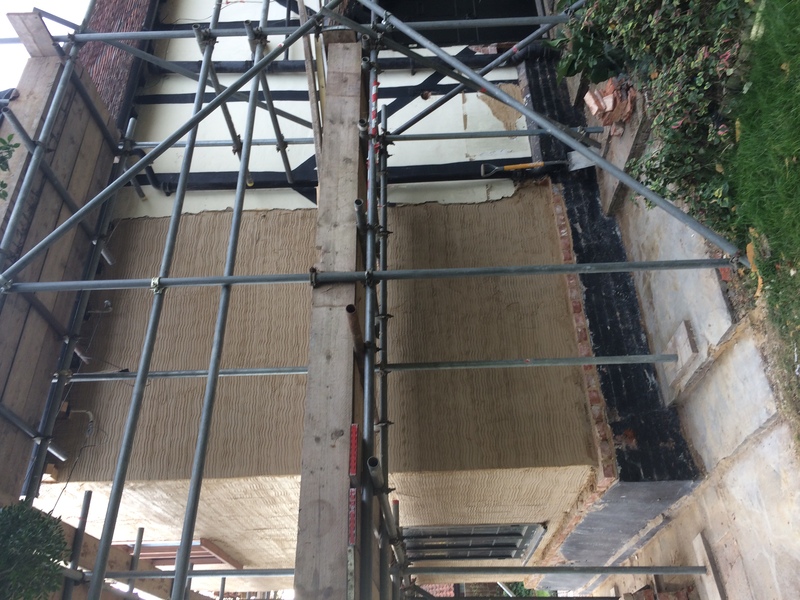 Also shows the brick infill. 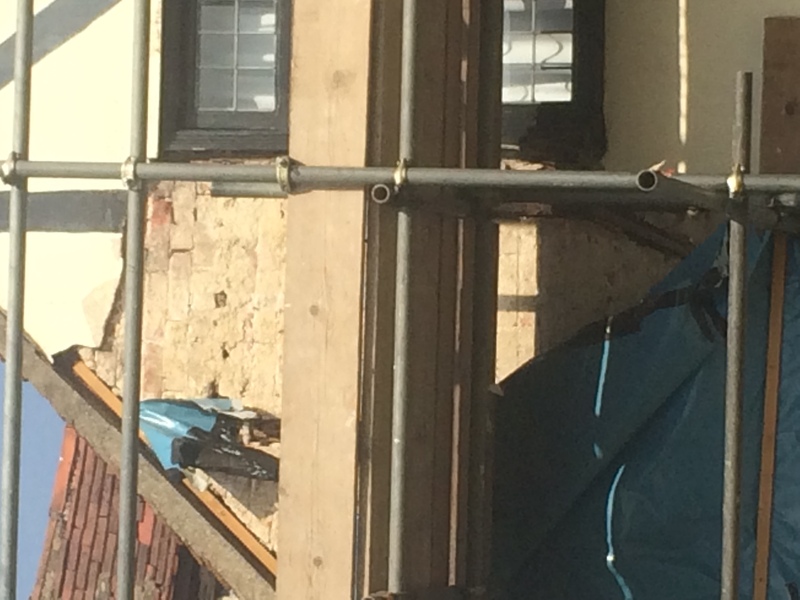 I'd hoped it could be saved in situ, but Bakers strongly advised against, on 'health and safety', and other grounds. 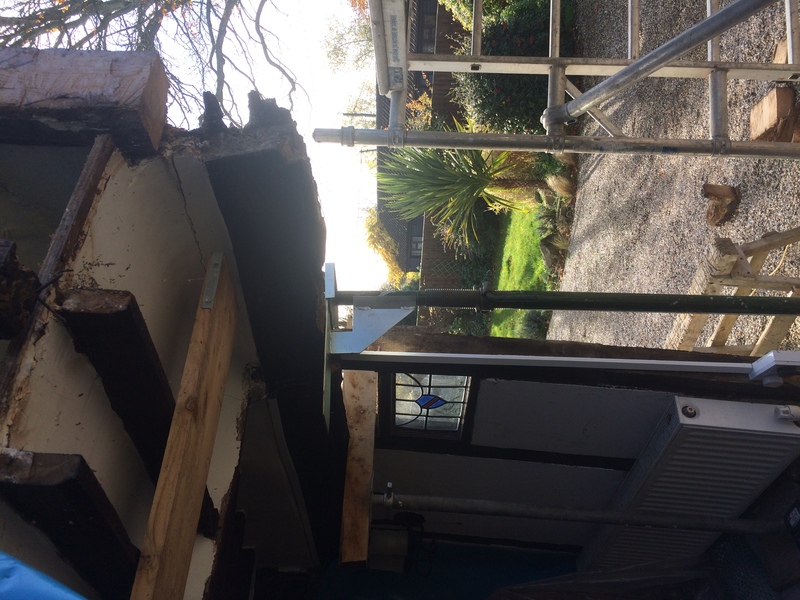 Acrow props were used to support the front lounge and bedroom ceilings. 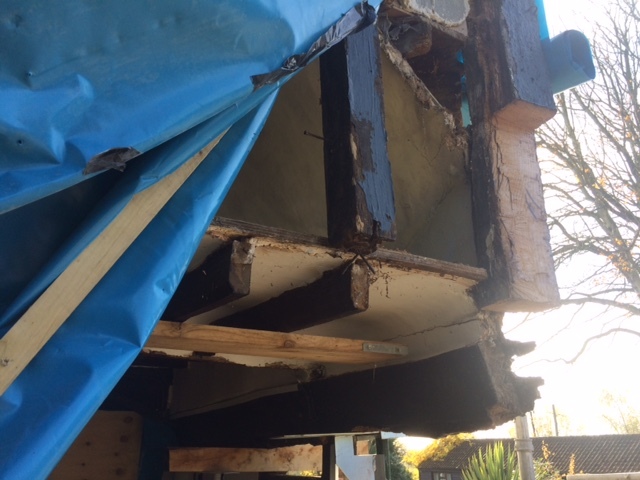 The rebuilt frame of the front. 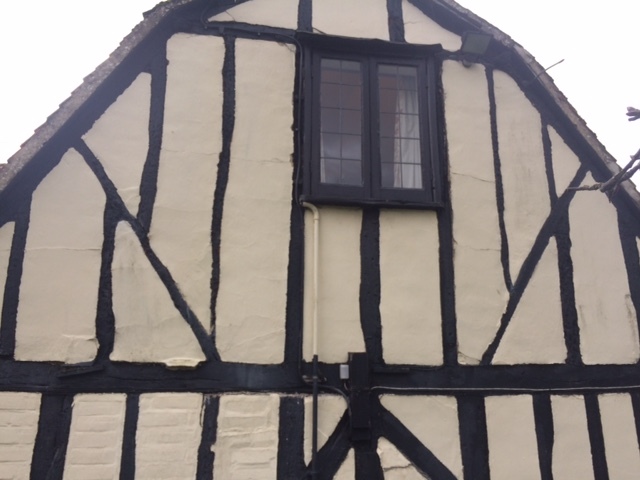 Windows missing! 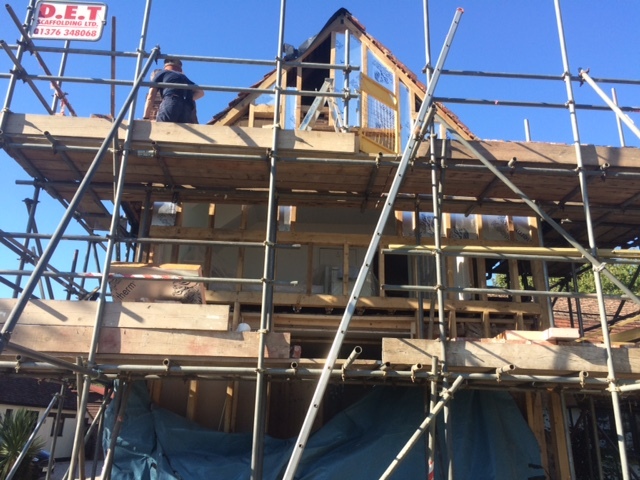 The frame in the process of construction - the gable is in progress. 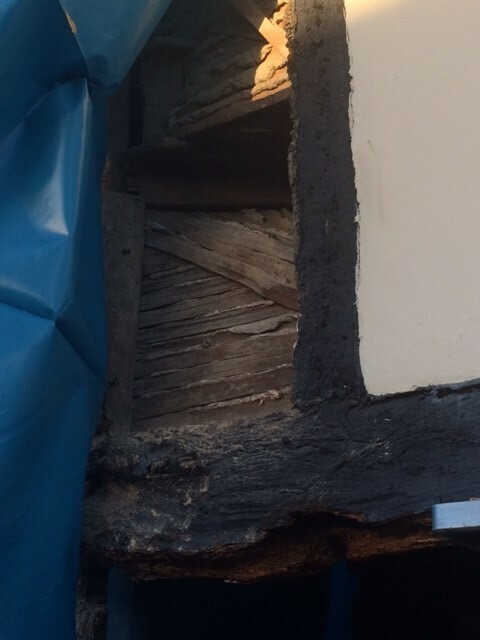 Close-up of the rebuilt frame below the gable. 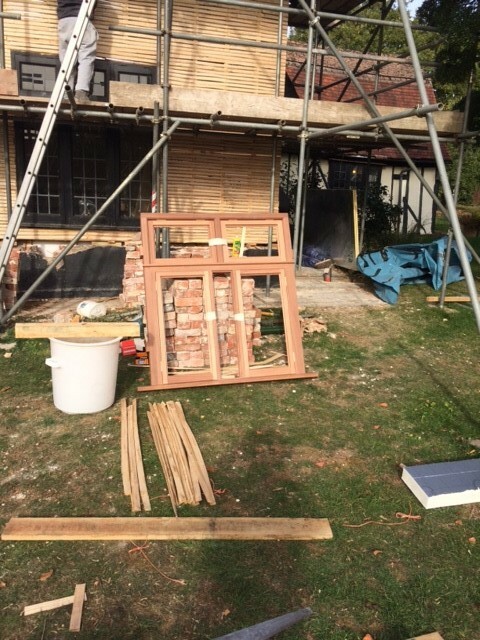 The ground-floor window, which was sound and was re-inserted in due course, after a couple of months lying on the lawn. 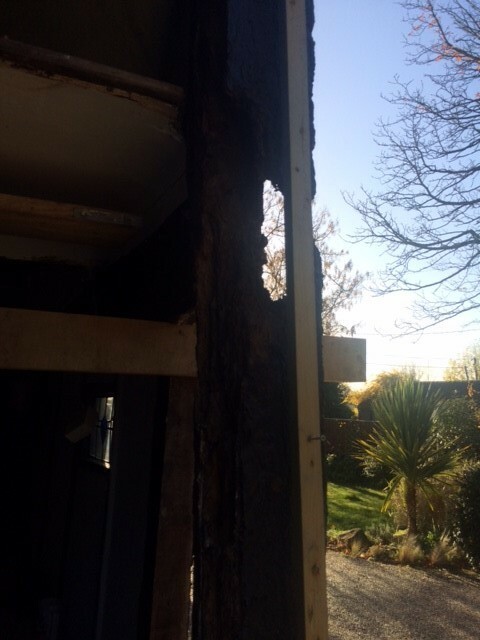 Photos taken by Bakers, showing the terrible state of the frame at the front of the property. 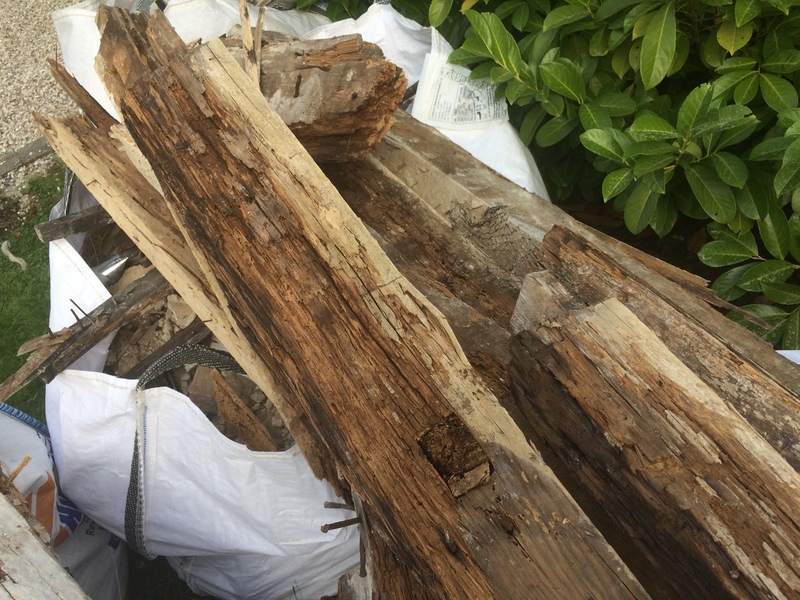 The timbers were - in general - in such a sorry state that they fell into pieces. 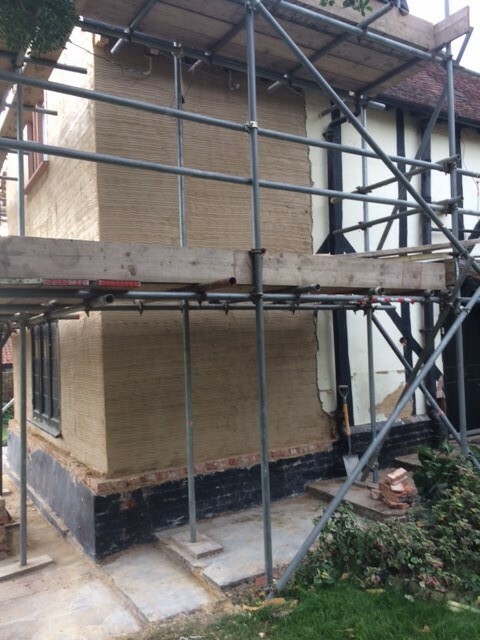 Also shows the brick infill. 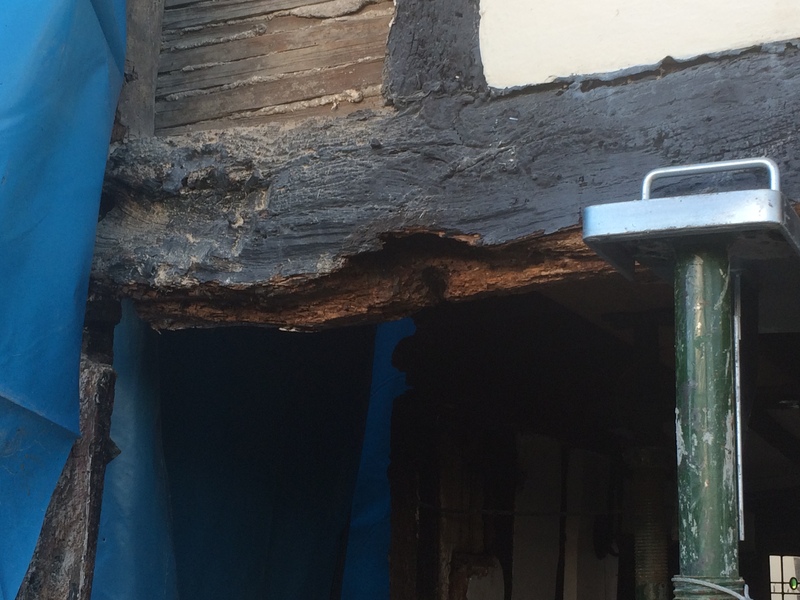 I'd hoped it could be saved in situ, by replacing the timbers, but Bakers strongly advised against. 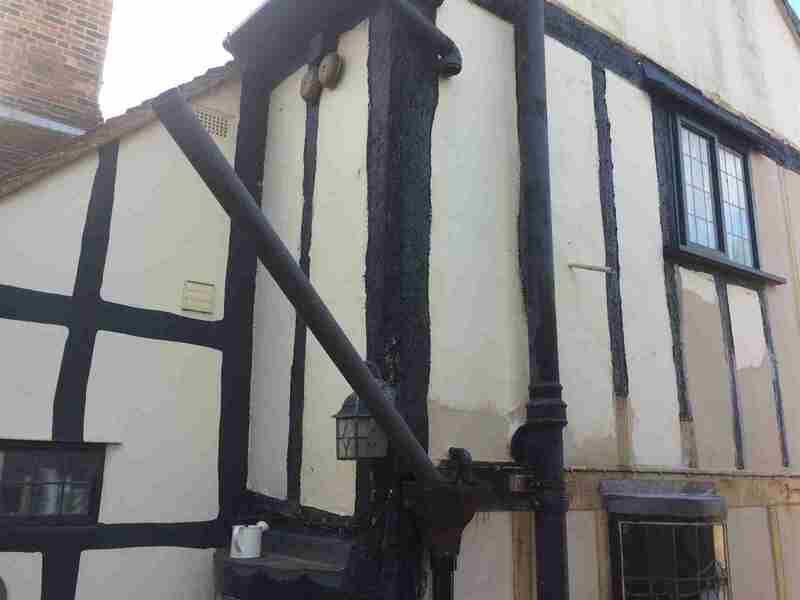 I'm not competent to comment on the architecture of this part of the building, but I'll have a go anyway. It looks like the frame is supposed to be 'containing' rather than load-bearing, other than - maybe - the corner-posts. 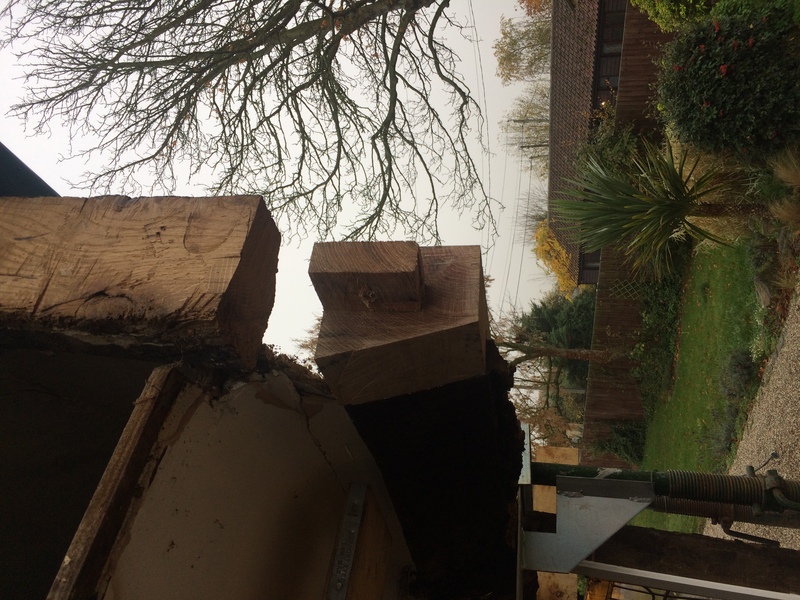 The studs and transverse beams are very thin, especially compared with the older rear of the property. 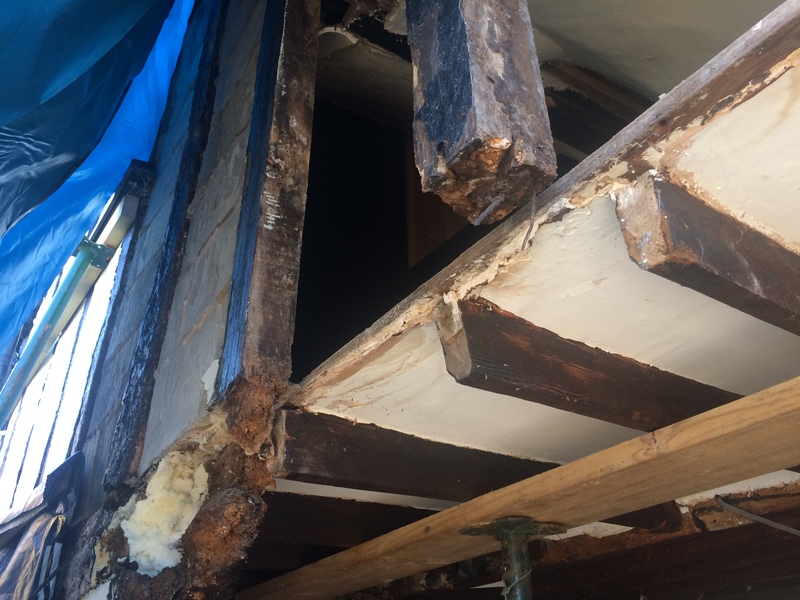 So, the load looks like it's taken by the brick infill - basically load-bearing walls, but compromised by the rotten timbers - the horizontal and transverse ones suffering from compression as the frame decayed. 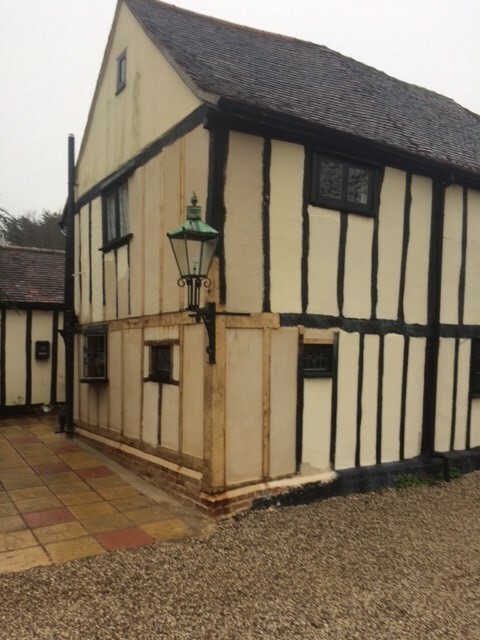 The front of the property was supposed to be 17th century according to the listing. 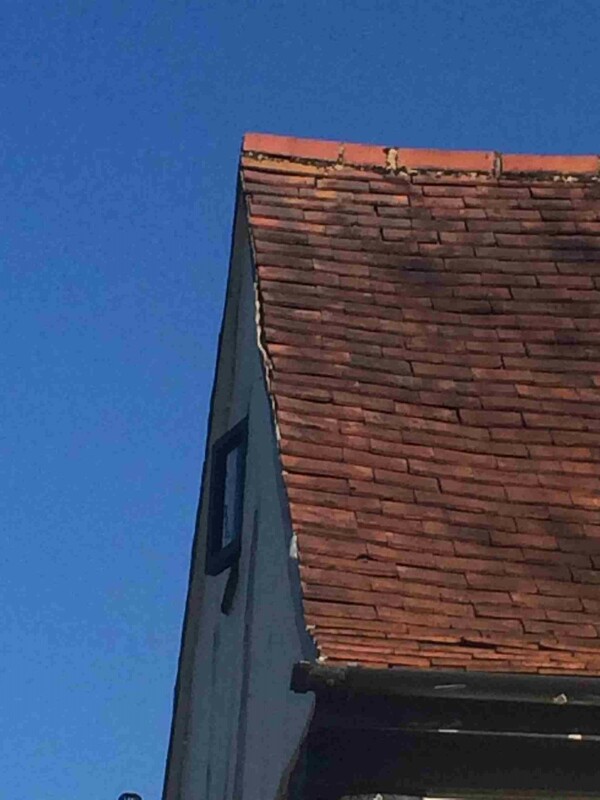 How does anyone know? 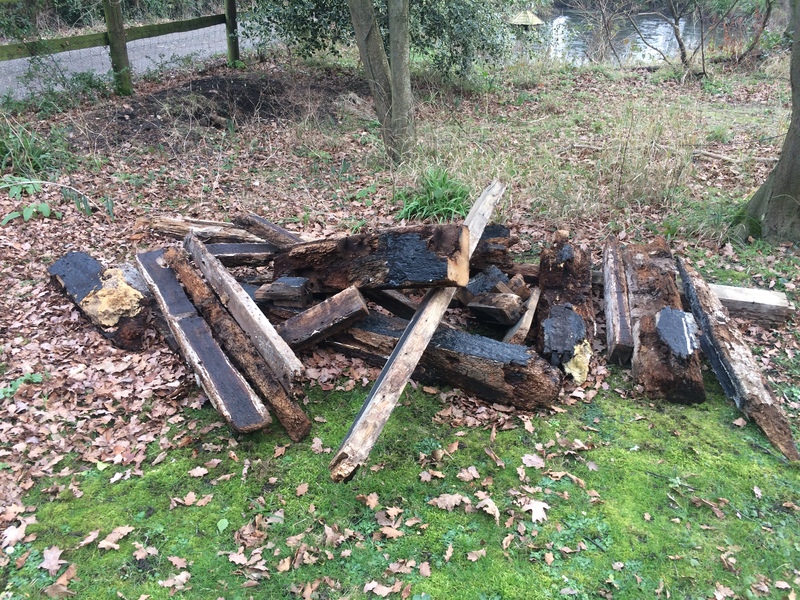 If so, it's a shame for it to have had to go. The frame after removal of the render and the upper infill. 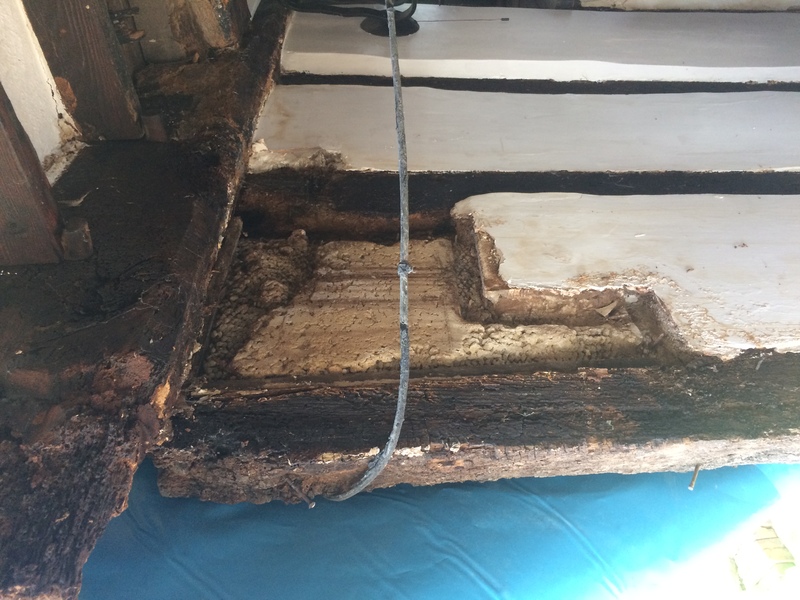 The bedroom floor-joists were conveniently OK and facing in the right direction. 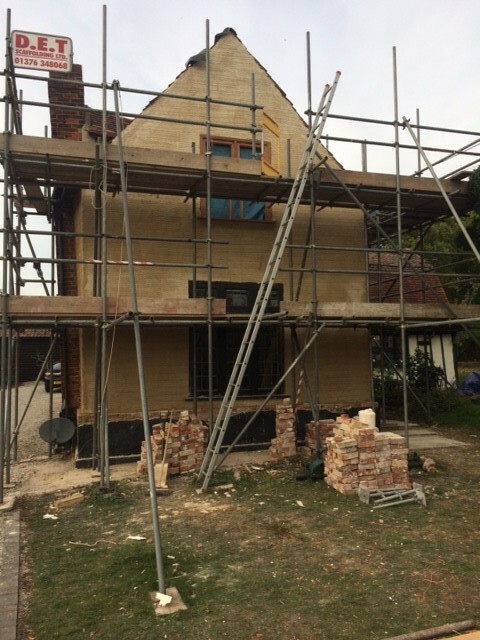 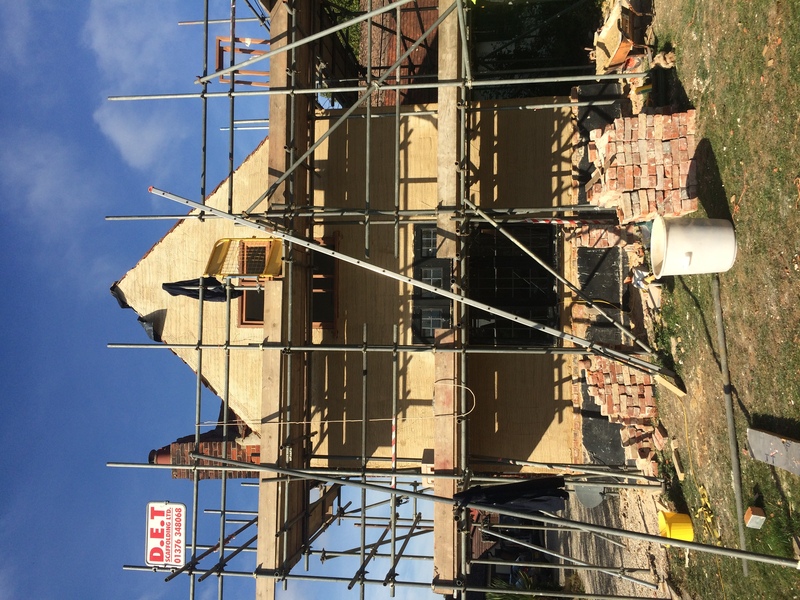 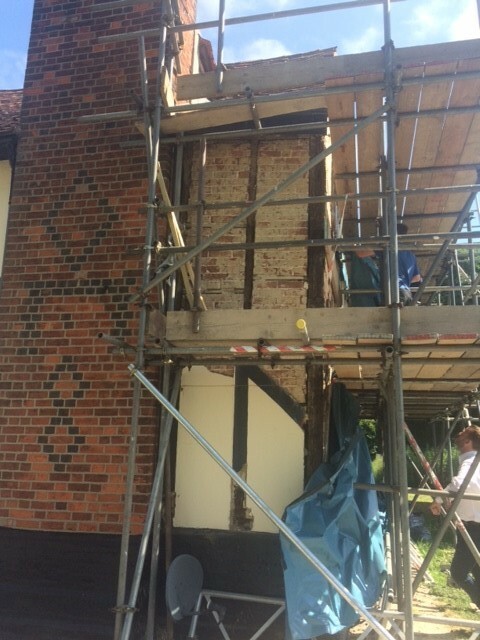 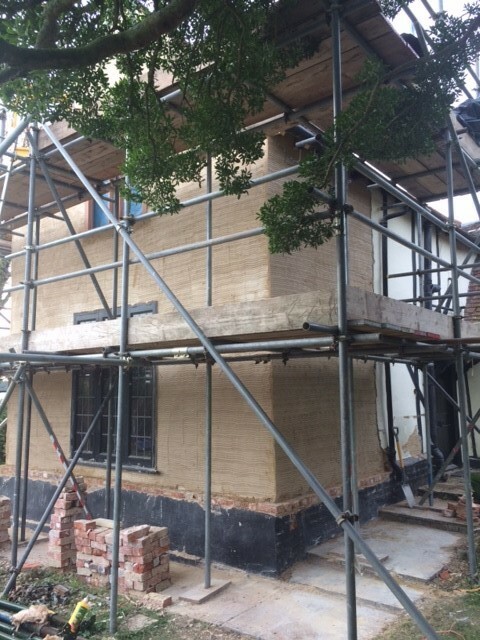 The left of the gable-frame after removal of the render and brick infill. 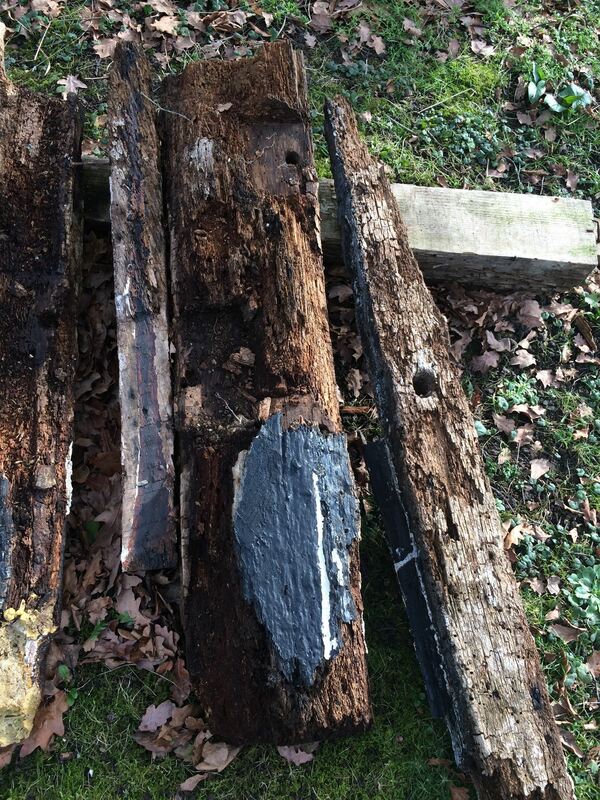 This was the best preserved part, but no use if the lower reaches are decayed and unstable. 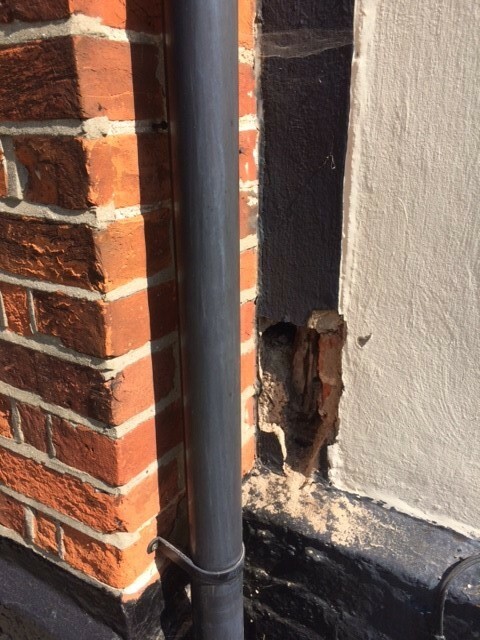 The failed right-hand corner post, after removal of the render and brick infill - with evidence of earlier repairs and plasterboarding on the inside. 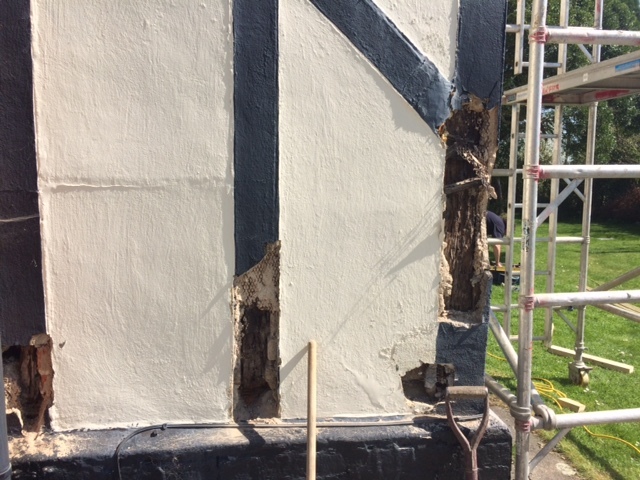 The left-hand corner post, and rather stick-like struts after removal of render and infill. 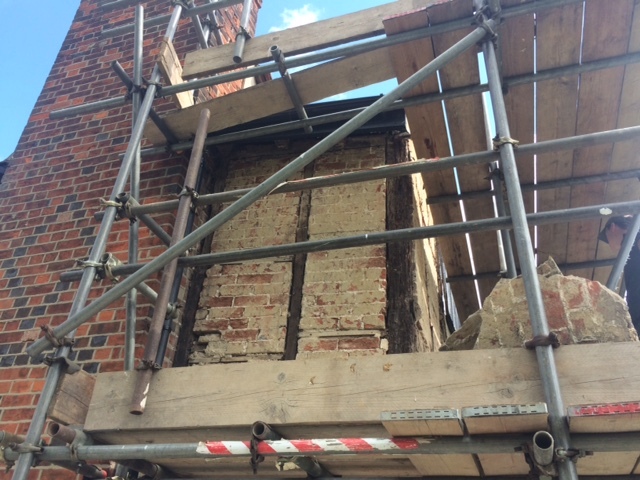 The left-hand lower corner of the upper window after removal of the surrounding render. 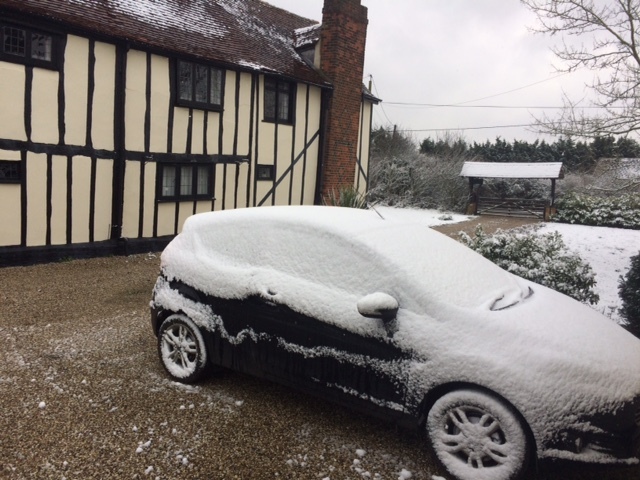 Doesn't look good! 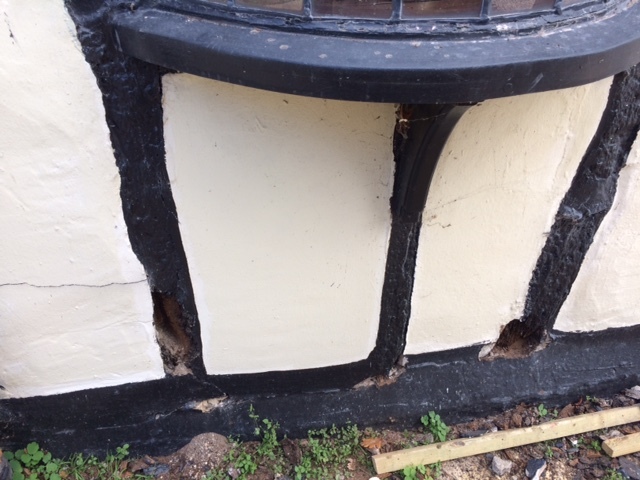 The window-frame had to be replaced as well. Loft-level, above the RHS of the bedroom window. 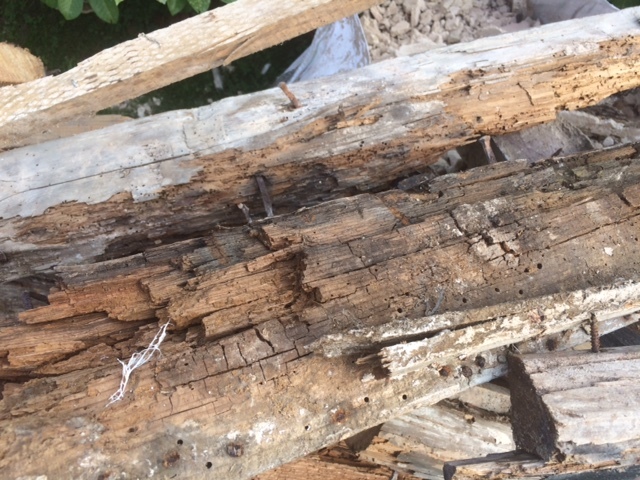 The base of the right-hand corner post - completely rotten. 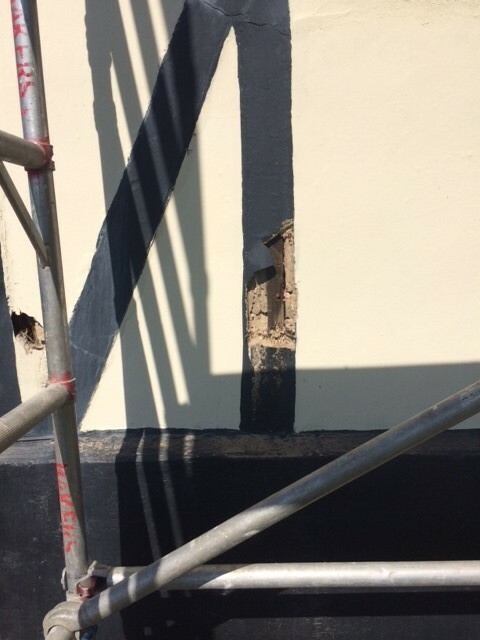 Higher up the right-hand corner post, showing the thickness of the render on the 'return' (side wall). 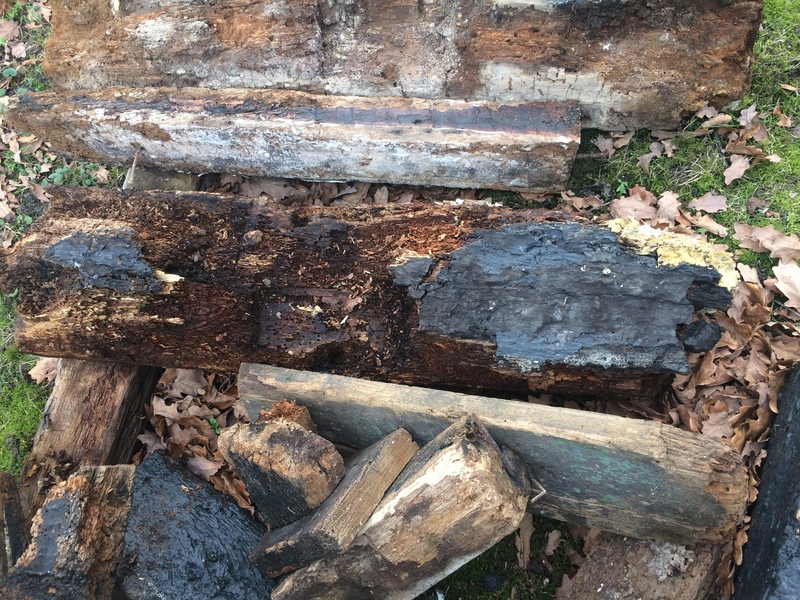 More rot. 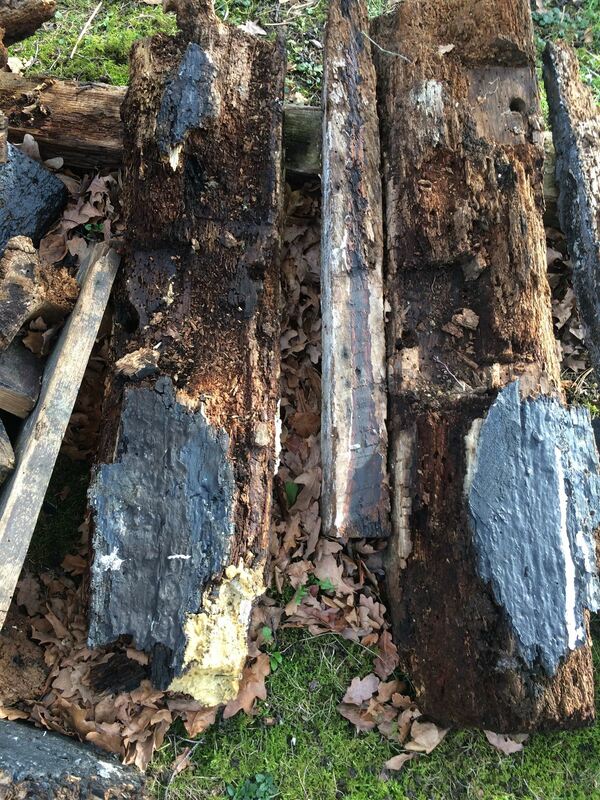 Shows the terrible state of the timbers which were - in general - so rotten that they fell into pieces. 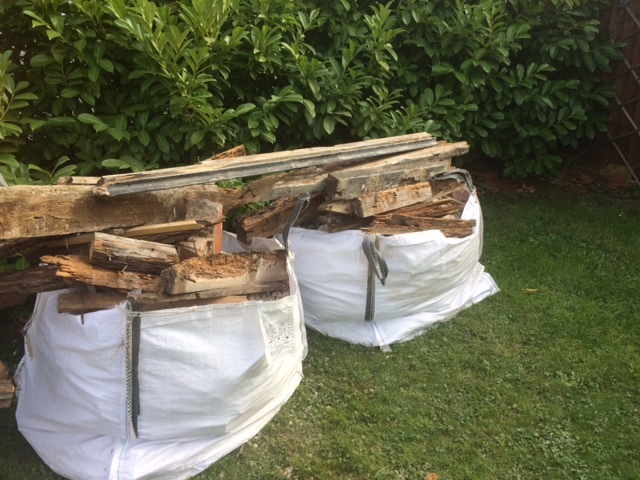 I took a number of photos of them all bagged up ready for removal. 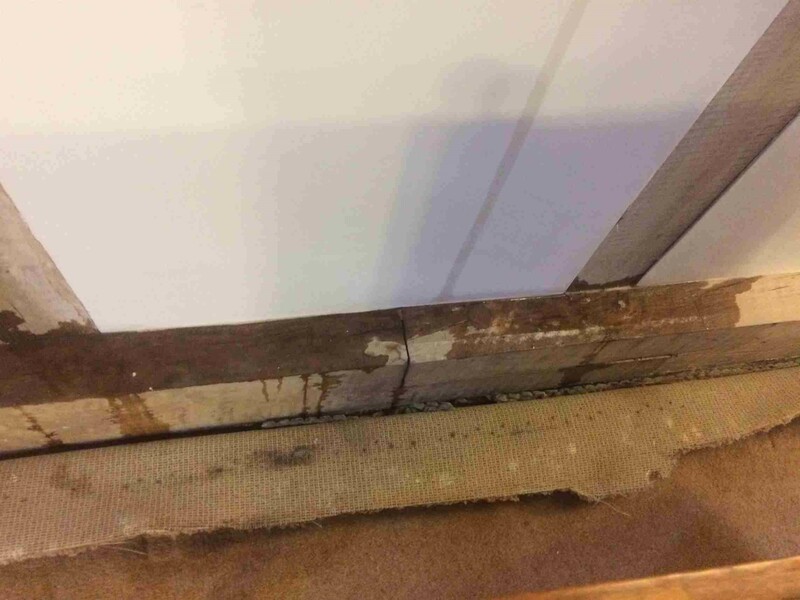 There's no point commmenting on them individually. 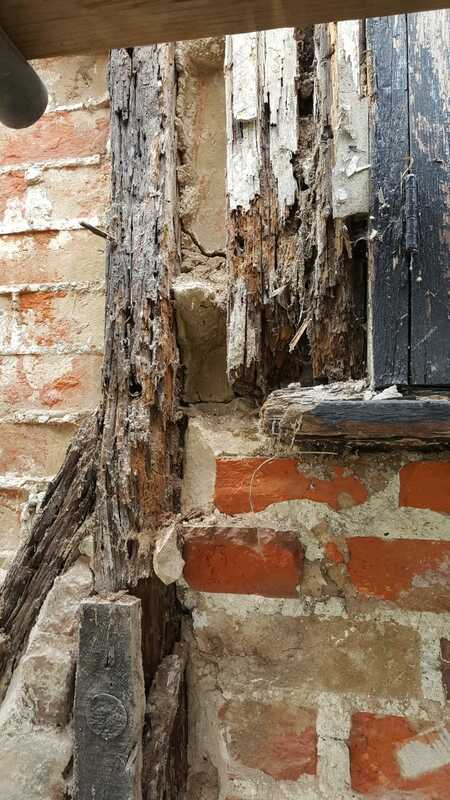 Shows the discarded brick infill. 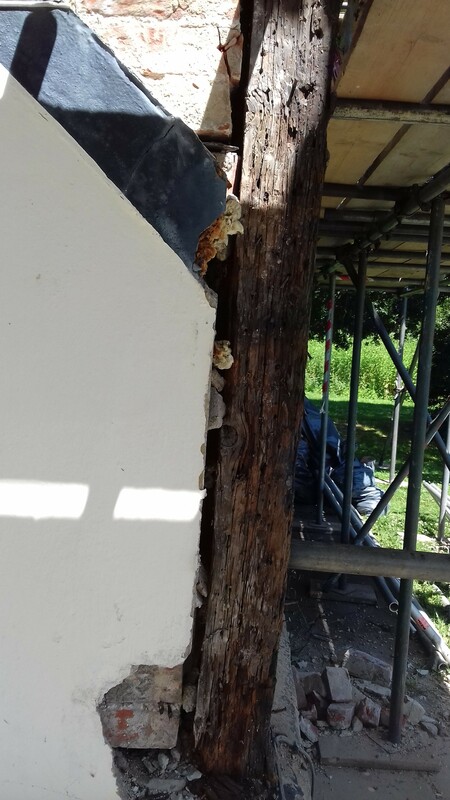 I'd hoped it could be saved in situ, but Bakers strongly advised against it. 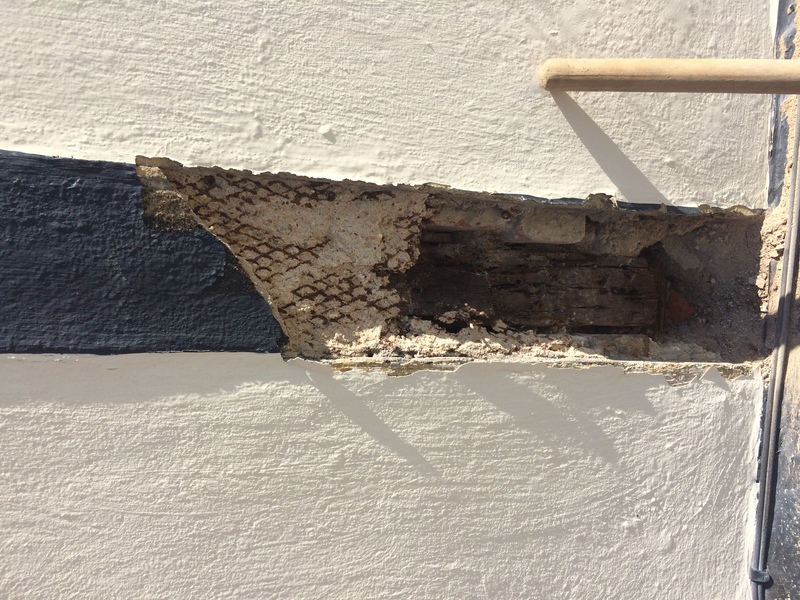 Also shows the cement render on an iron matrix. 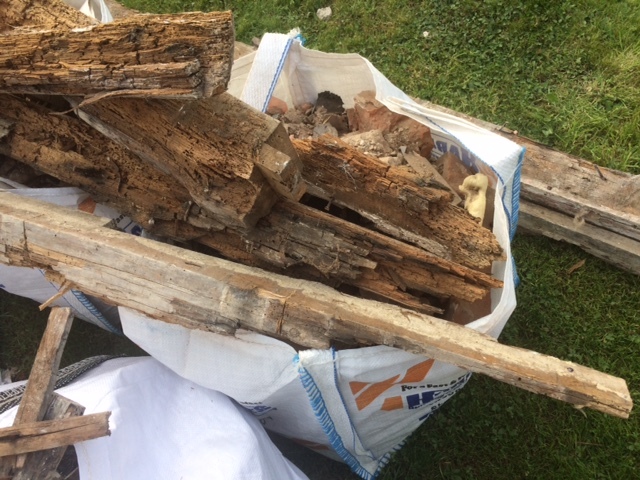 Shows a sample of the render, and the iron martrix used for some of it. 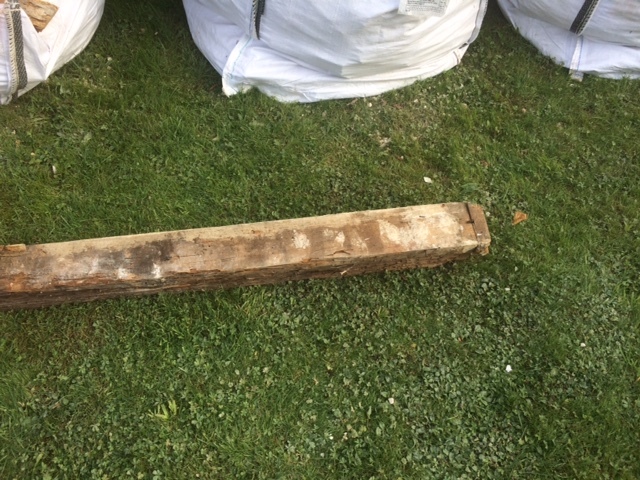 A sample of the brick infill - or bricks from the supporting wall, if that's what it was. 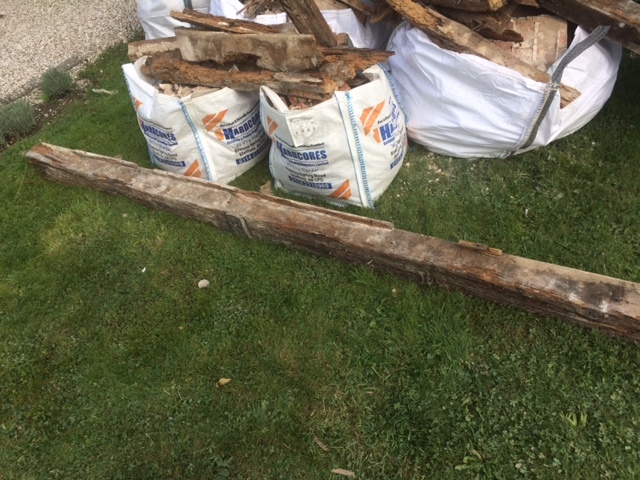 Can their age be determined? Shows the acrow props used to support the front lounge and bedroom ceilings. Acrow prop in the front bedroom. 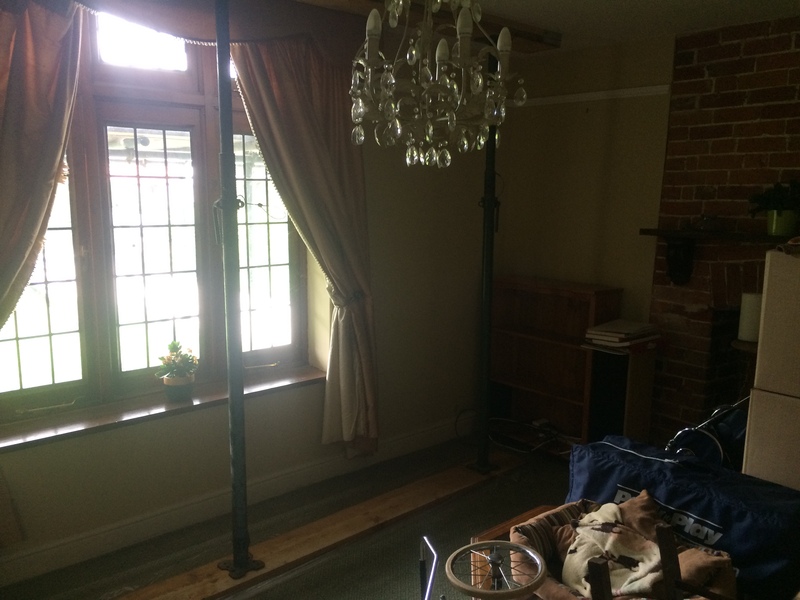 Acrow props in the front lounge. 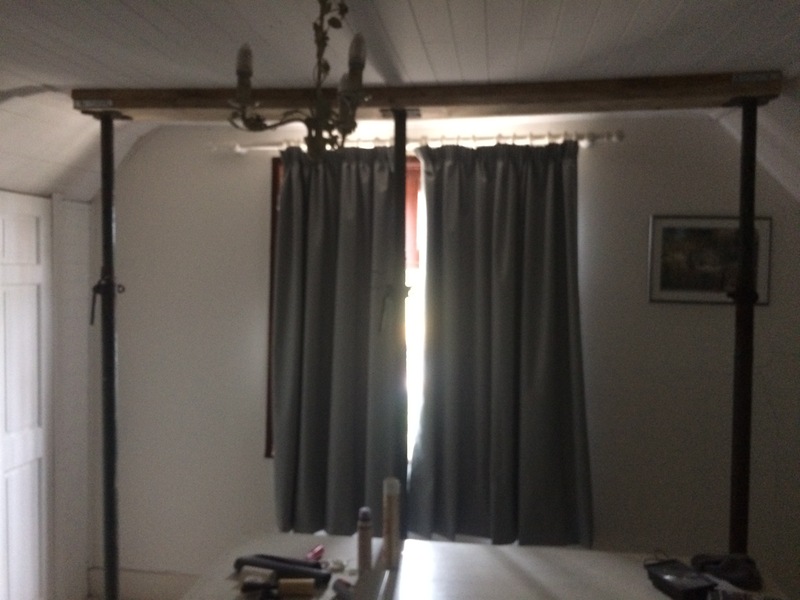 Acrow props in the front bedroom. 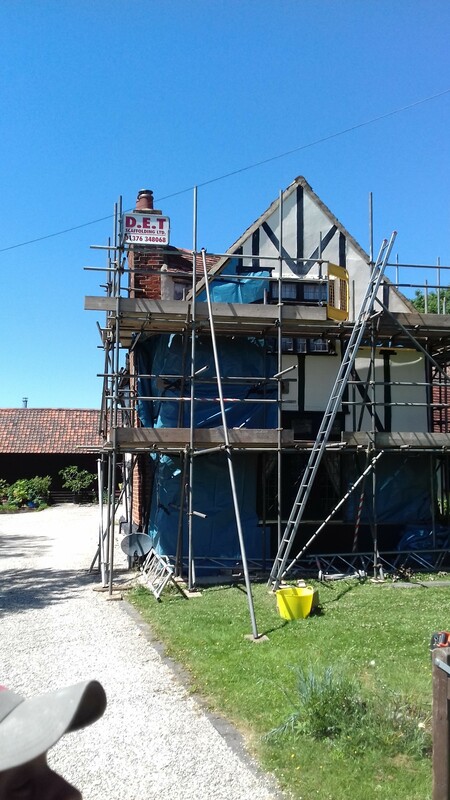 Nothing much happened in July and August - a shame given the wonderful weather - as we were awaiting the expiry of the consultation period required for Listed Building Consent. 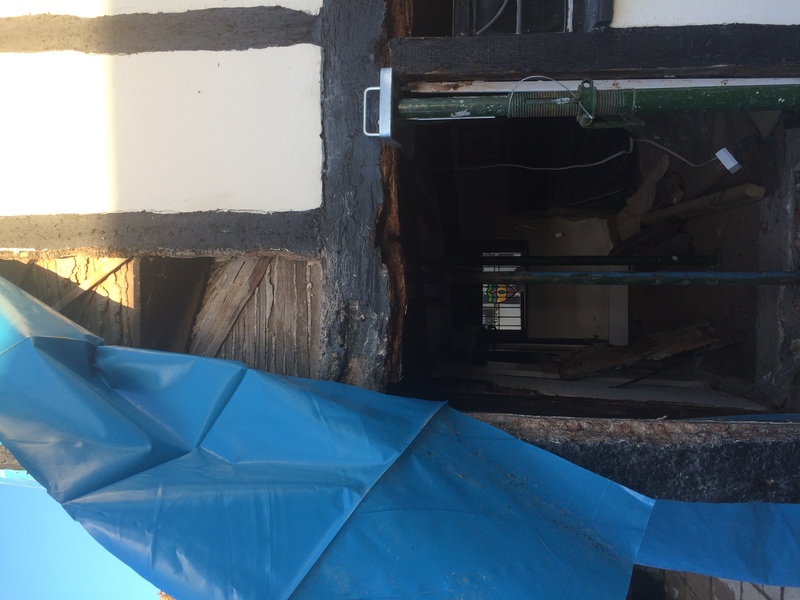 Just a couple of photos of the investigations, taken early in the month. 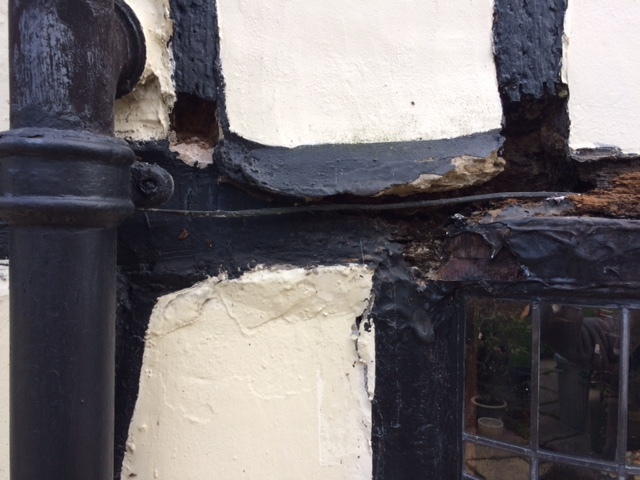 The left-hand front corner-post exposed. Not as bad at the right-hand post, but rotten at the base. Also shows the iron matrix of the render, and a rotten stud. 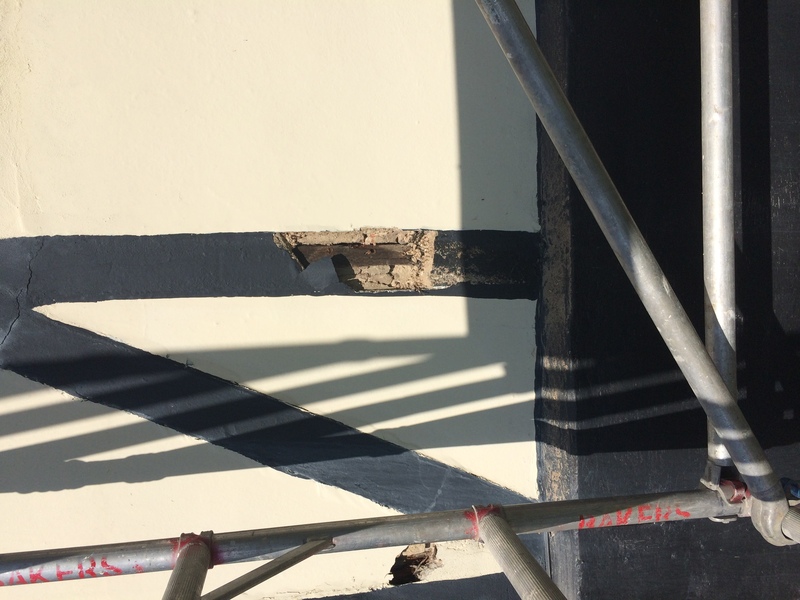 Shows the infill / wall after removal of the render. 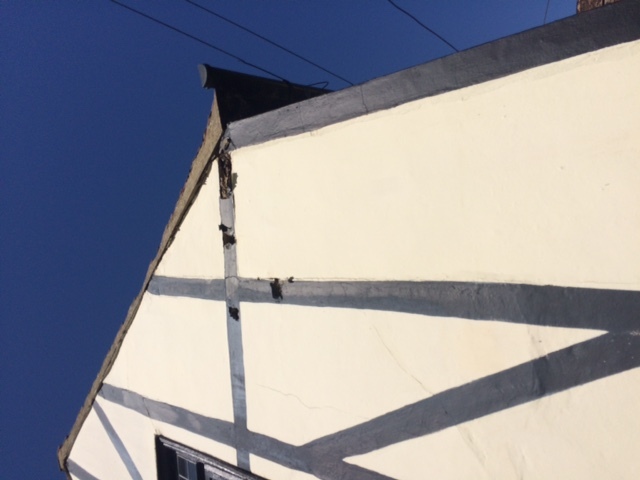 Shows that the faux beams painted on do not follow the frame in the gable (unlike elsewhere). 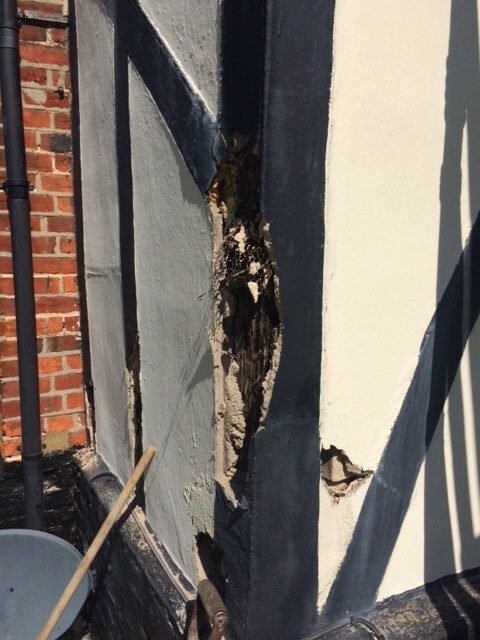 Shows the results of the further investigative work undertaken to reveal the extent of the damage at the front of the property. 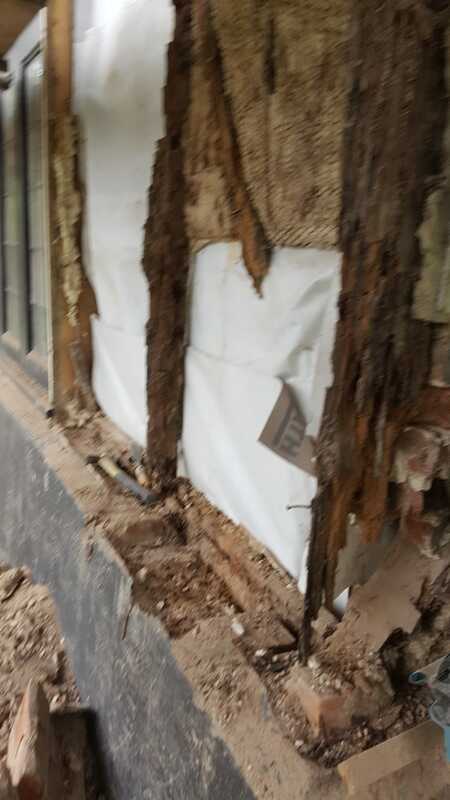 This was shown to the Conservation Officer and to the Structural Engineer to develop a plan for remediation. See the photos taken by Bakers. 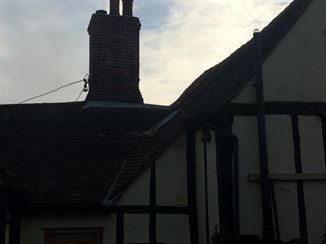 Some initial consideration was given given to the rear of the property. 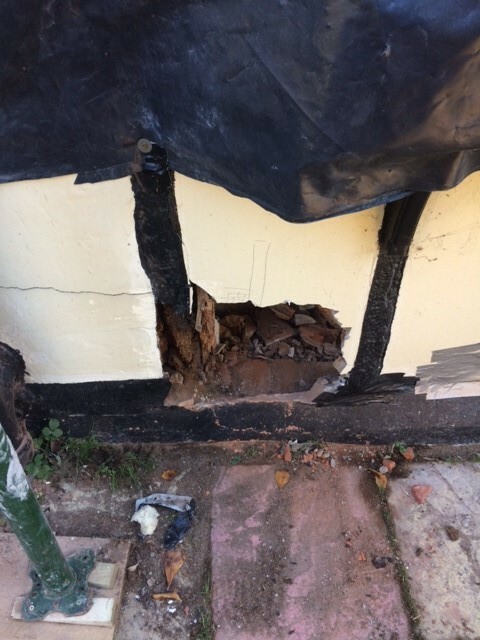 Shows the infill / wall after removal of the render at the front. 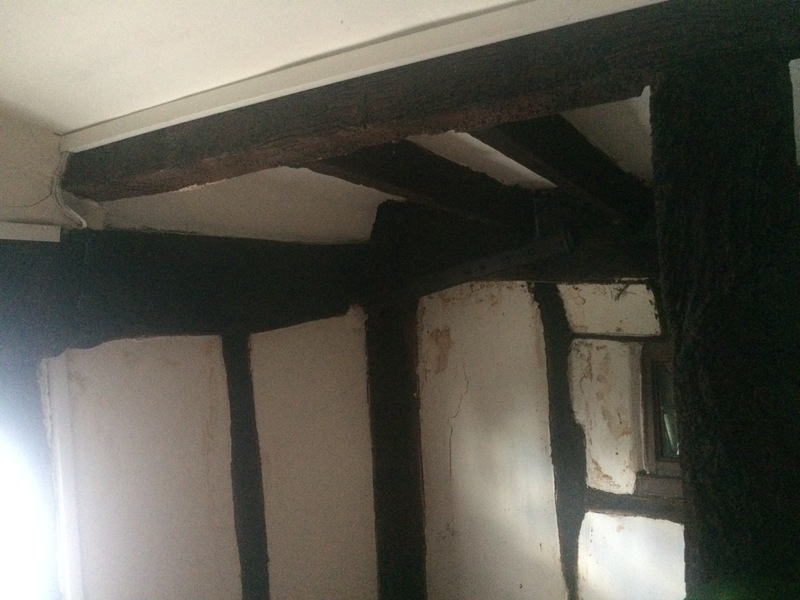 Shows that the faux beams painted on at the front do follow the frame below gable level. 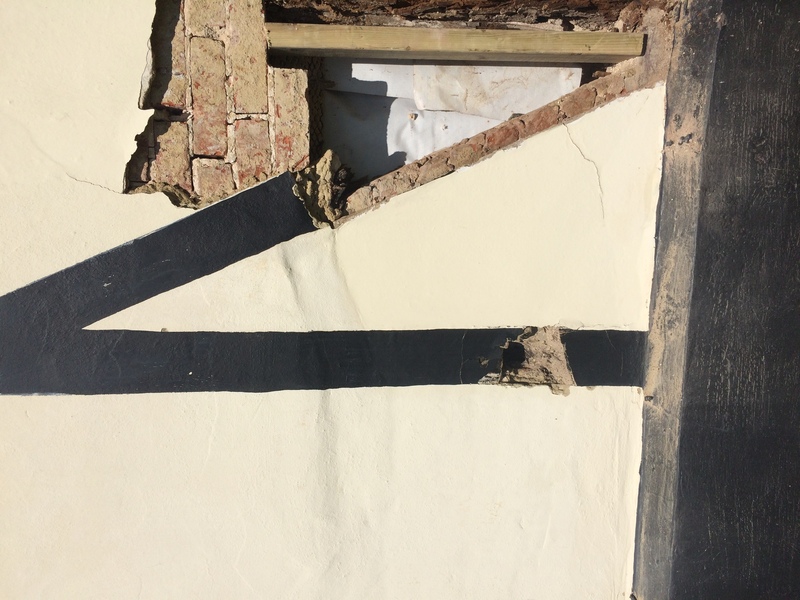 Shows the infill / wall after removal of the render at the side 'return'. 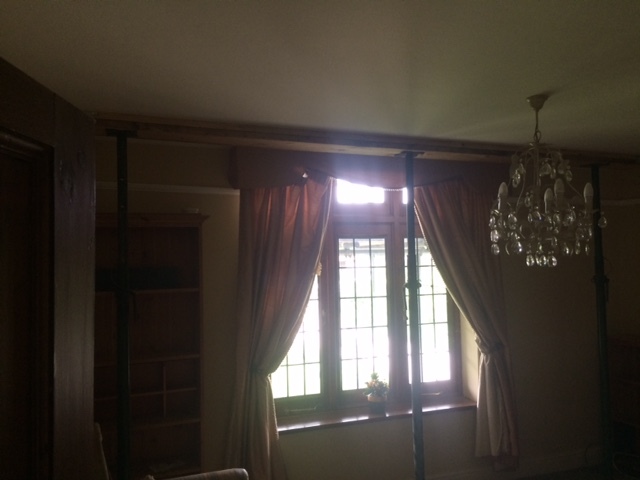 The vertical faux beams painted follow the frame but the diagonal "beam" doesn't. 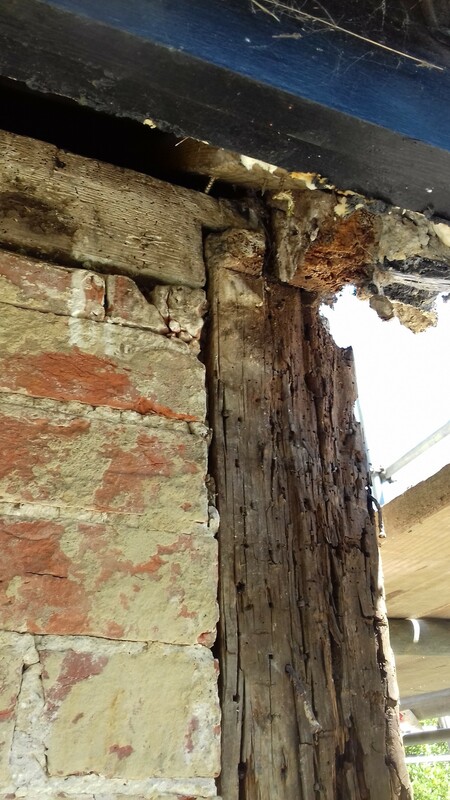 Shows how the bedroom floor-joists are supported partly by the brick infill and partly by decaying cross-beams. 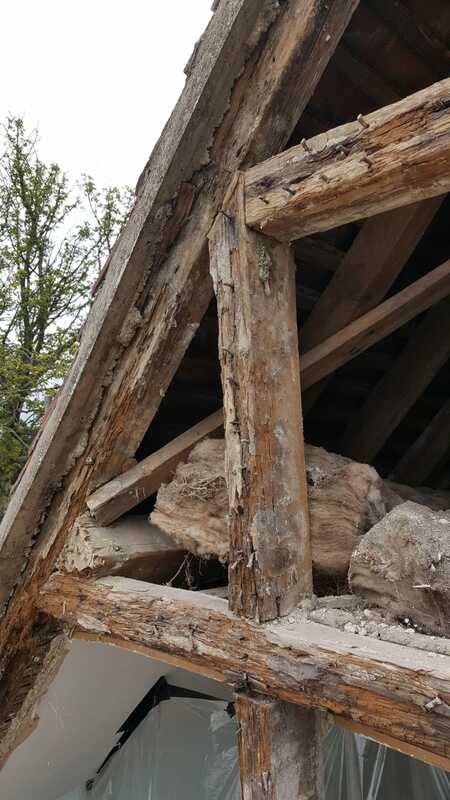 The diagonal beams in particular now compromise the stability of the structure. 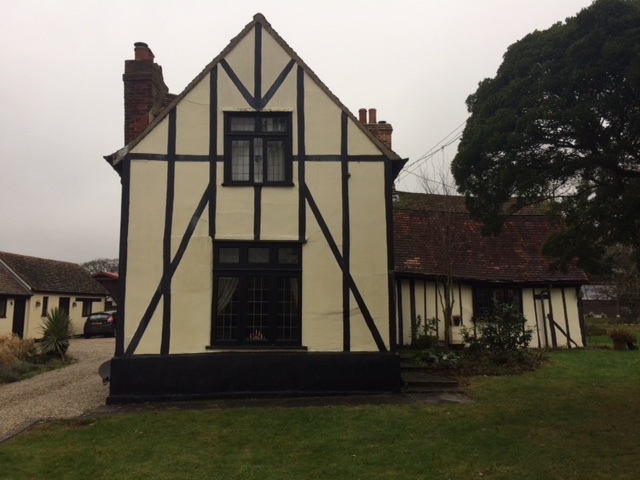 Wider view of adjacent left. 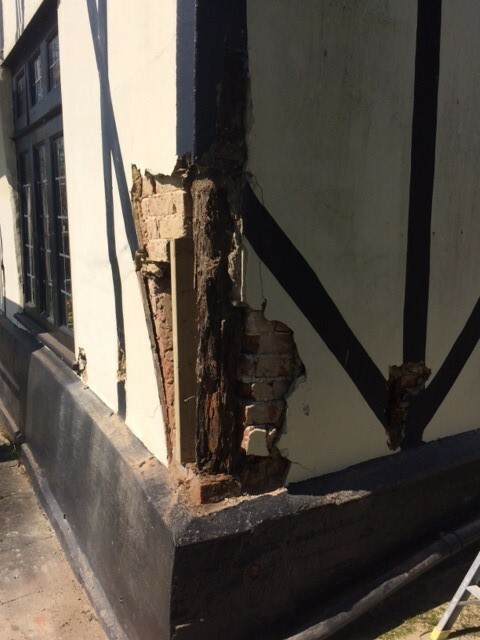 Side return showing some weakened infill to the left, and a large hunk that seems to have fallen off the front façade following removal of the render. 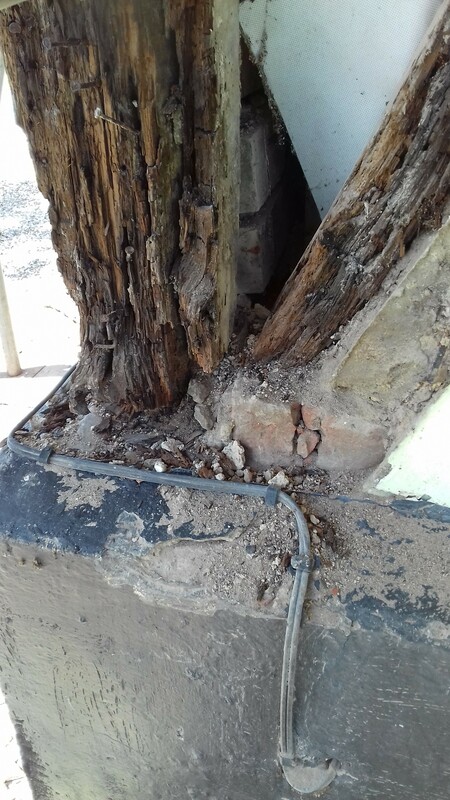 Initial consideration was given to future repairs to the rear of the property, which lets in water if the wind and rain are in the wrong direction. 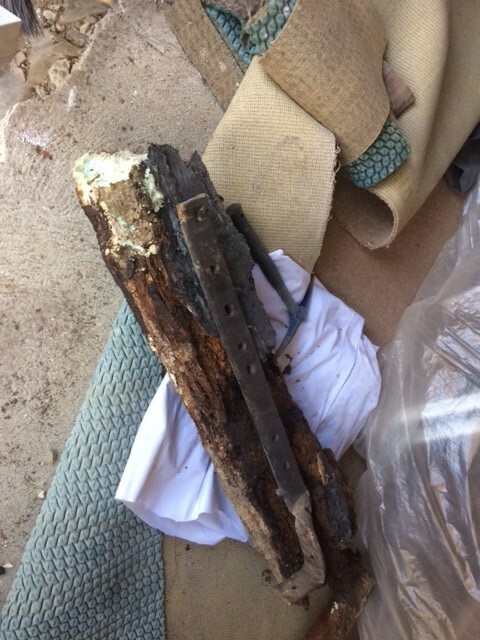 Shows some cracked plates, which were the obvious supects (though in fact probably innocent, as subsequent investigation showed they faced on to breeze blocks). 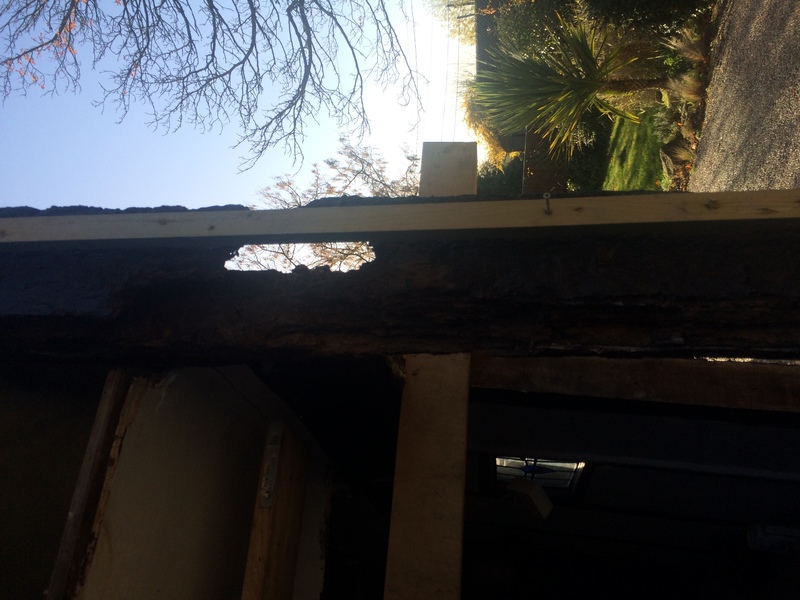 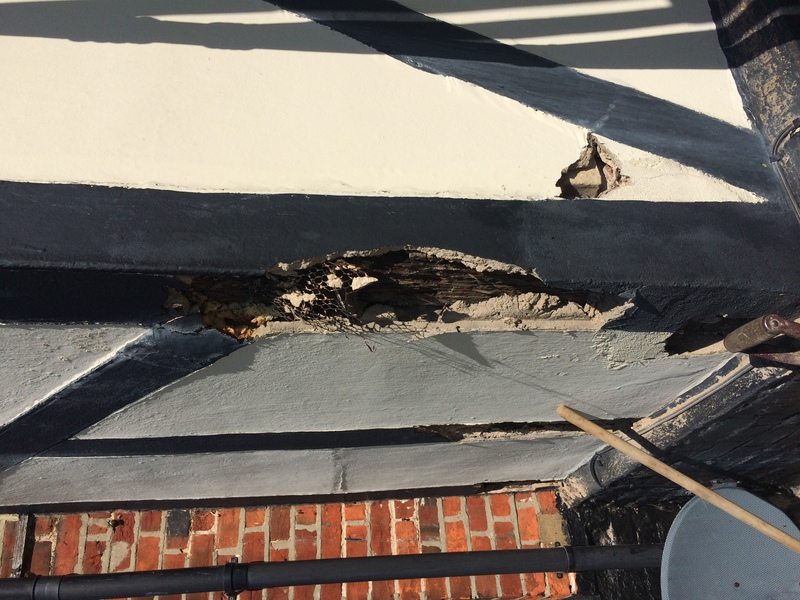 Shows the results of the initial investigative work undertaken to reveal the extent of the damage to the front of the property. 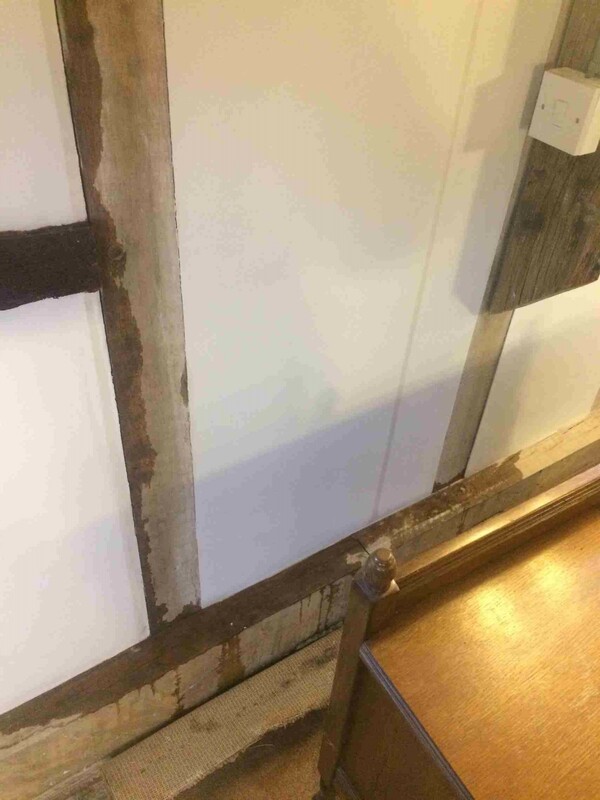 It showed that it was not an isolated problem with a single corner post, but appeared to be more pervasive. There was then a delay while consultation was undertaken with the Conservation Officer to authorise further - and necessarily more destructive - investigation to reveal the full scope of the problem. 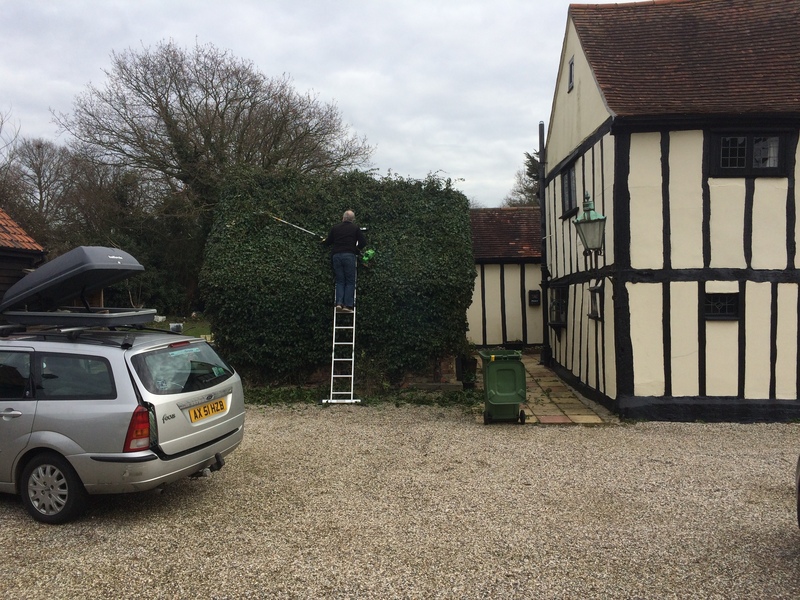 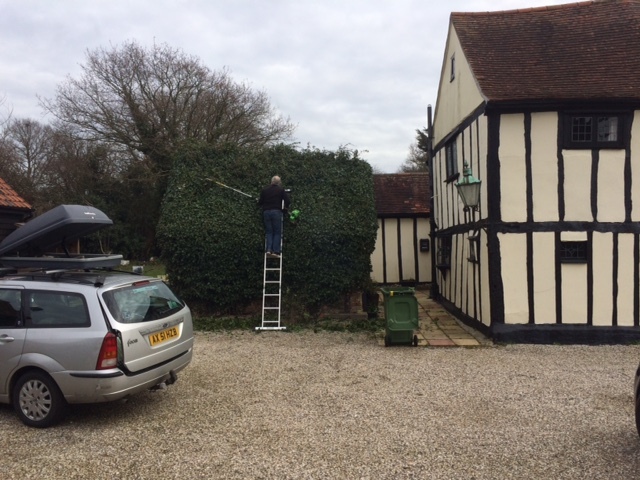 Nothing happening on the house, though the ivy-room got its annual haircut! 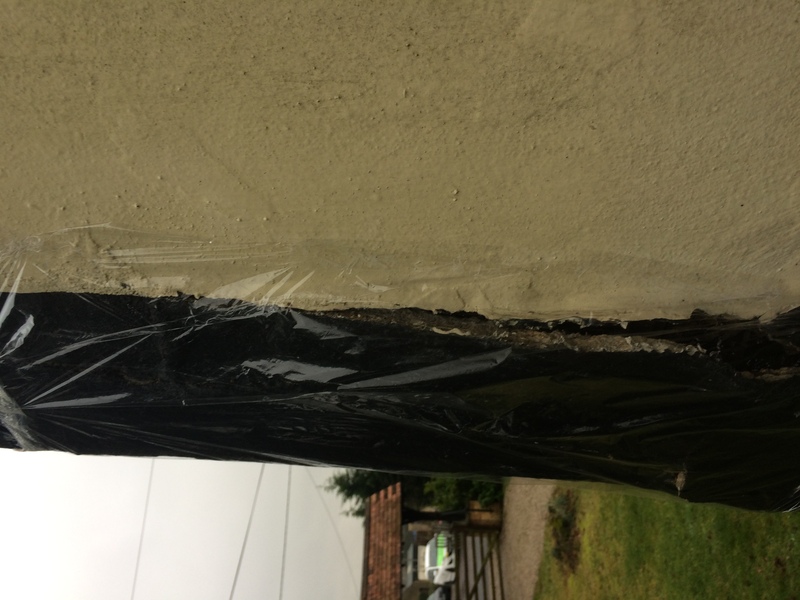 The initial problem with the front of the house: one small crack in the render covering the corner post. 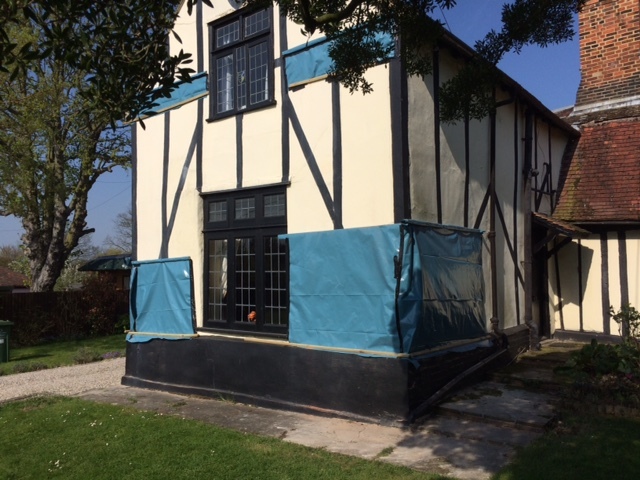 Covered up with cellophane and awaiting investigation. 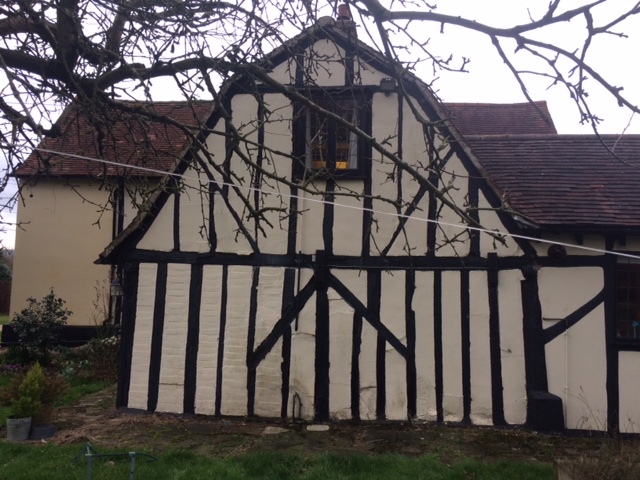 The front facade. 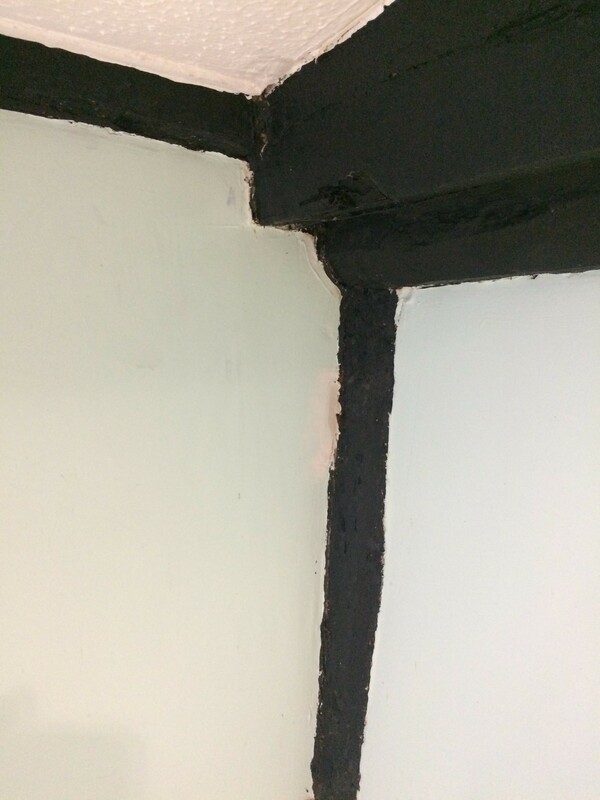 The faux beams are painted on, but roughly follow the underlying timbers. 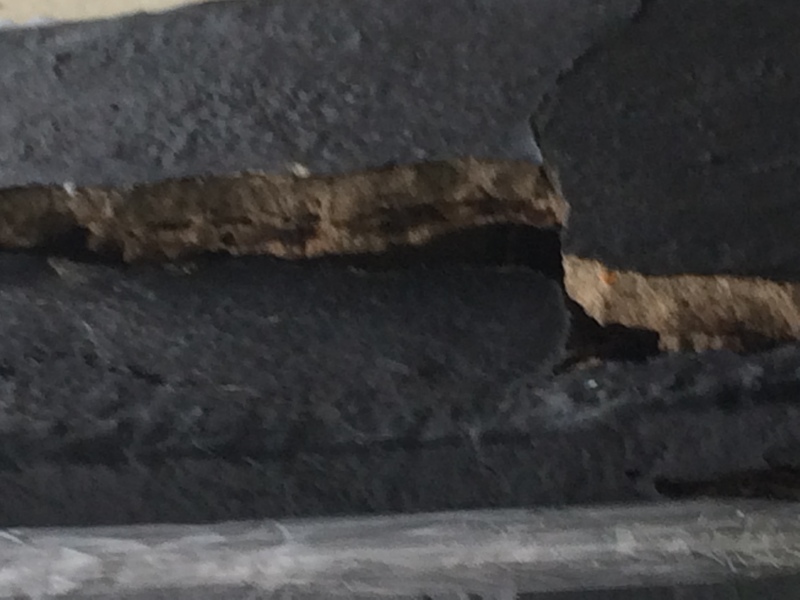 Close-up of the crack, showing the constitution of the render. 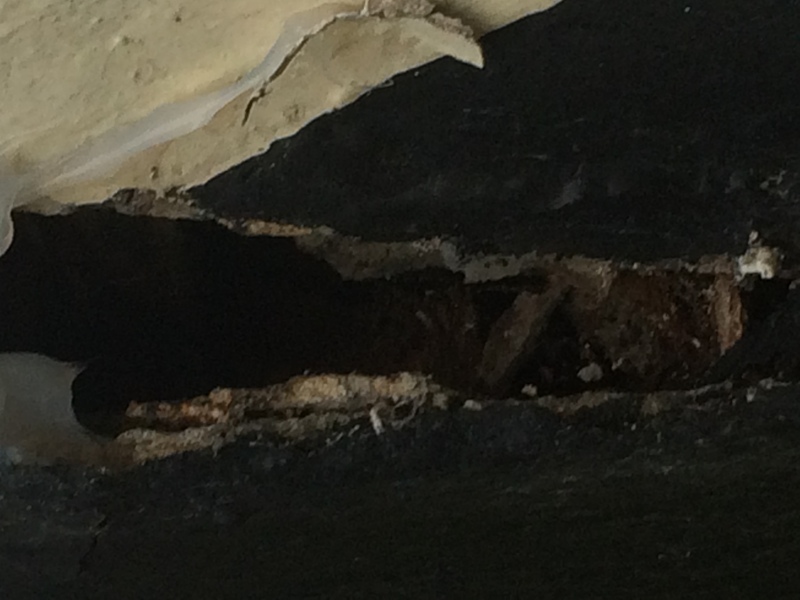 Close-up of the crack, showing the interior. I felt inside, and the wood was crumbly and soggy. 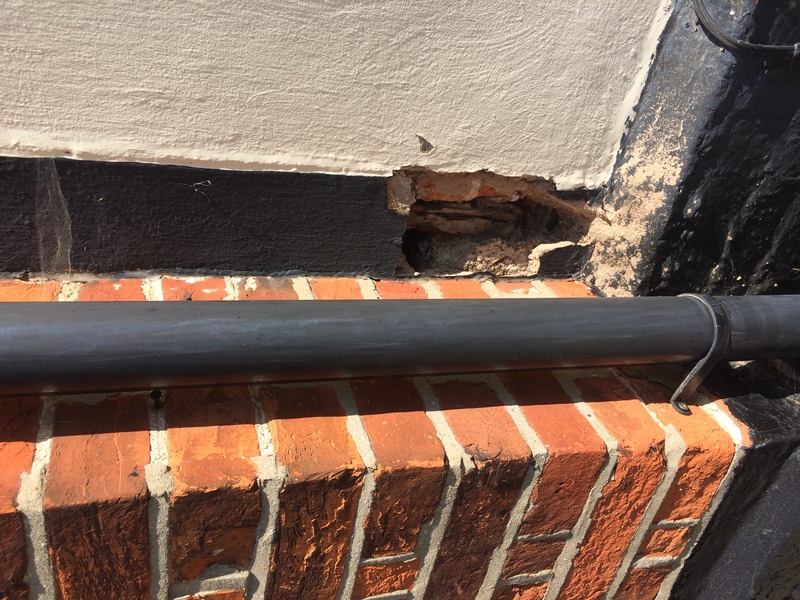 The context of the crack, which is in the right-hand corner post, showing some further cracking and bulging of the render. The plinth, showing no damage due to subsidence. 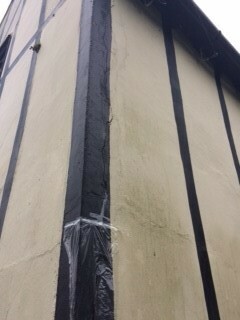 Another view of the crack, protected against the weather with a sheet of cellophane. 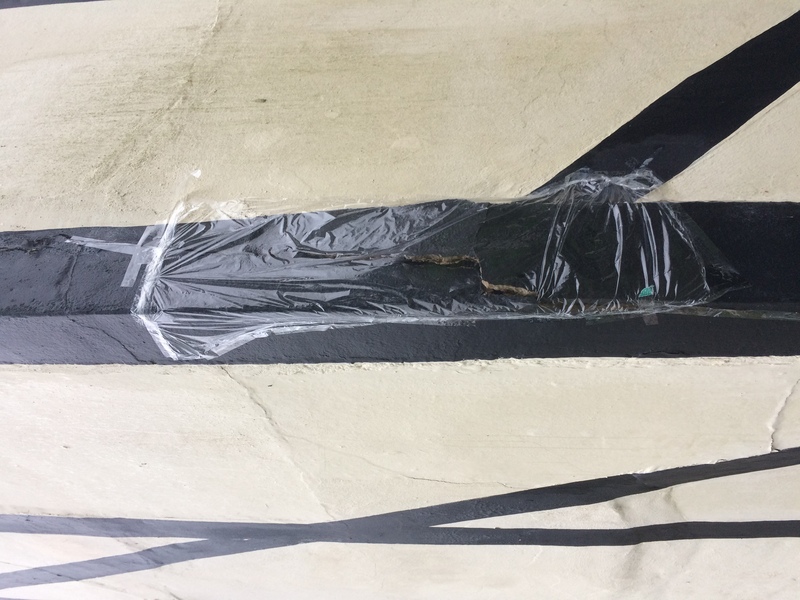 The crack, protected against the weather with a sheet of cellophane. 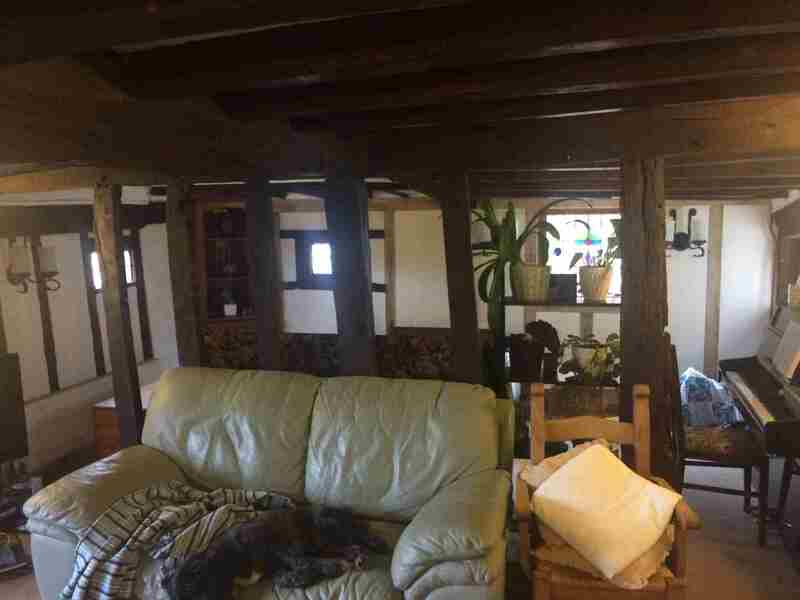 Timestamp: 07/04/2019 10:10:17. Comments to theo@theotodman.com.